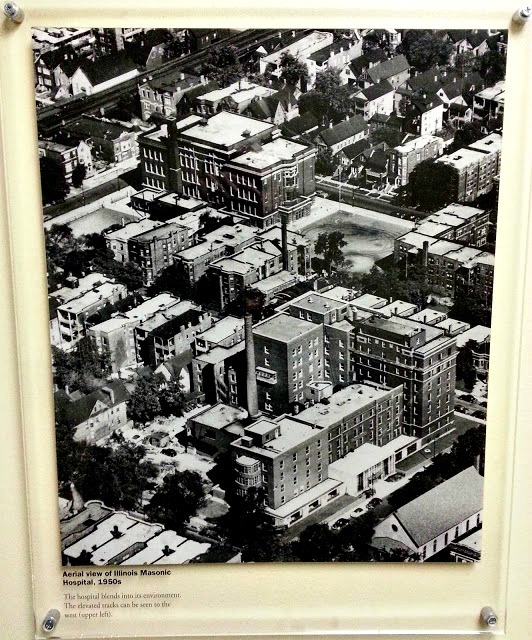 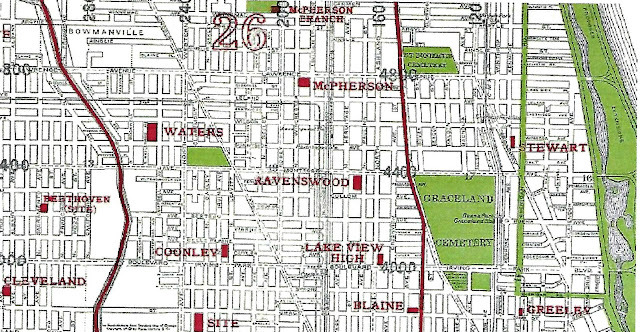 Lake View when it was a township, city, District of Chicago, and finally in one of the 77 'community areas' of Chicago. 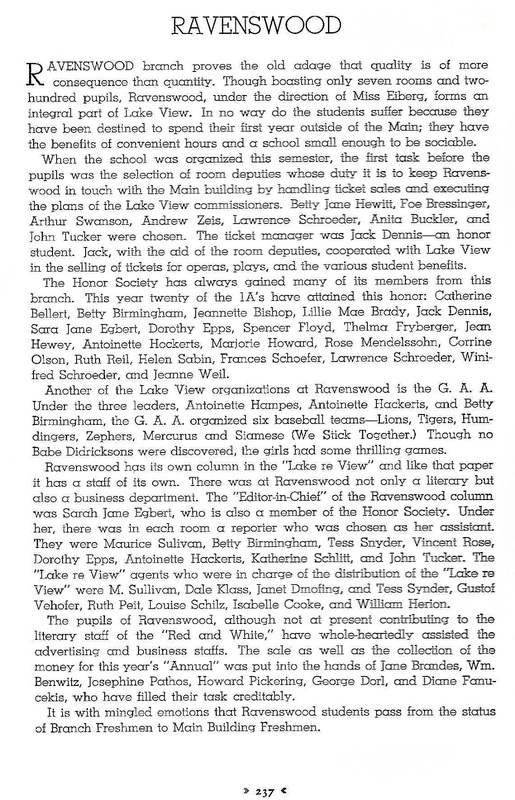 While most of the school mentioned in this post are in the community of Lake View some are near its border. 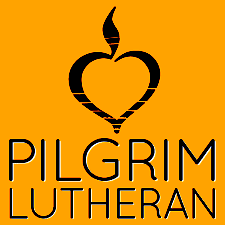 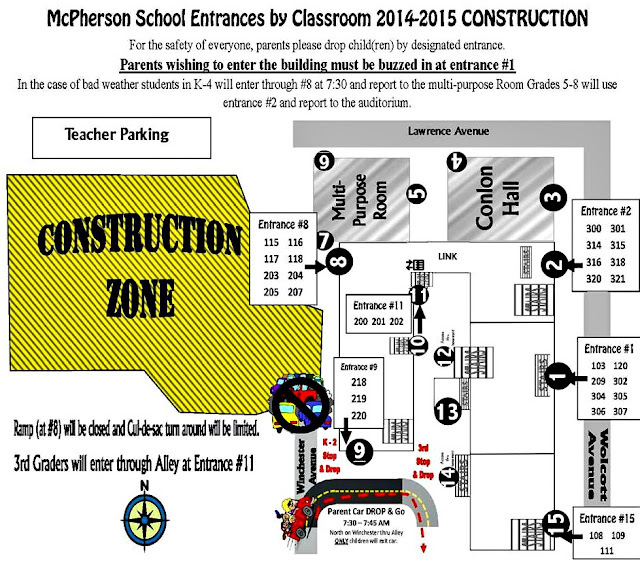 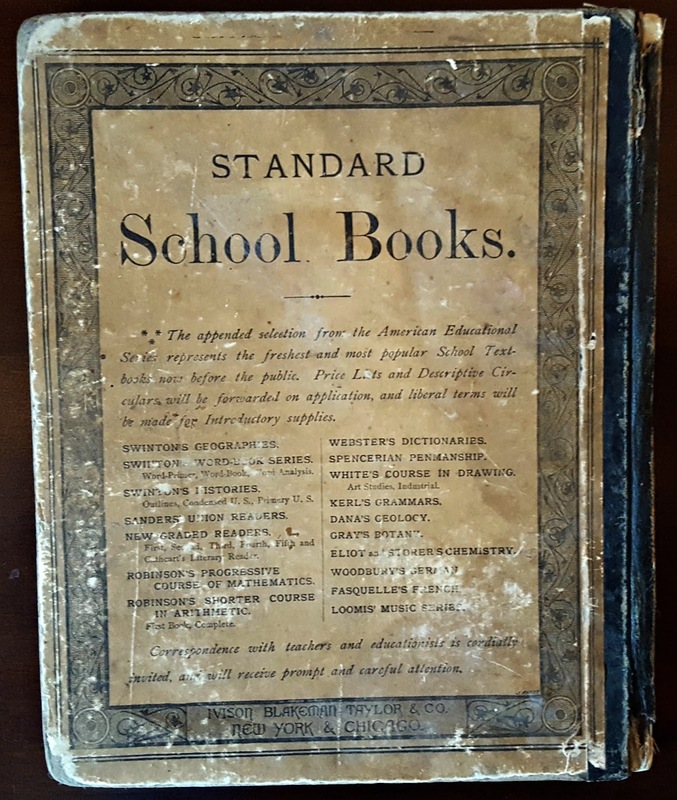 This post will be divided in two sections - tradition public schools and nonpublic (parochial and independent) schools. 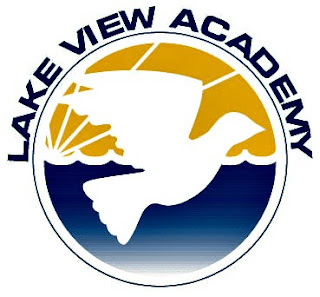 Another post is almost exclusively devoted to the only high school within the neighborhood that spans through the generational evolution's of old Lake View - Lake View High School. 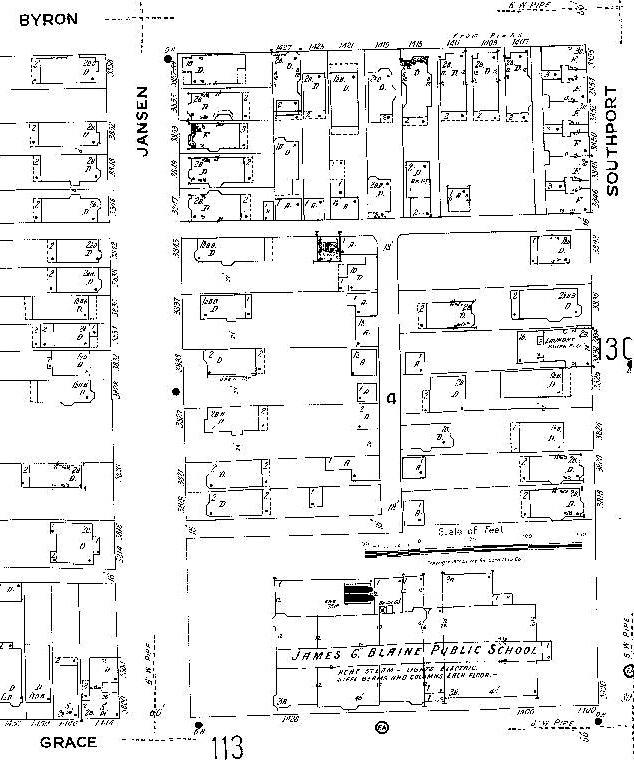 1905 was most of Howard Street. 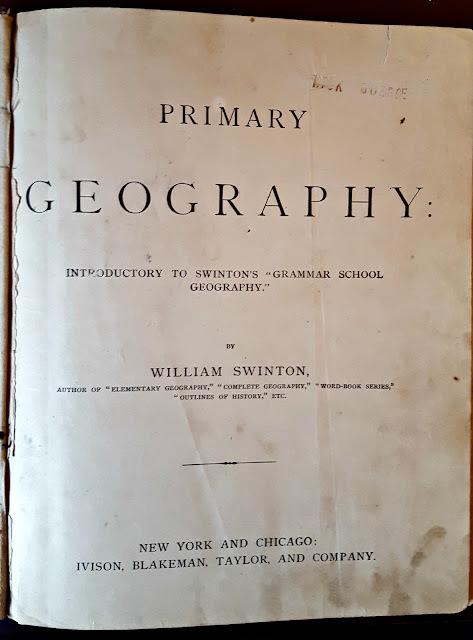 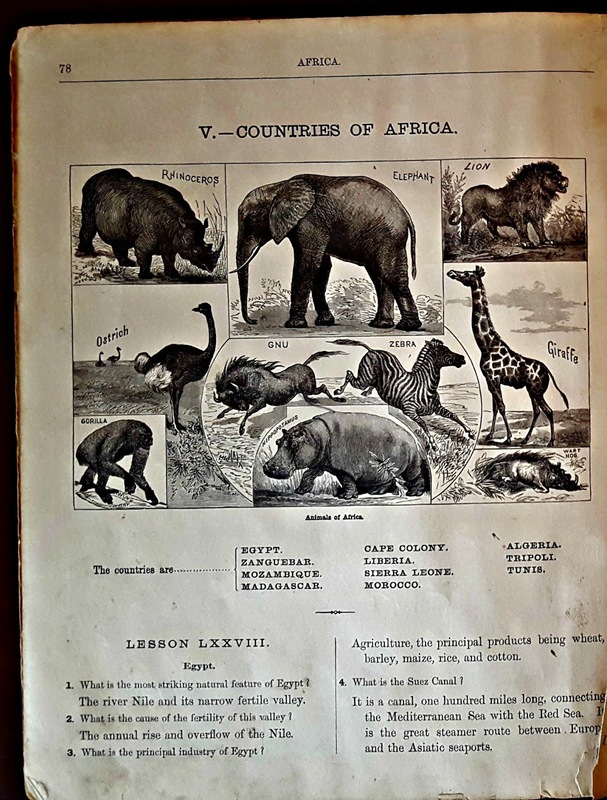 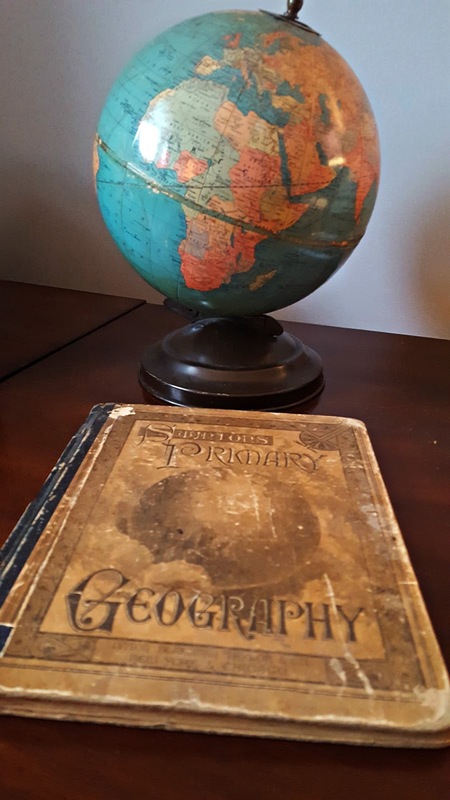 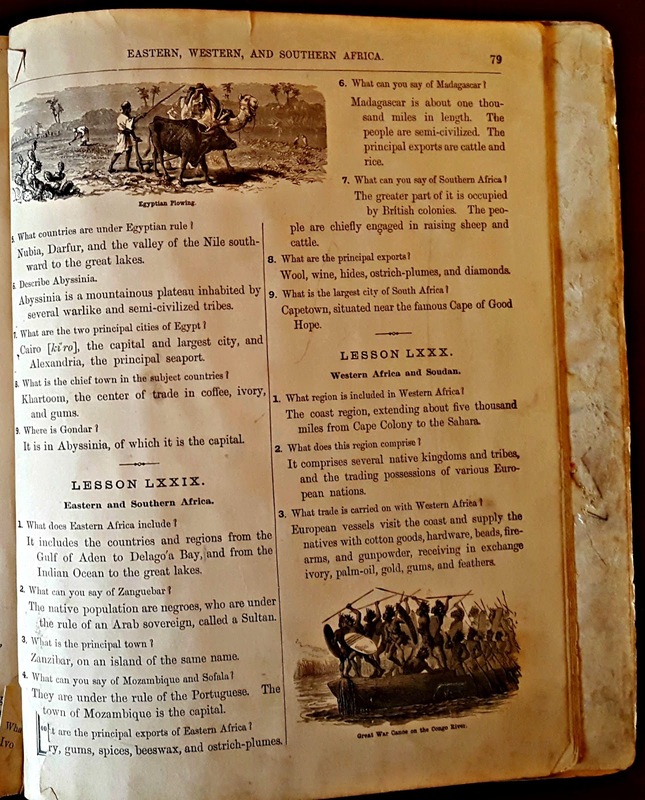 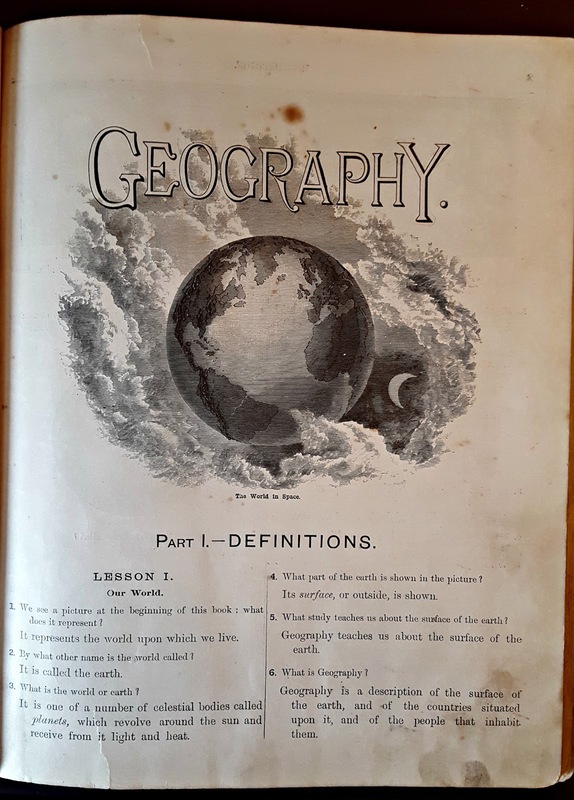 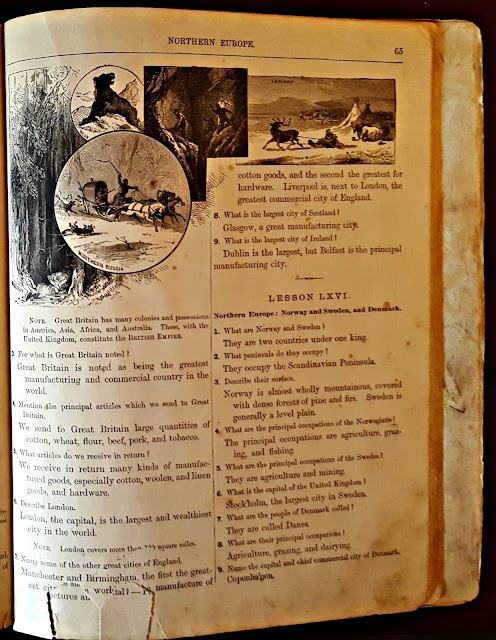 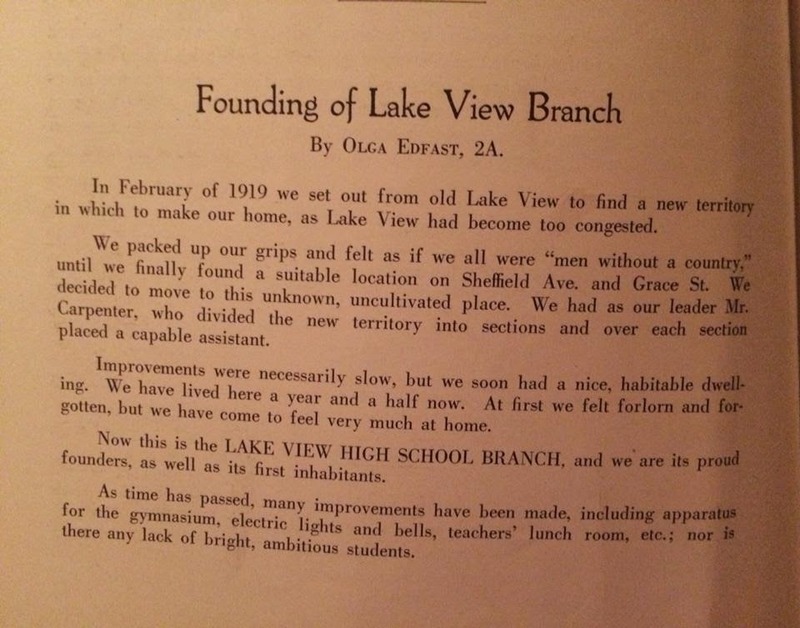 "Lake View is as well supplied schools of a high grade as any town in the notwithstanding which fact there are over one children unable to obtain schooling because of the condition of the eight buildings which their more fortunate comrades. The school board trustees are as follows John N Hills president Franz Baer and A.S. Maltman Seth F. Hanchett secretary and treasurer School No 1 is situated Evanston Avenue corner of School. 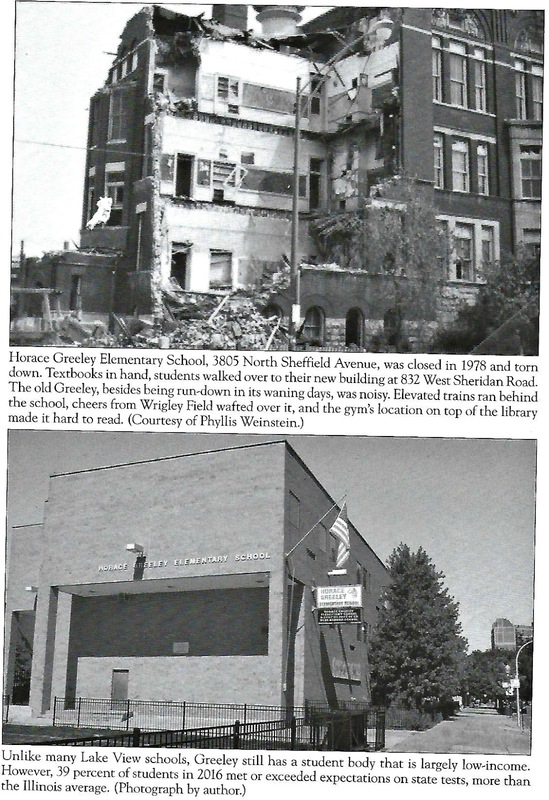 The building is over twenty years old but the main of the two story brick structure was erected in. 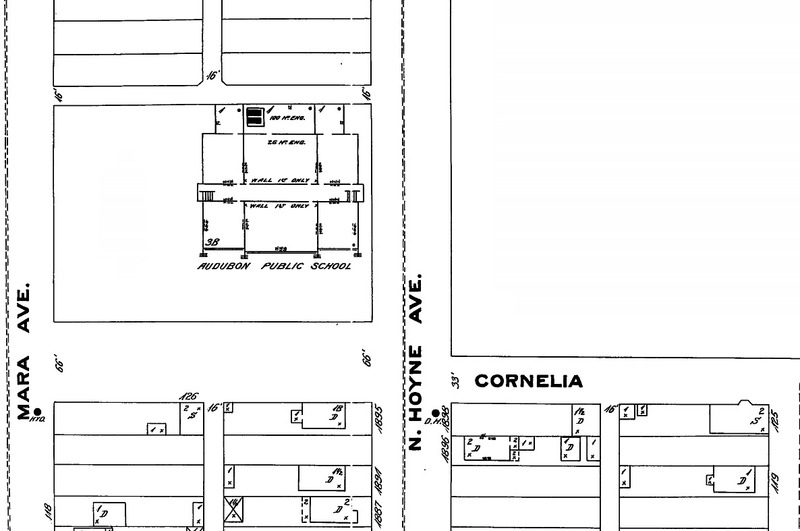 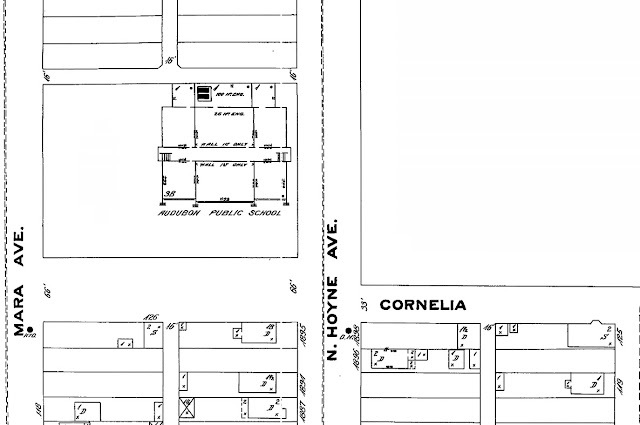 The property is valued at $22,000 Amelia Holcomb principal of No 1 [and] School No 2 is located on Diversey Street corner Seminary Avenue the building a two story brick edifice. In 1878 a four room building was erected and 1882 the accommodations were increased two rooms. 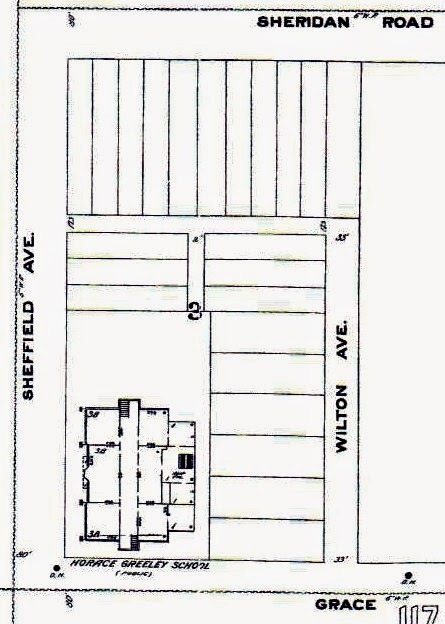 The school house is one of the most substantial in the town value of property $45,000. 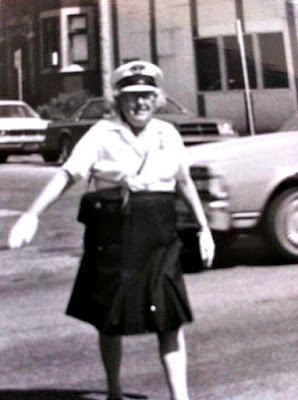 Lena Troendle as 1st principal. 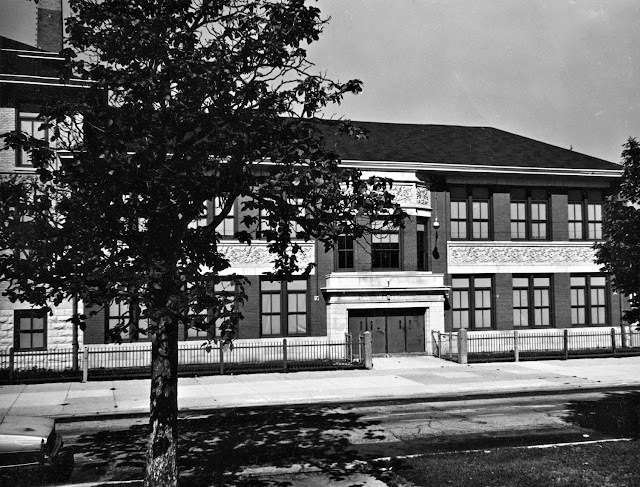 School No 3 corner of Wrightwood Avenue and was erected in 1882 the pupils being under the [care] of Margaret Fitch. School No 4 corner of Orchard and Wrightwood has eight rooms and is one of the finest district school buildings in the county. 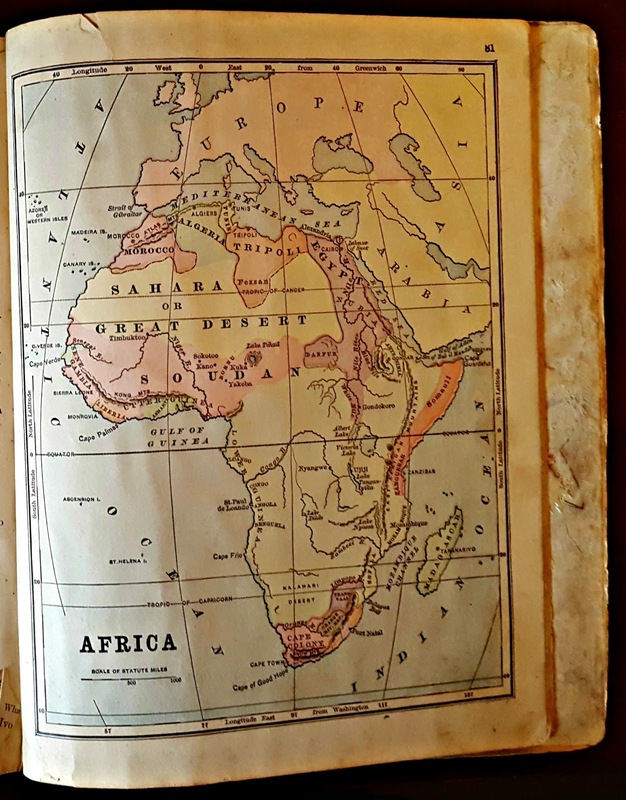 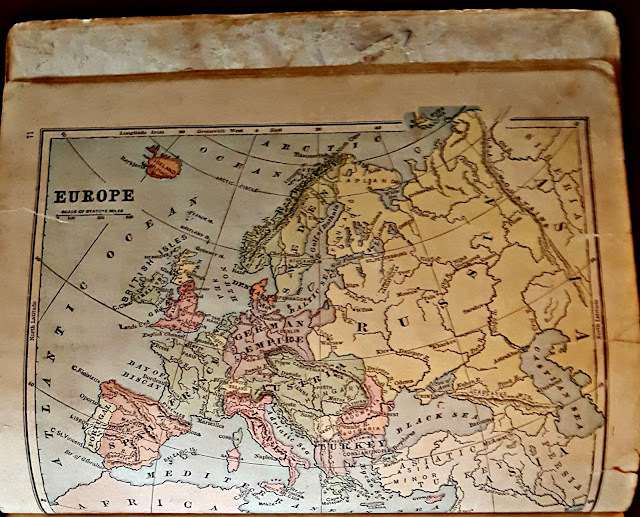 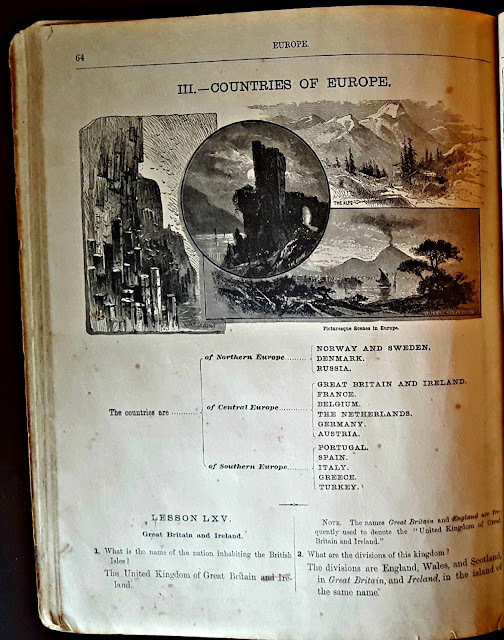 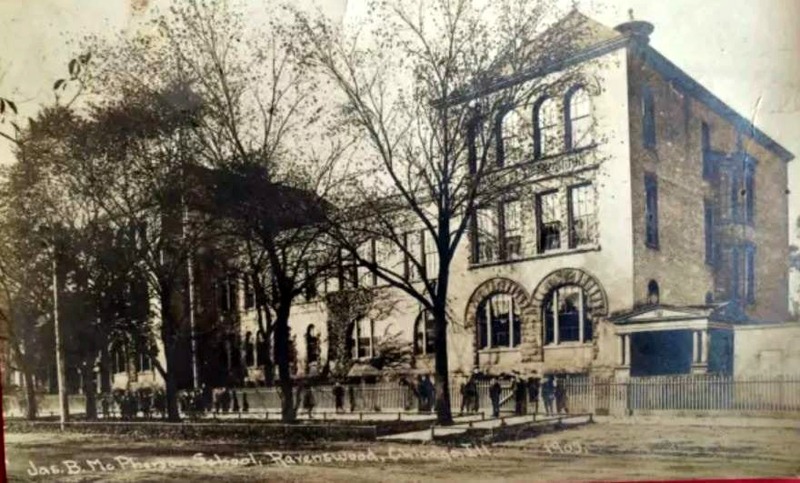 It was completed year 1883 and with the site is valued at $22,000. 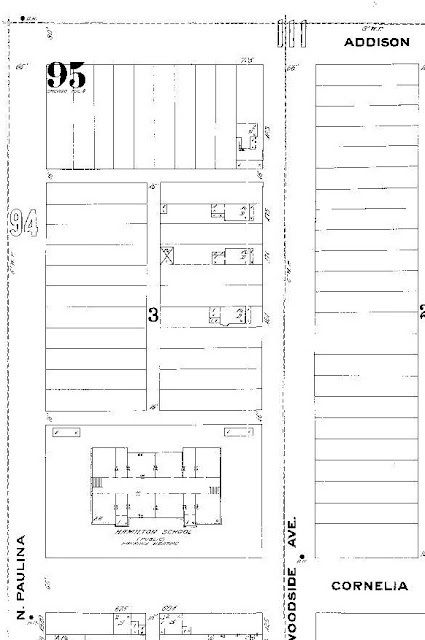 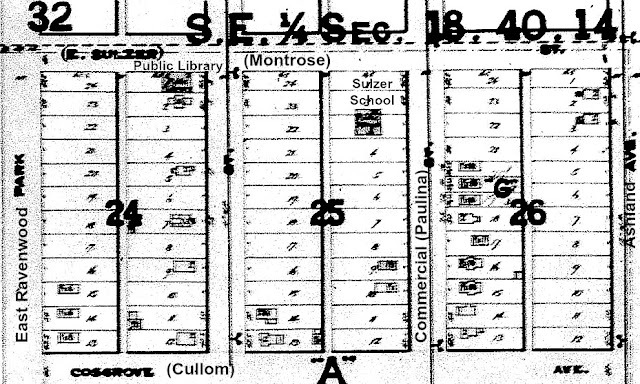 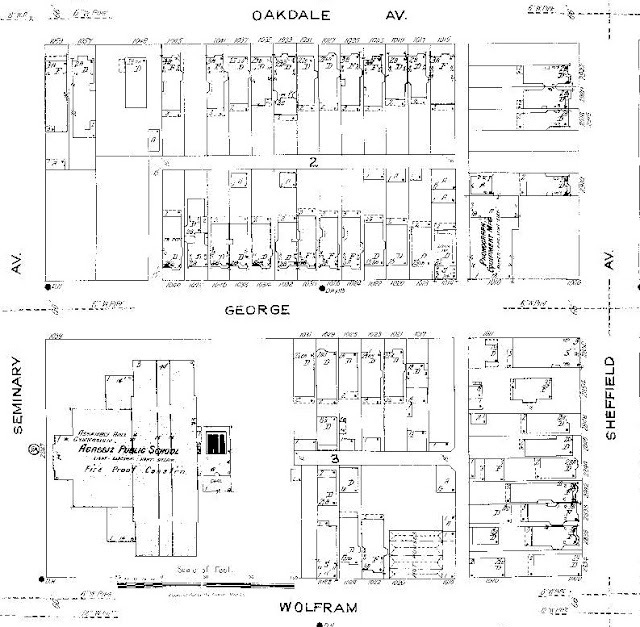 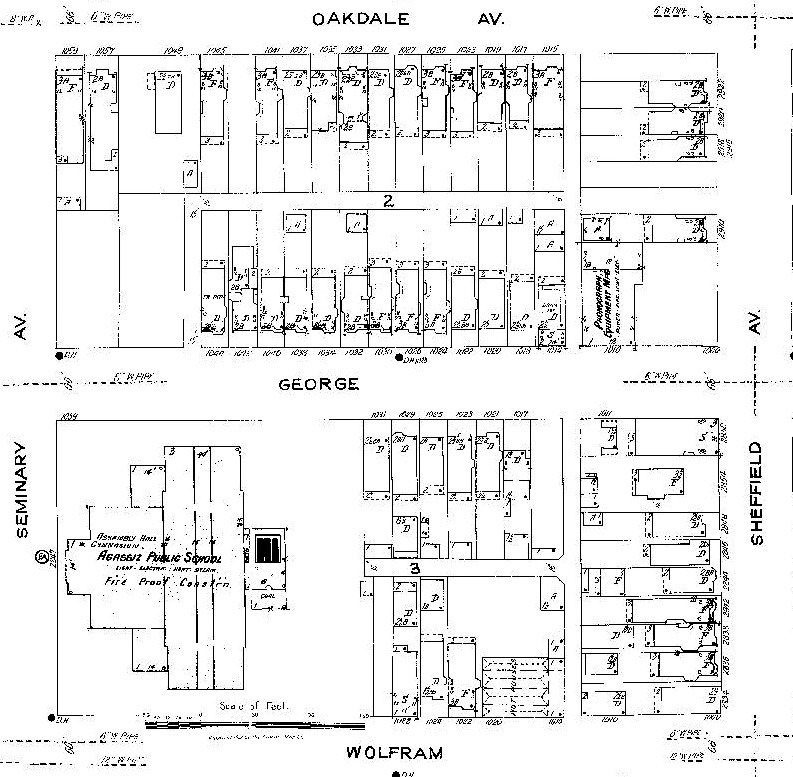 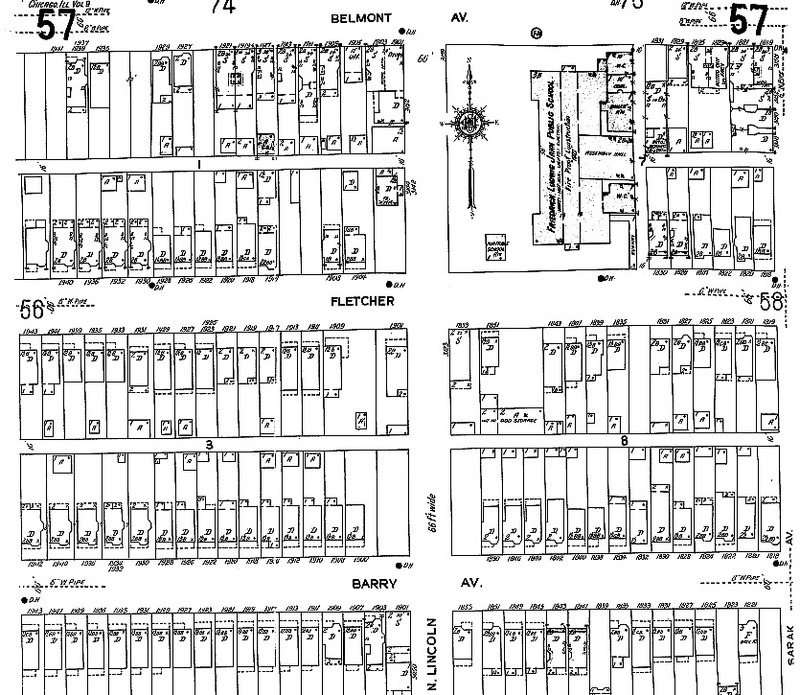 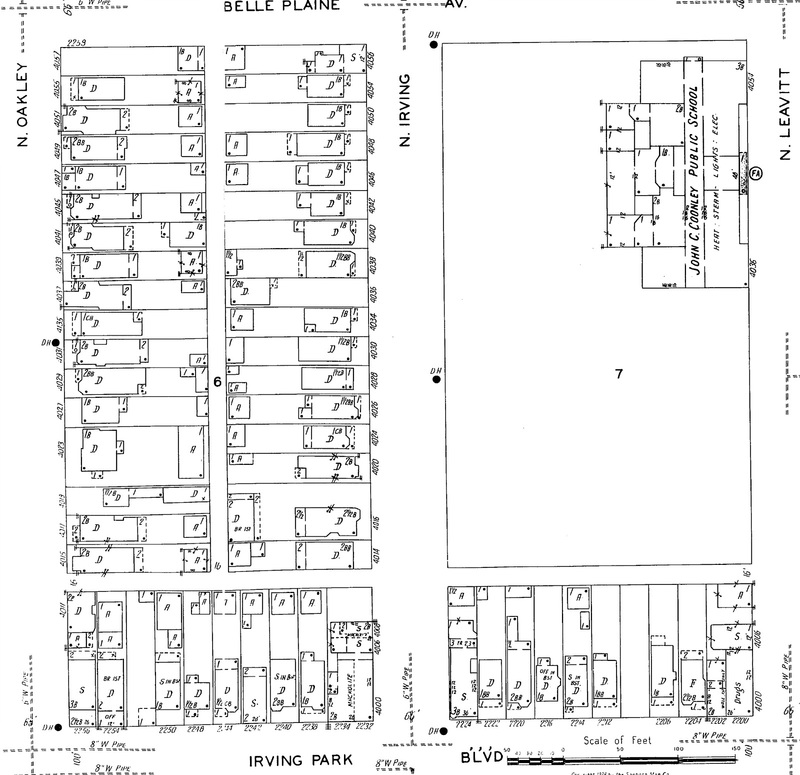 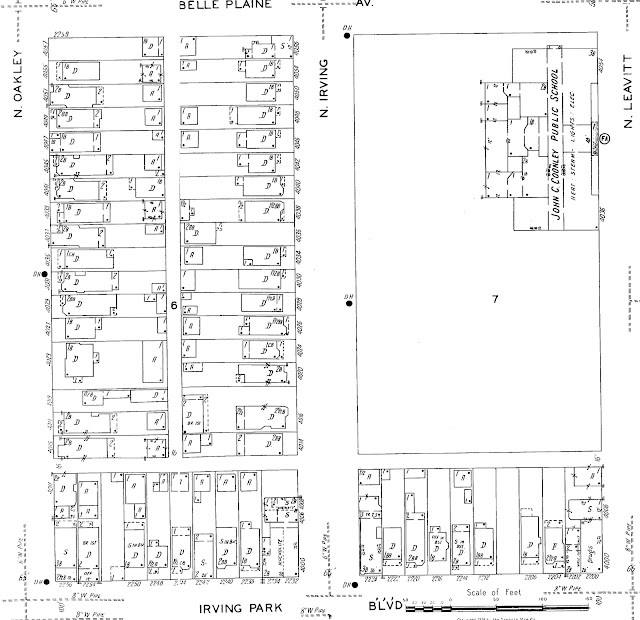 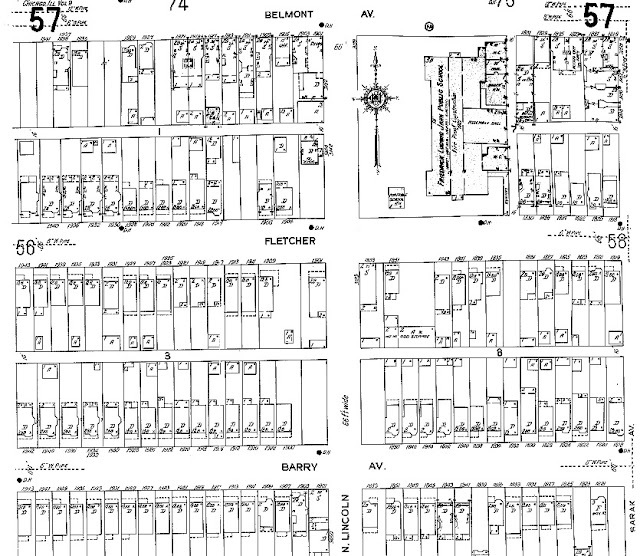 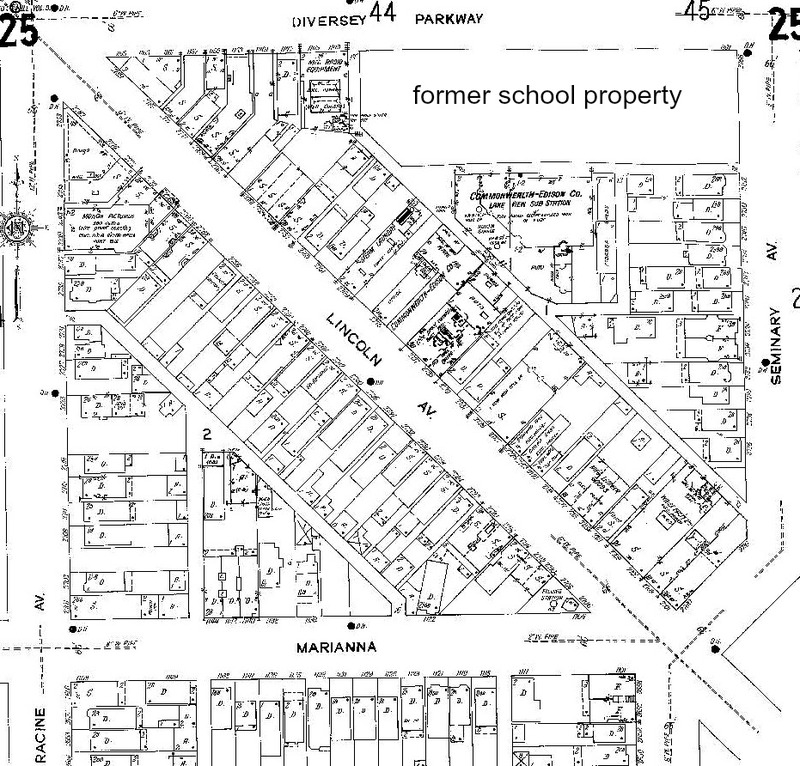 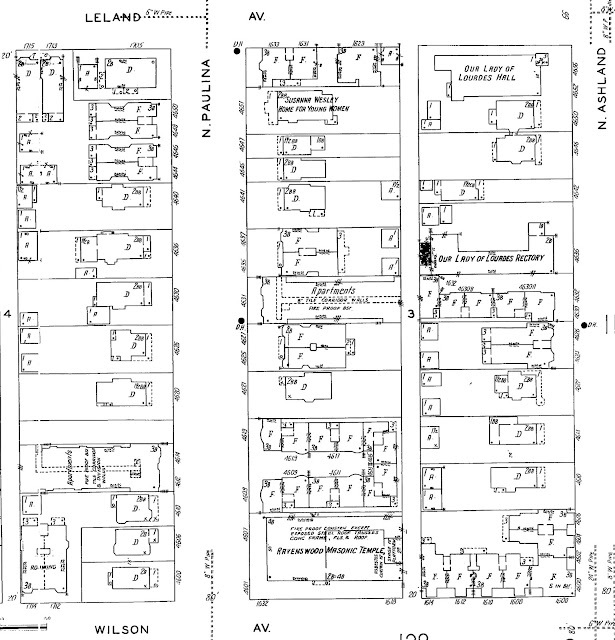 E Williams has been transferred as principal No 3 to the same position in No 4 [and] No 5 school building on Belmont Avenue near has three rooms and was removed being the frame structure occupied as No 2. 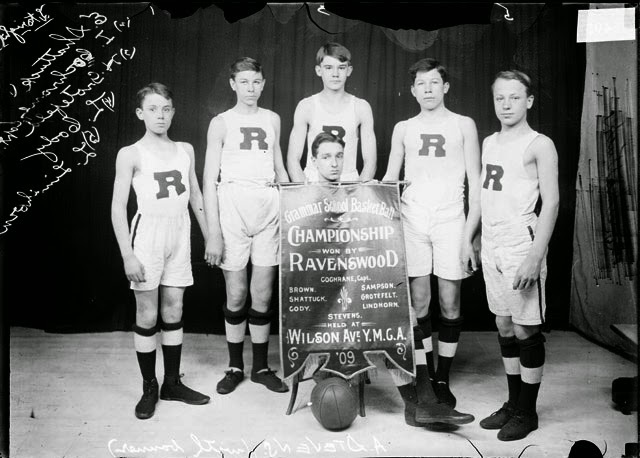 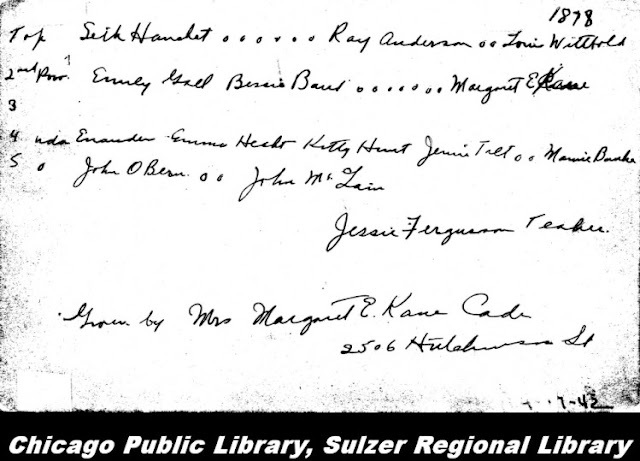 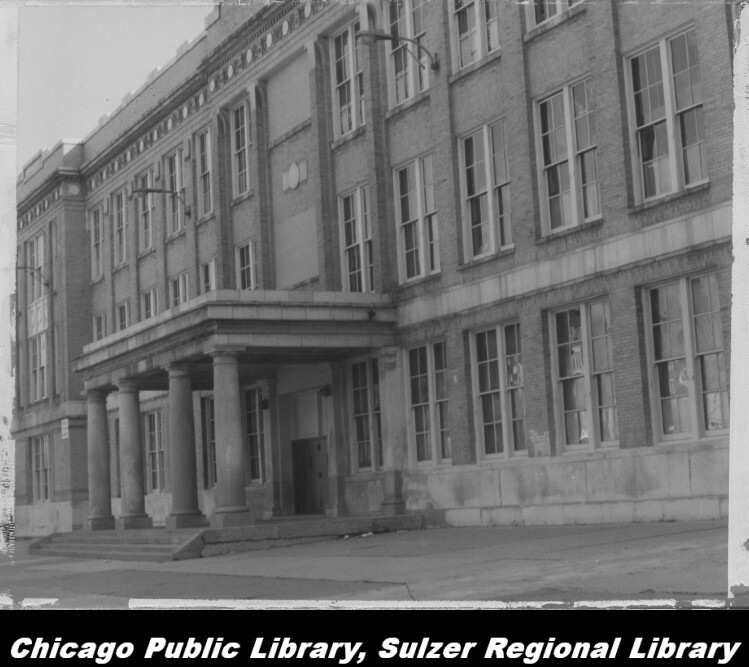 In addition to the above there is a branch primary at Ravenswood known as Ravenswood School I [on the] corner of Sulzer and Paulina Streets. 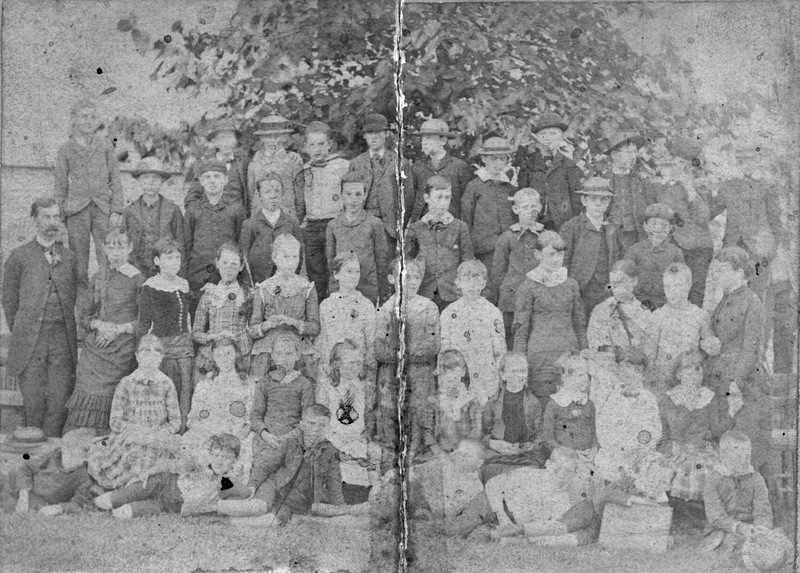 JF Kletzing principal an ungraded school at Andersonville by Mrs Mary W Jackson and the Rose Hill the brick building being erected in 1882 and the pupils taught by Mr Williams. 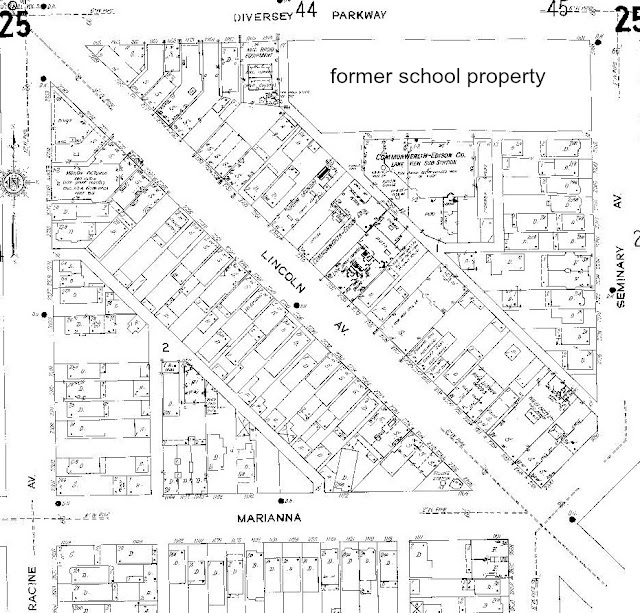 The five most important schools of the town are in No 1 the total value of the property being [??]. 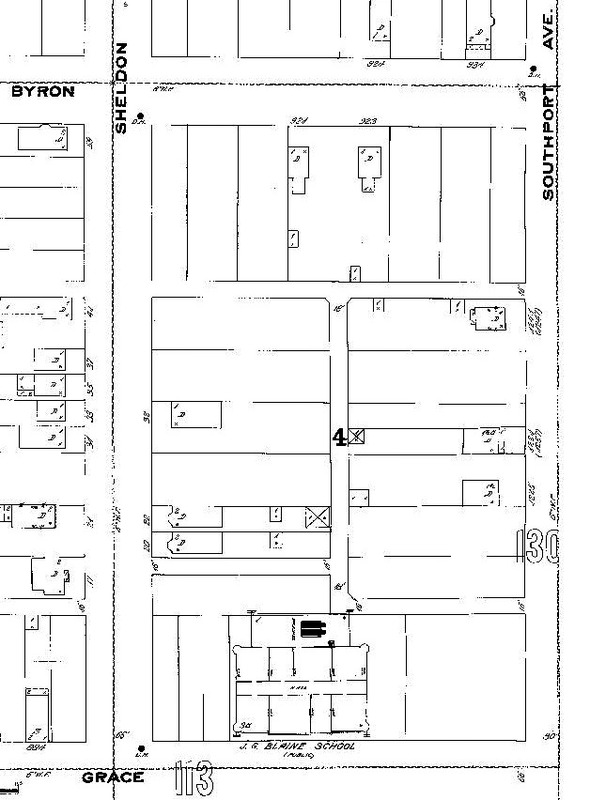 The bonded debt is $89,000. 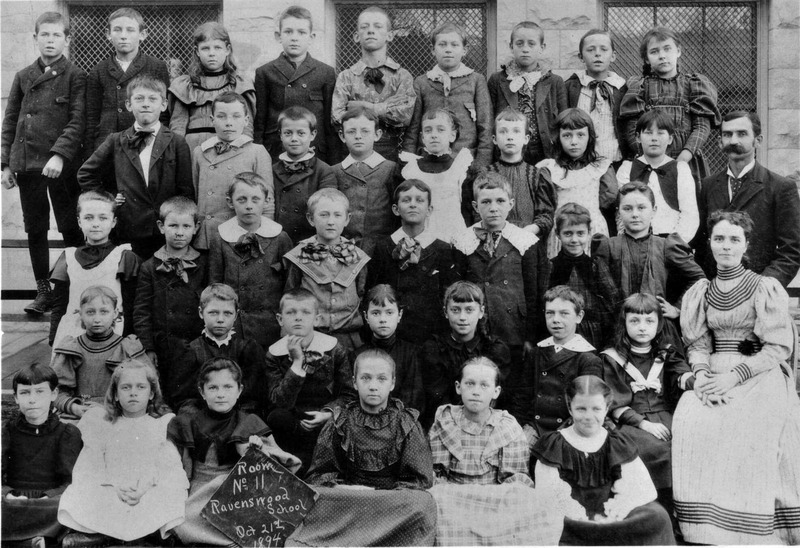 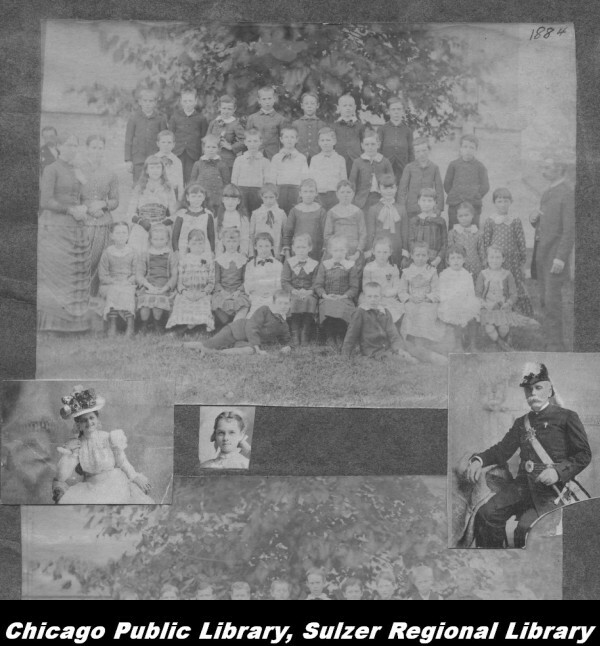 [The] school population in June 1883 3,305 number of children 4,665 population 2,824. The total population of the town is 19,000." 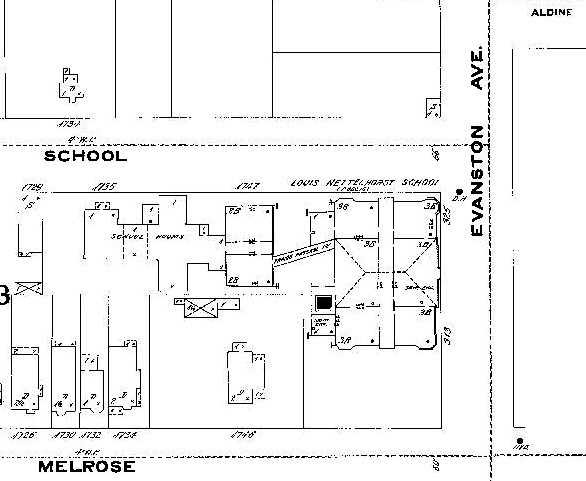 School No 1 (Nettelhorst) is situated on Evanston Avenue corner of School [Street] (School Street extended east to the existing shoreline at that time). 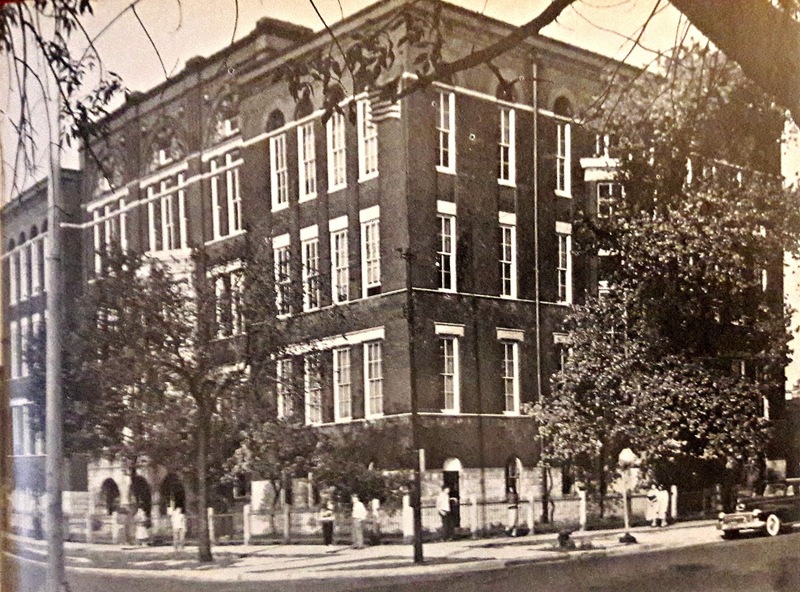 The original building is over twenty years old but the main portion of the two story brick structure was erected in 1879 The property is valued at $22,000 Amelia Holcomb is principal. 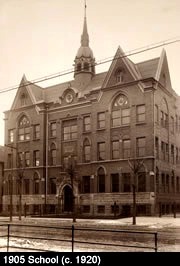 School No 3 (Prescott) corner of Wrightwood & Ashland and was erected in 1882 with the pupils being in the care of Margaret Fitch. 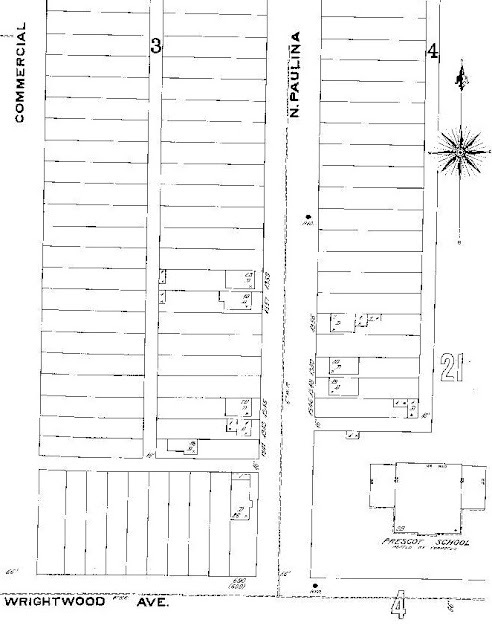 The value of the property $18,000. School No 4 (Alcott) corner of Orchard and Wrightwood avenues has eight rooms and is one of the finest district school buildings in the county. 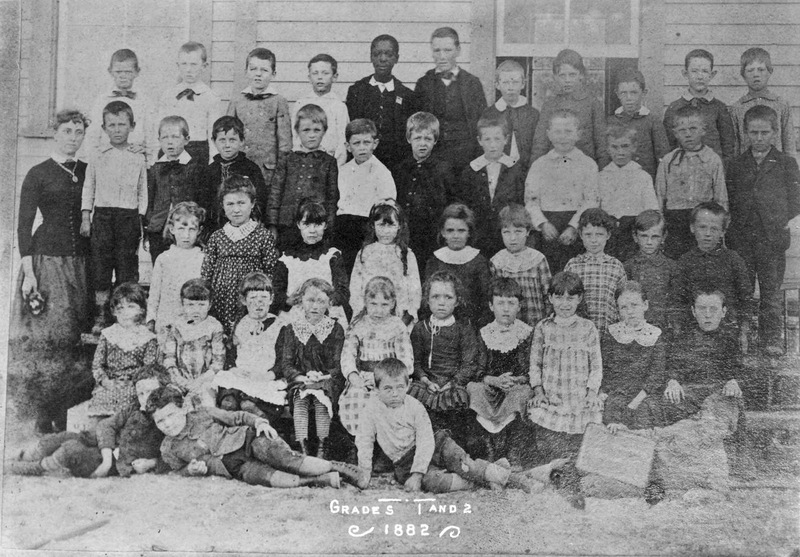 The school building was completed last year 1883 valued at $22,000. 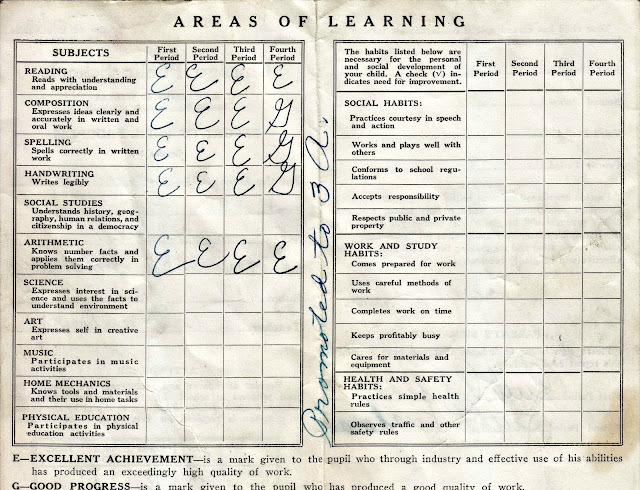 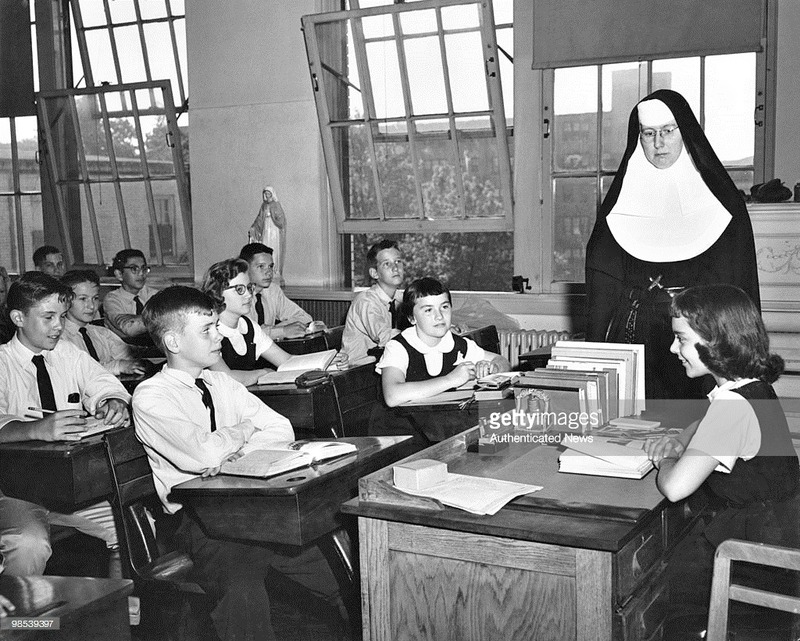 Gertrude E Williams has been transferred as principal from No 3 to the same position in No 4. 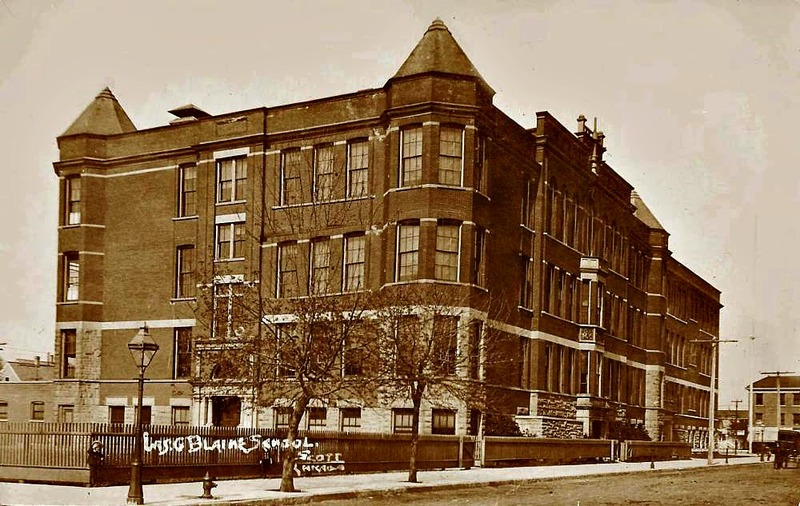 School No 5 building on Belmont near Hoyne avenue has three rooms and was removed, being old frame structure, occupied [now know] school No 2. 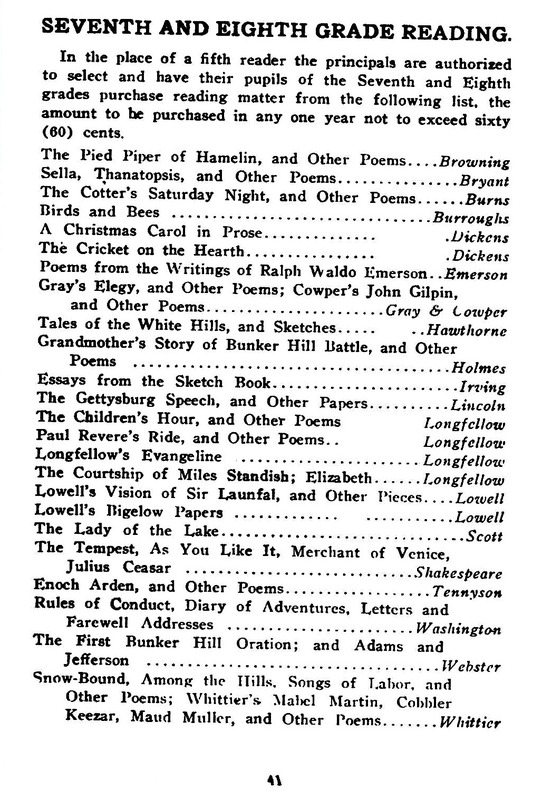 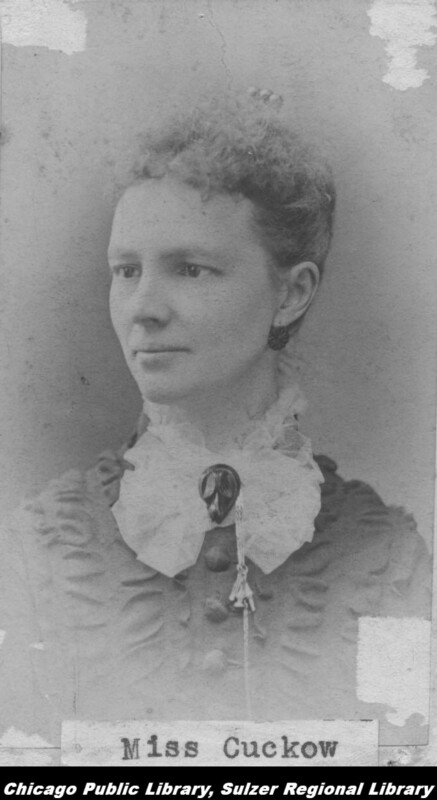 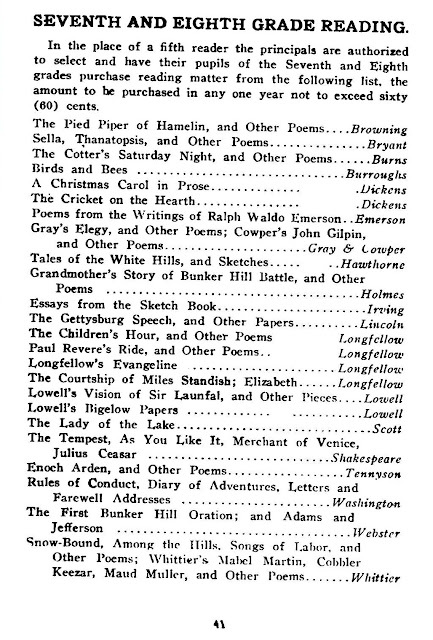 [with] Miss A.T. Shockley [who] keeps the scholars in hand. 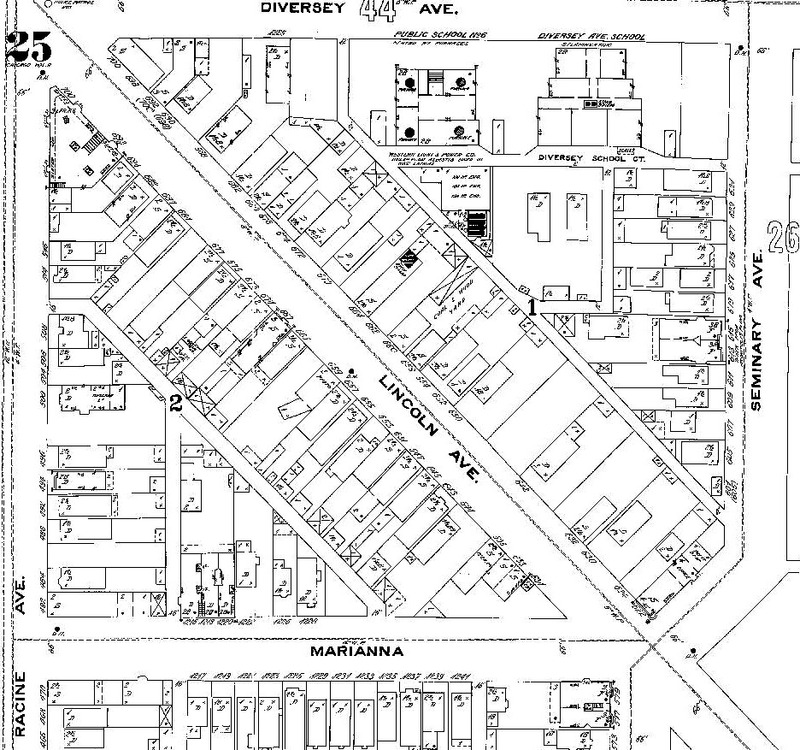 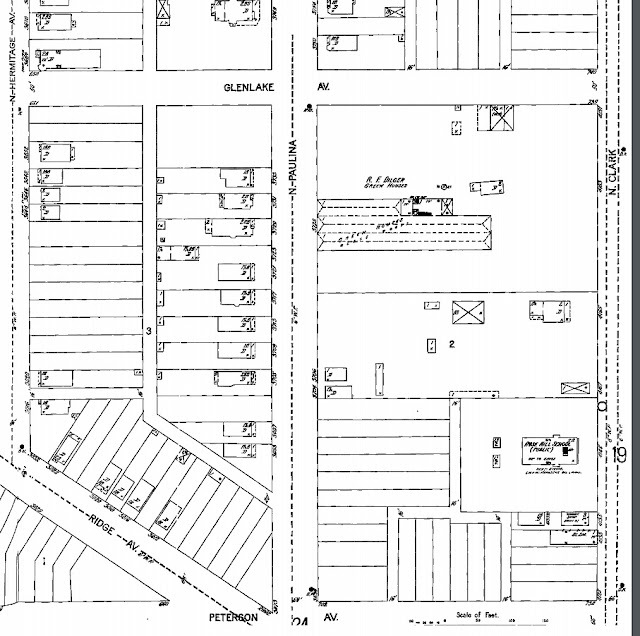 This 1894 Sanborn Fire Map indicates a school #6 on Diversey just west of Seminary with a broader view below and not mentioned by Andreas. 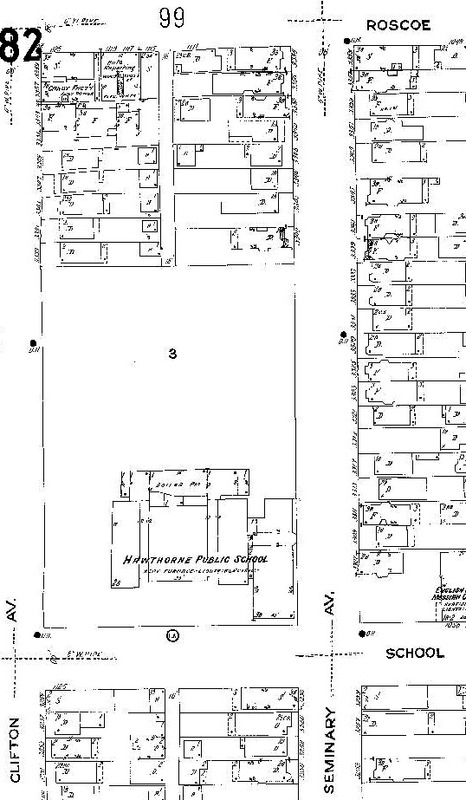 This school was also known as the meeting place for the township citizens who discussed the establishment of the township. 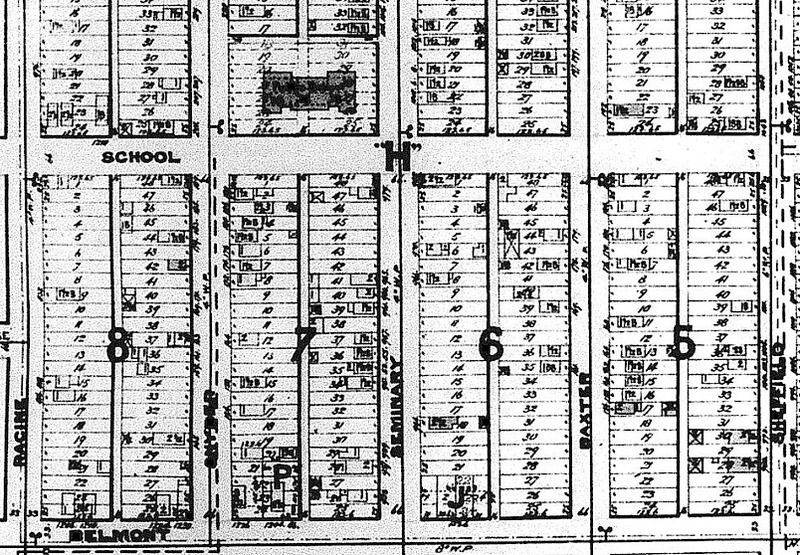 The township was granted township status by the State of Illinois by 1857. 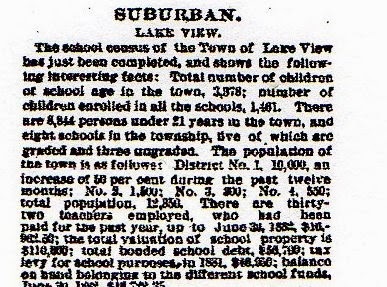 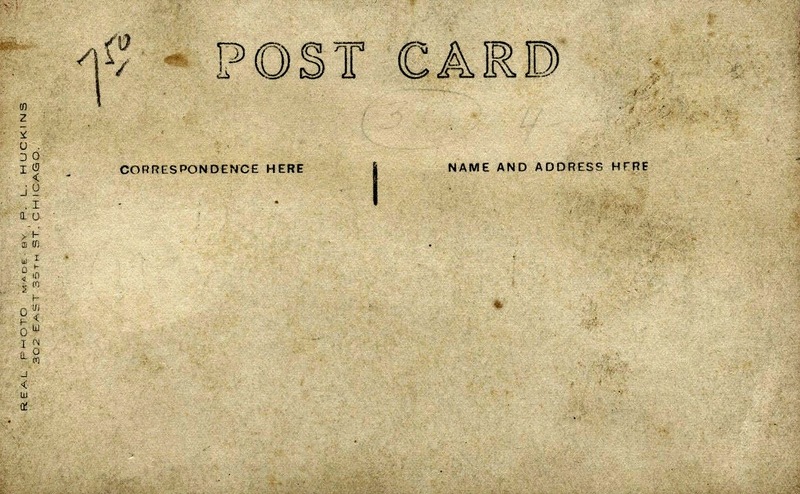 This status would change in 1887 when the township became a city. 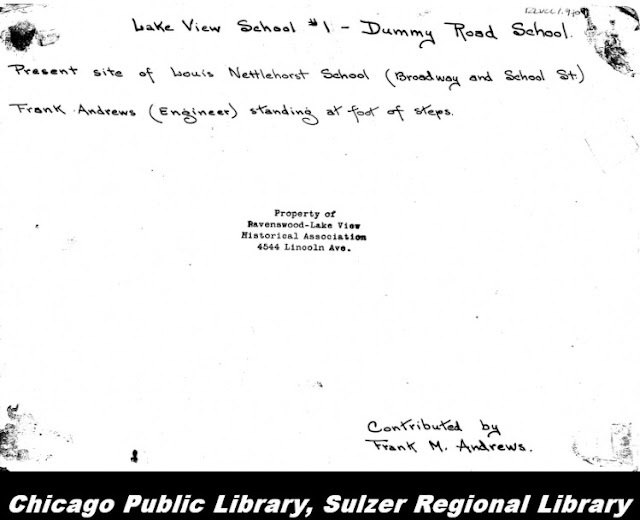 Two years later the citizens of the City of Lake View voted for annexation. with an 'E' not an 'O'. 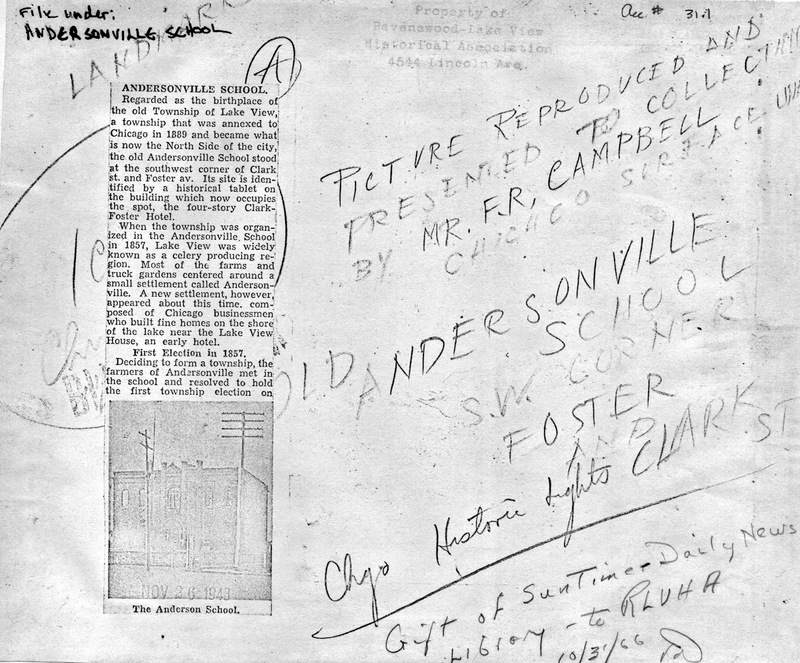 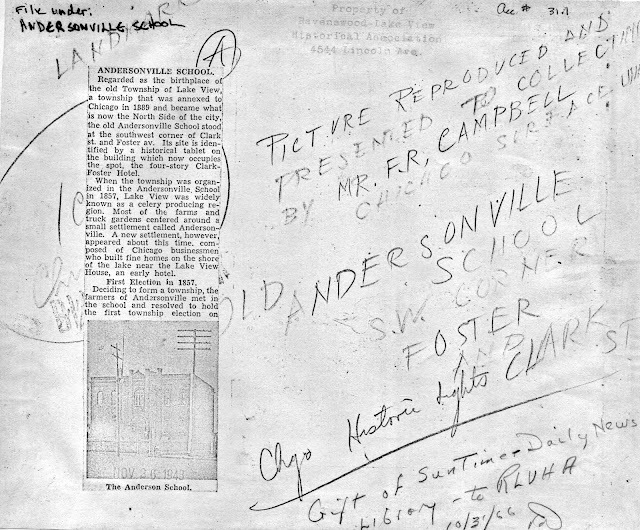 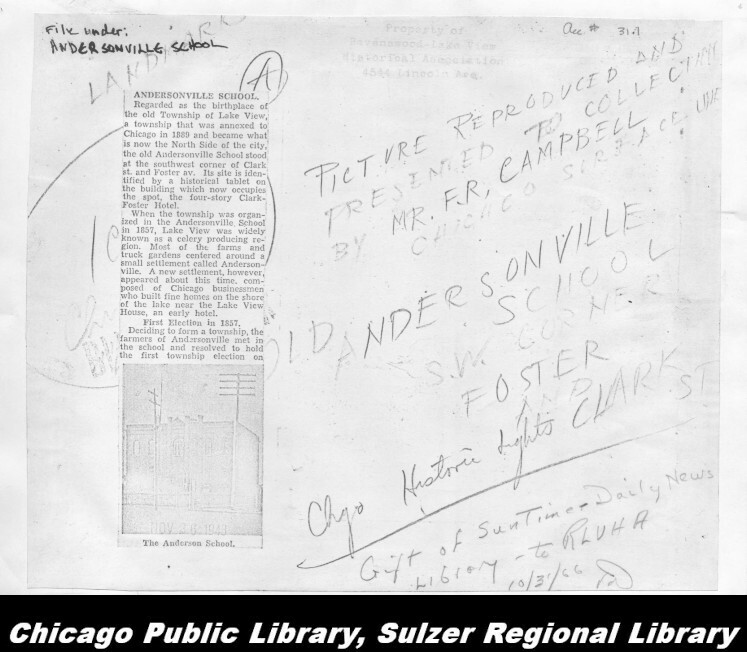 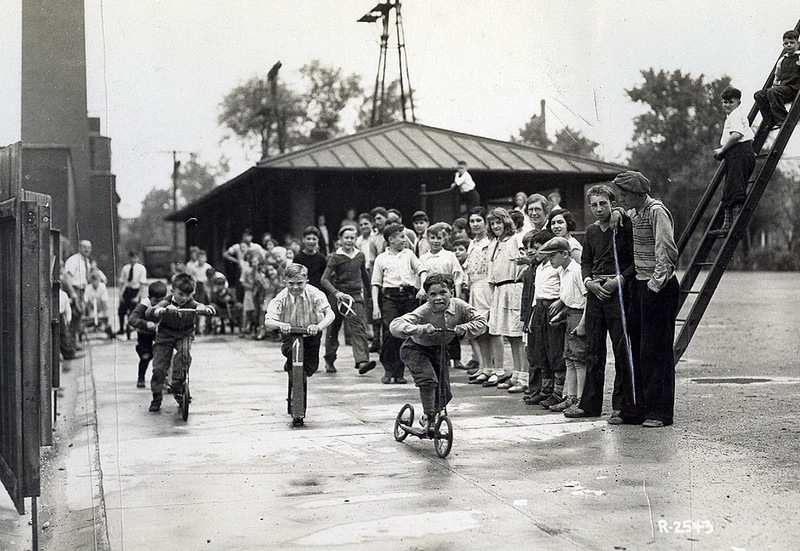 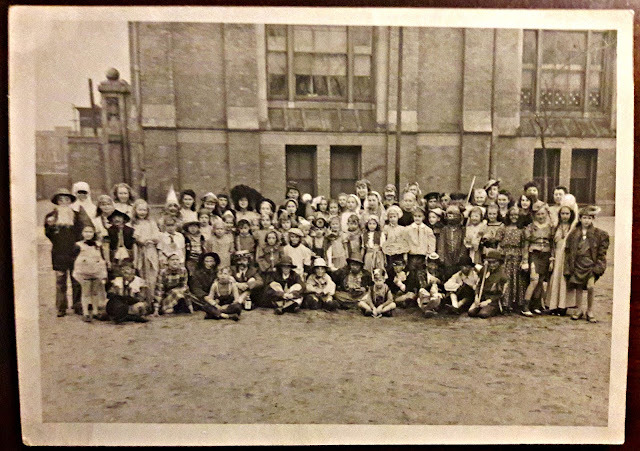 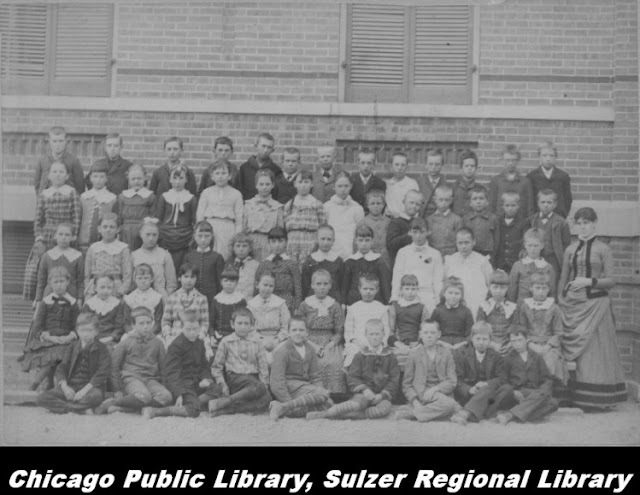 According to the Edgewater Historical Society, 'The Andersonville school was used as an ungraded school because there were so few children in the area. 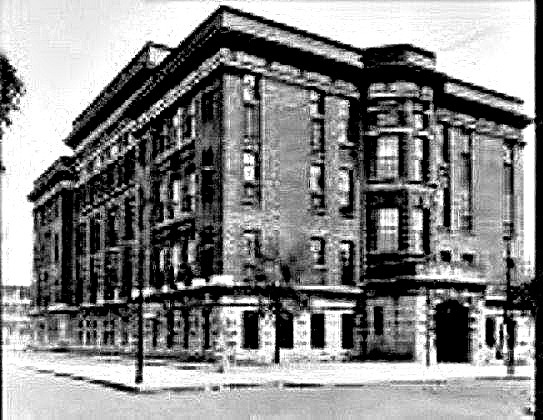 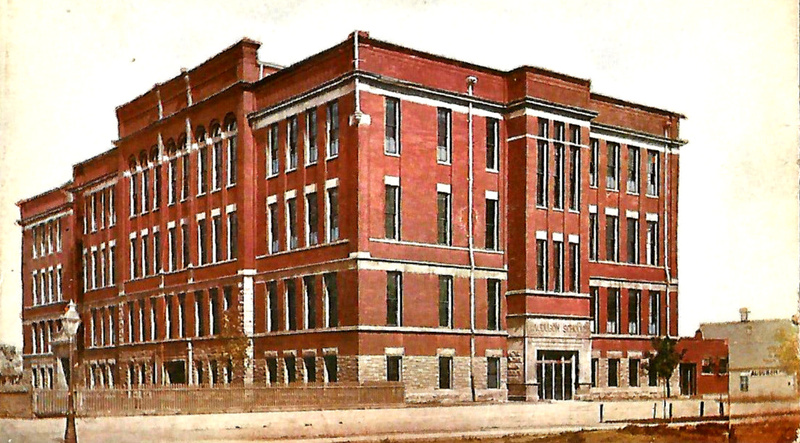 According to the 'Annual Report of the Superintendent of Schools' [Chicago] of 1908 the demolition of the building was in the works. 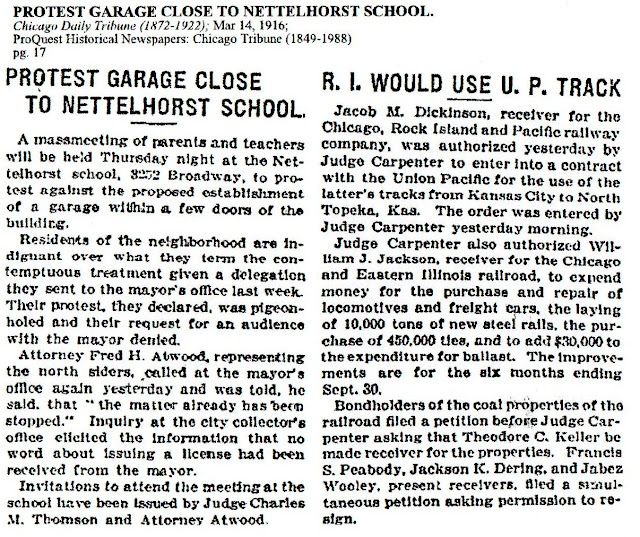 According to The Edgewater Historical Society, the school was located on the west side of Clark Street near Peterson and Glenlake. 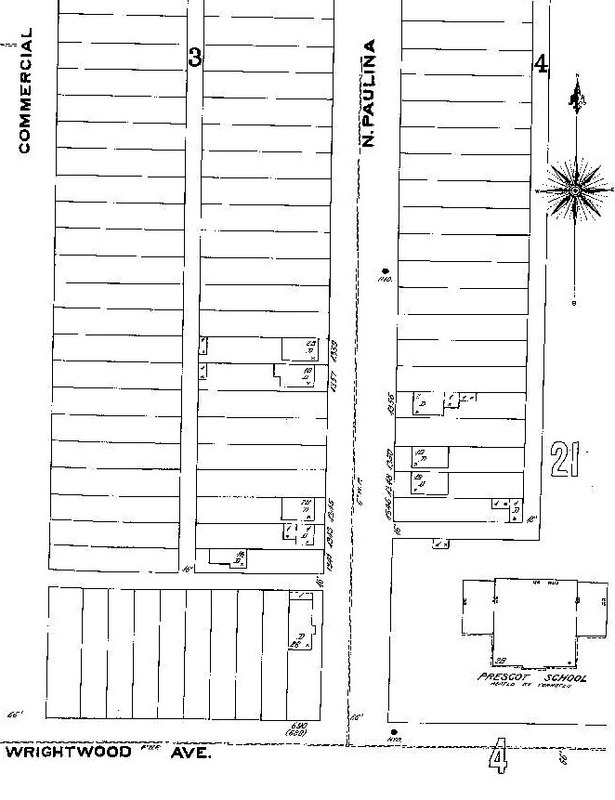 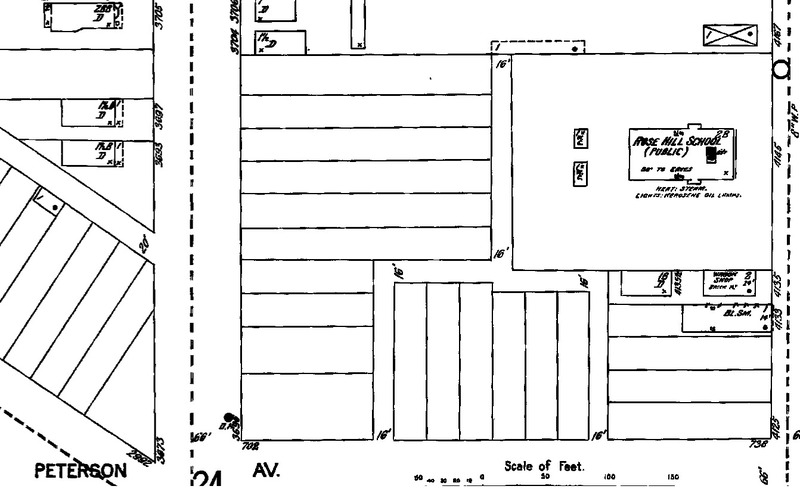 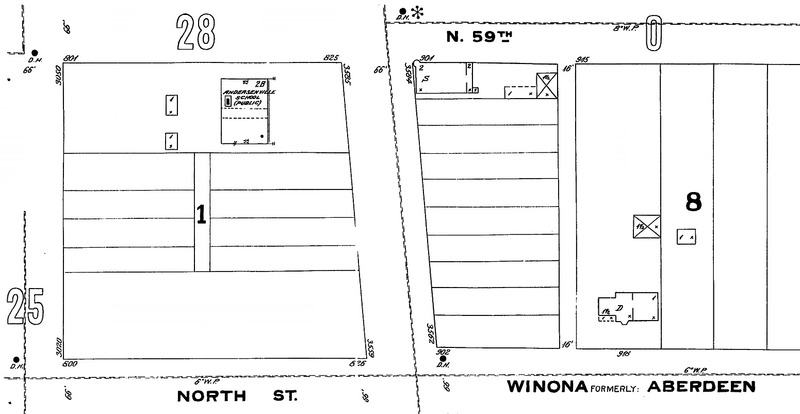 A permit for a renovation/expansion dated July 2, 1910, shows the address as 6020 N to 6024 N. The Chicago Board of Education records indicate that the building was built in 1883. 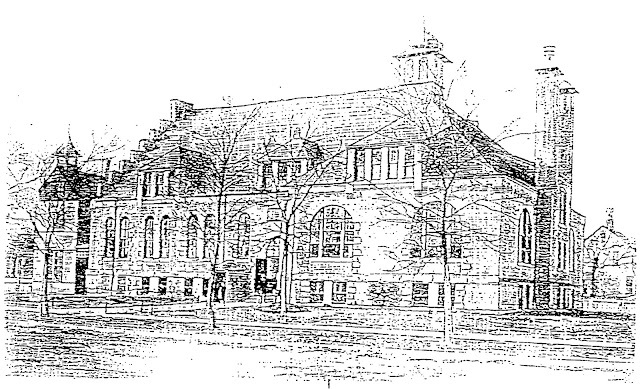 A. T. Andreas in his 'History of Cook County' gives the year it was built as 1882 indicating a brick building. 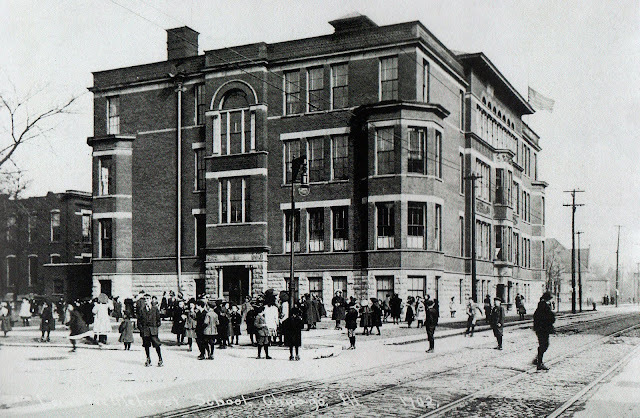 The school operated until the opening of the Stephen K. Hayt school which was built to replace it because of considerable overcrowding. 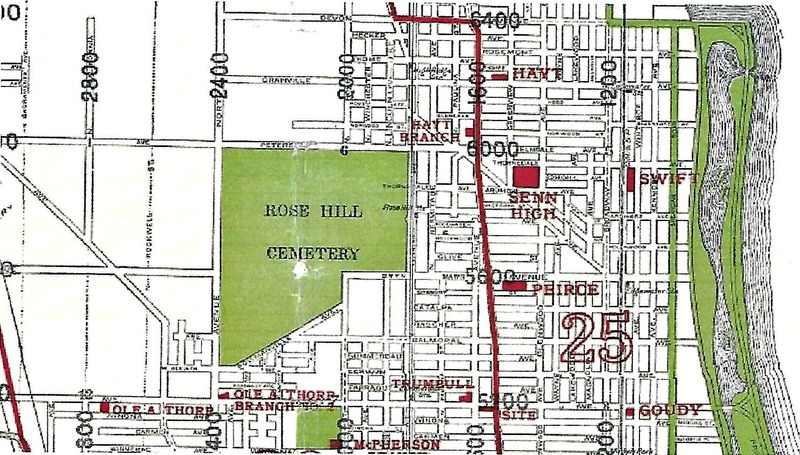 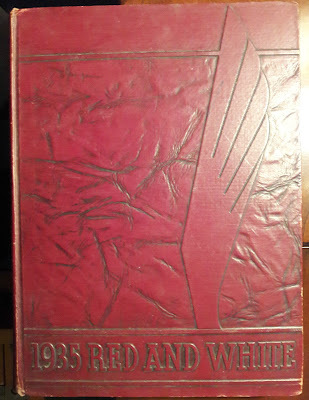 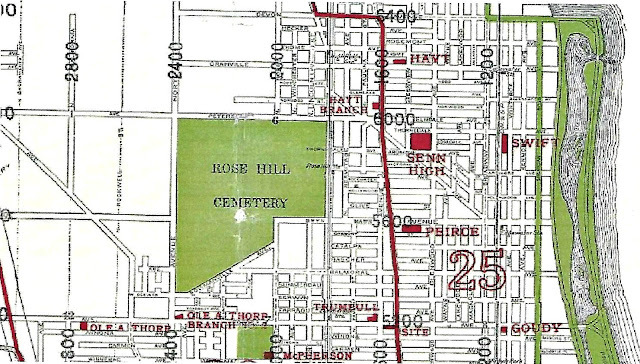 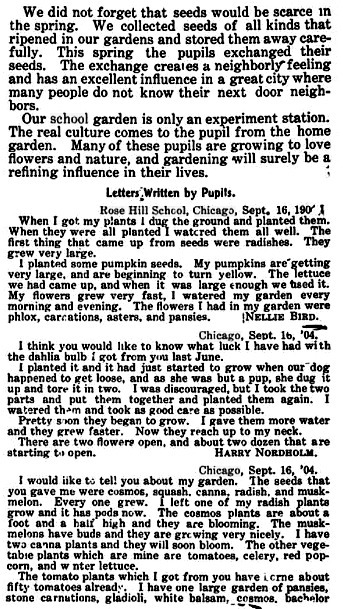 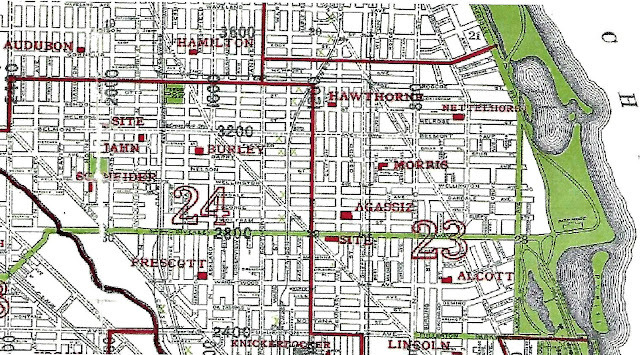 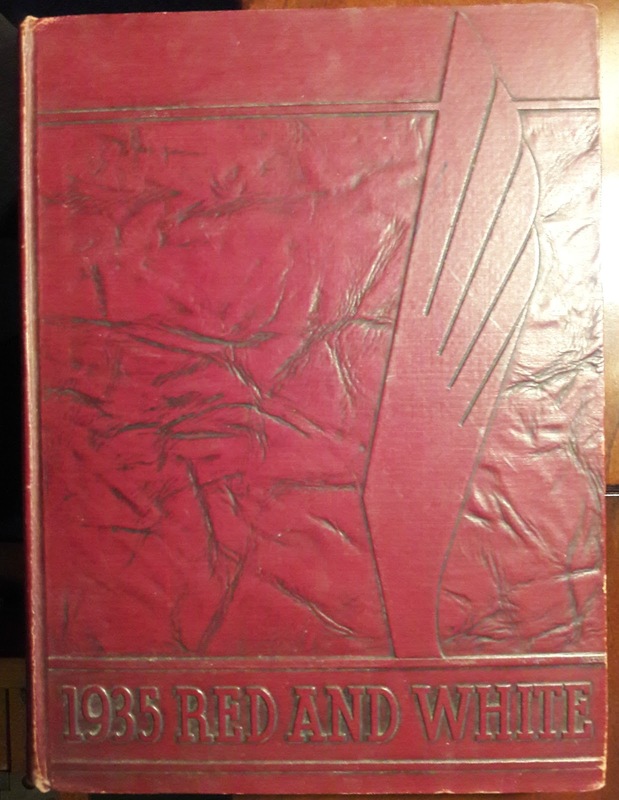 A 1905 Chicago Board of Education report on all schools indicated that the Rosehill School had 289 seats but 427 students, of which 182 were in rented rooms. 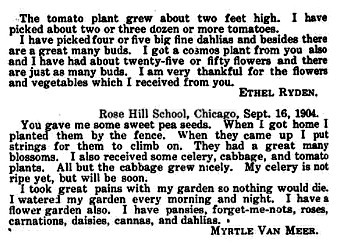 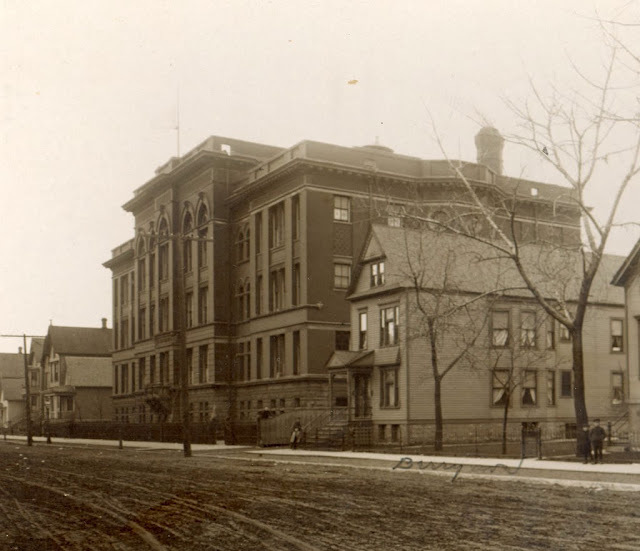 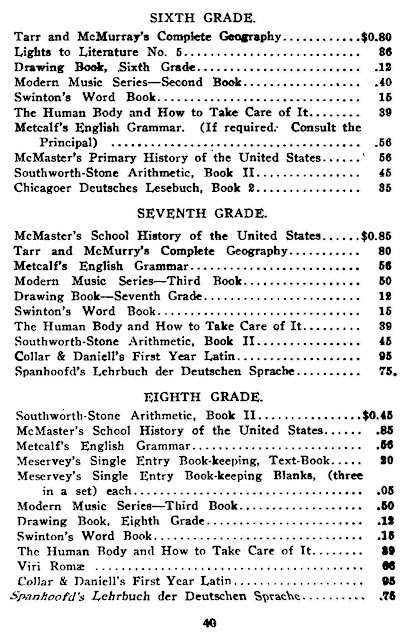 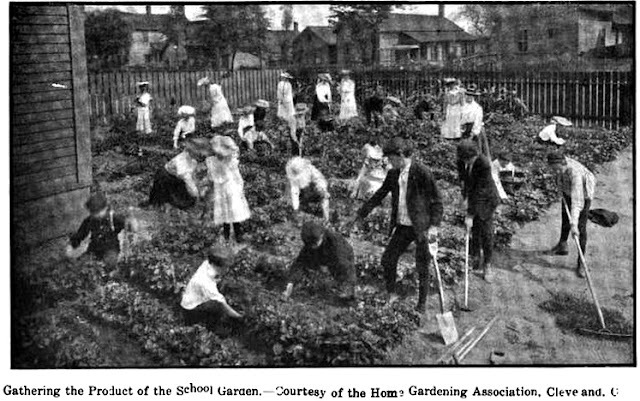 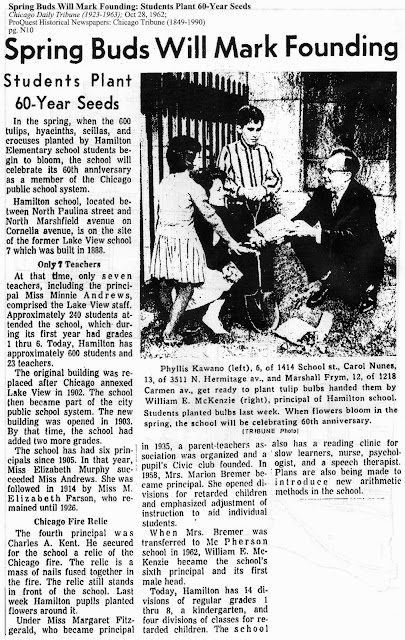 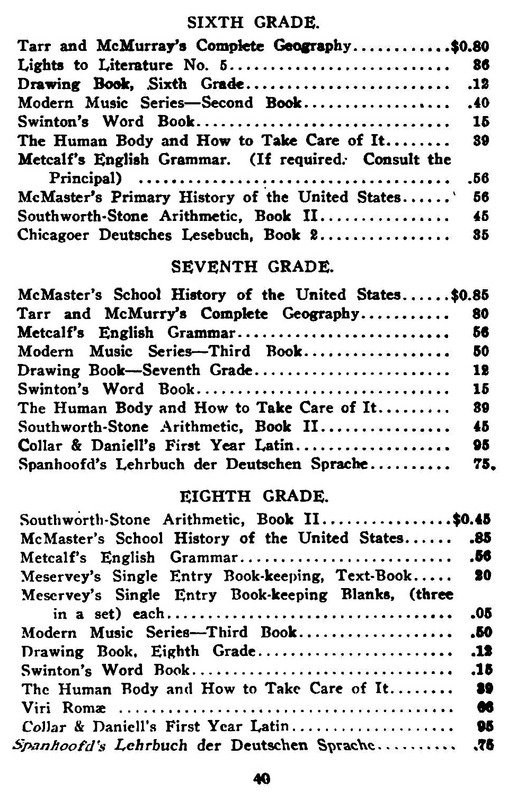 The Hayt School opened in 1906 [in what was then the District of Lake View]. 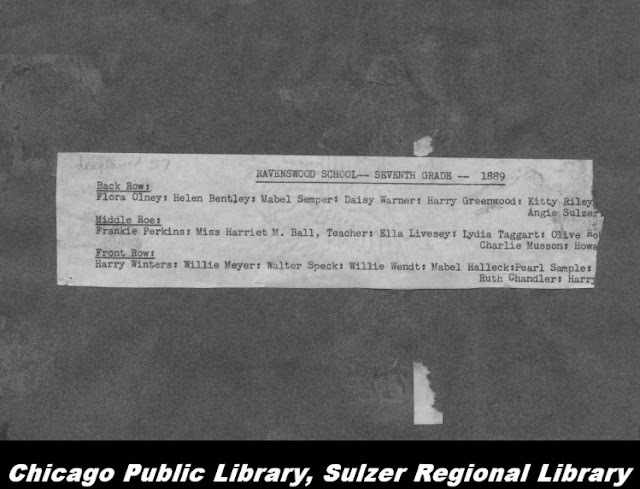 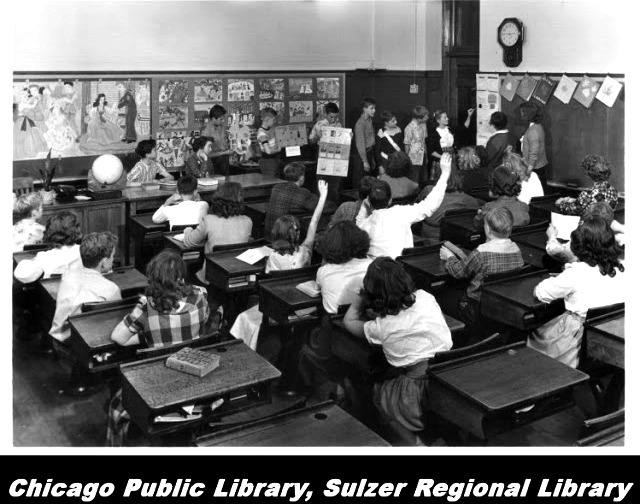 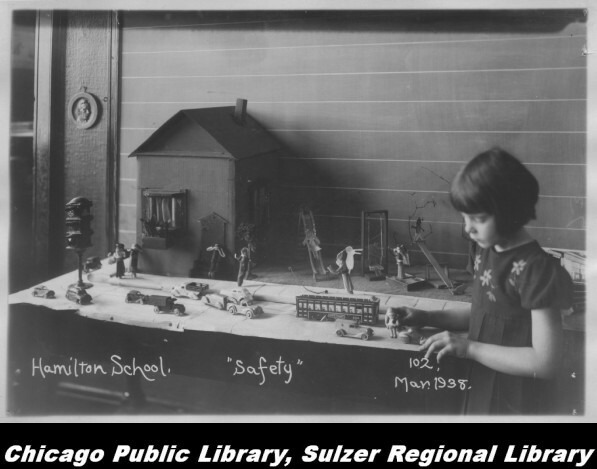 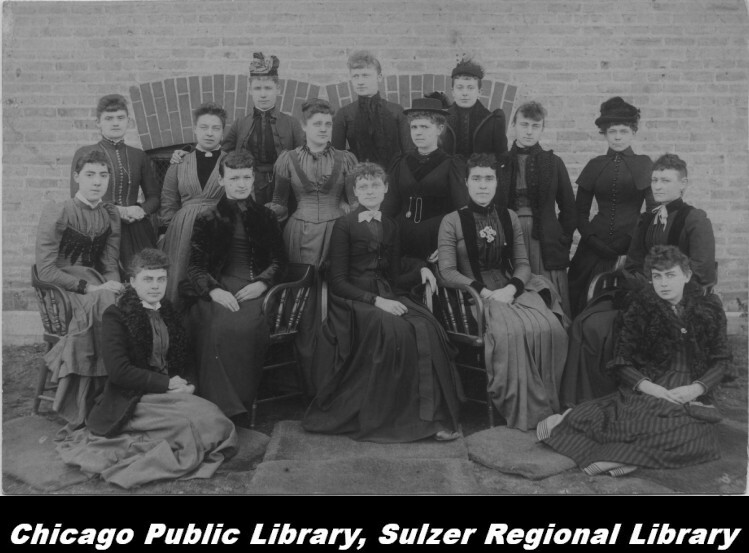 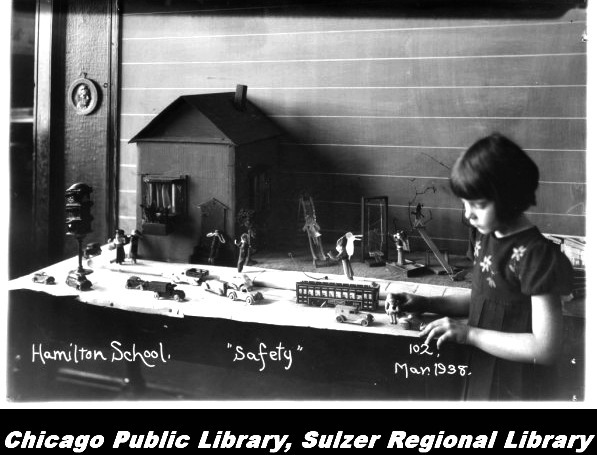 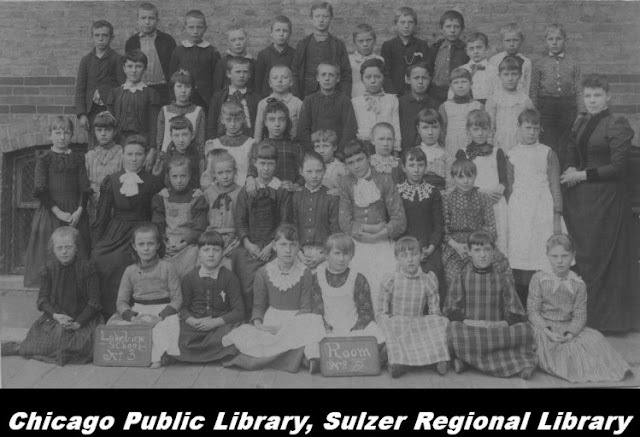 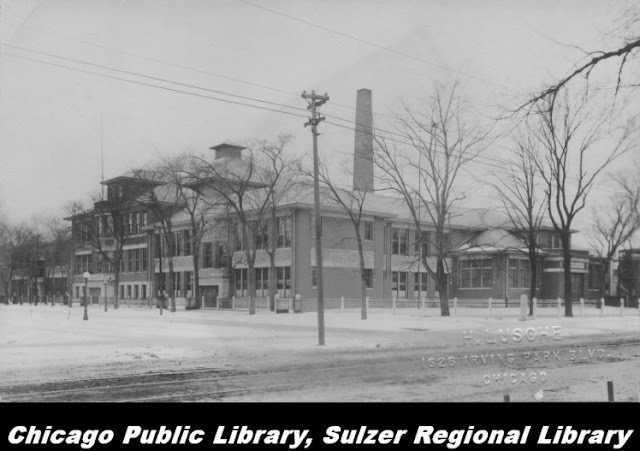 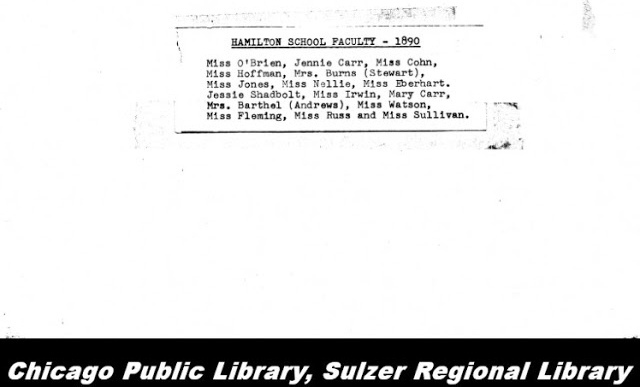 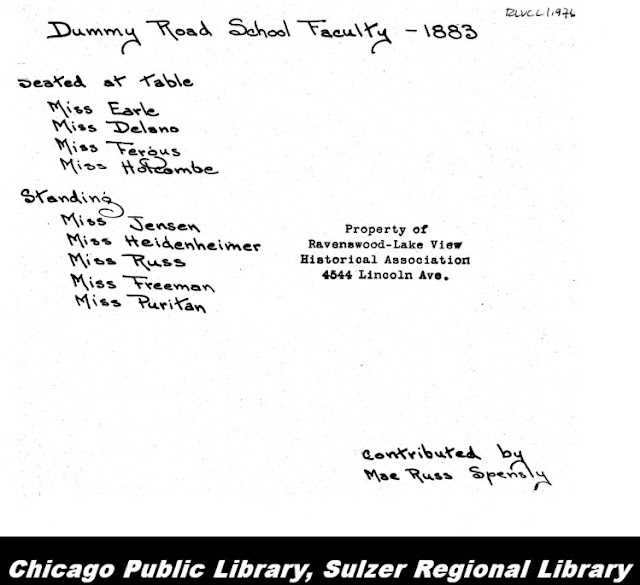 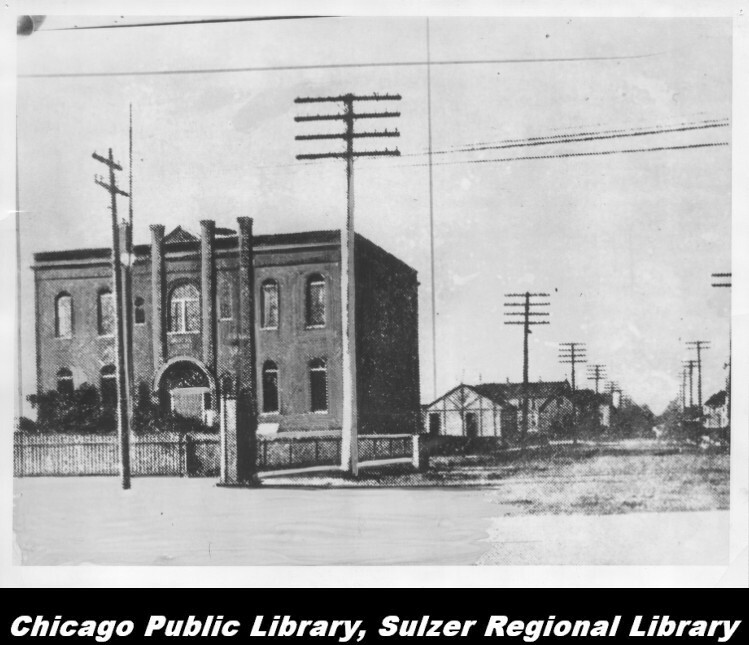 This school was originally called the Sulzer School. 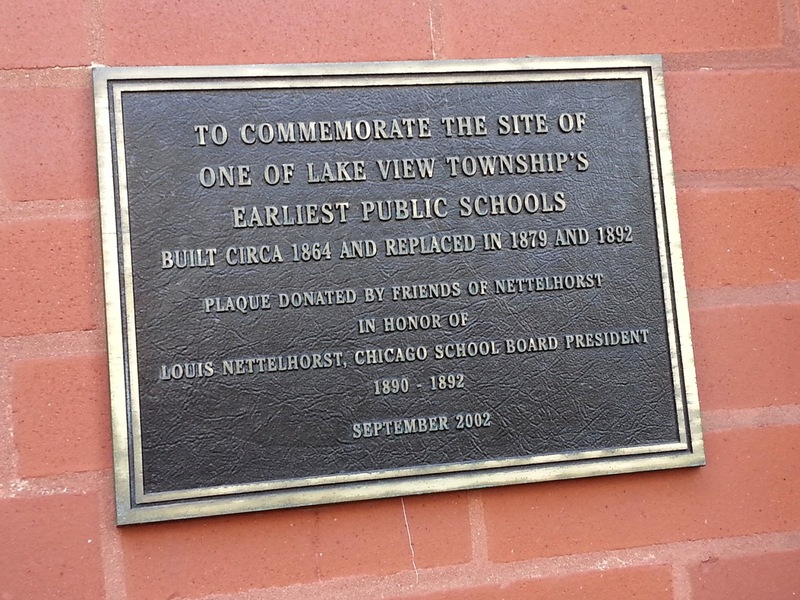 The building was constructed on the same property of the current school in the Township of Lake View. 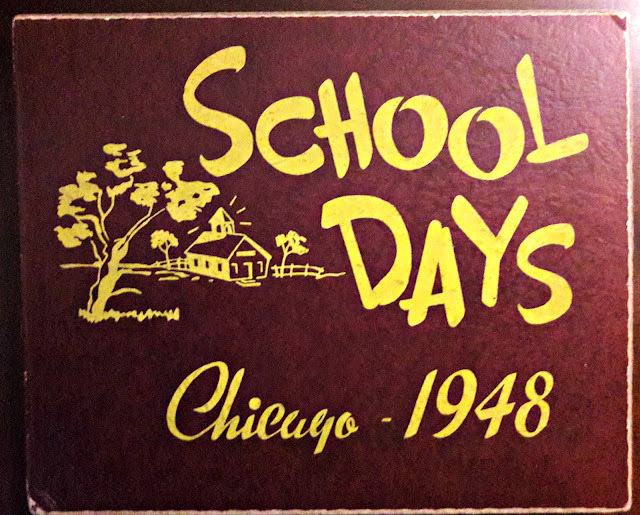 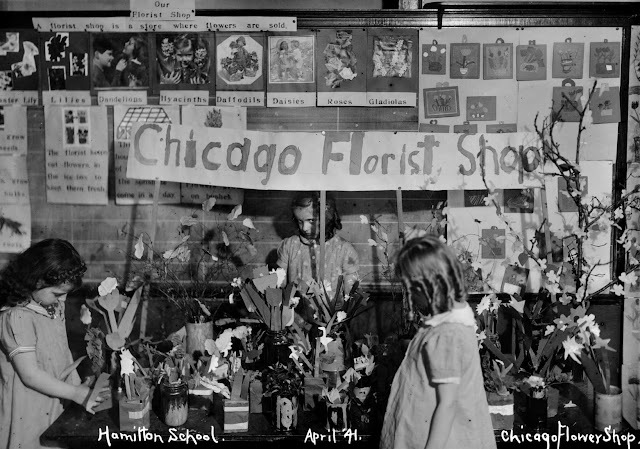 This school had it's own school district status before it was annexed by Chicago. 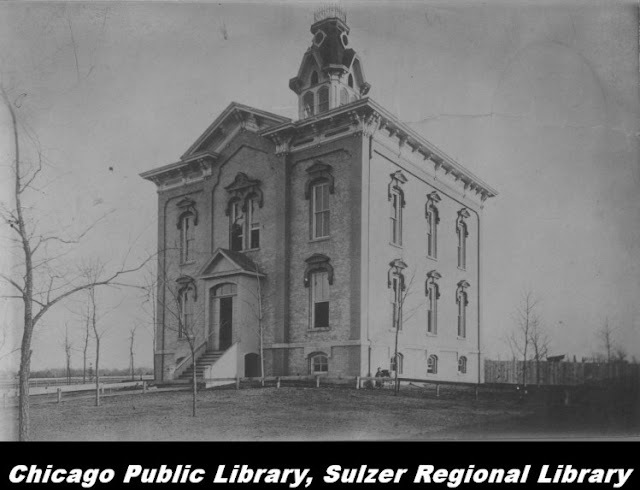 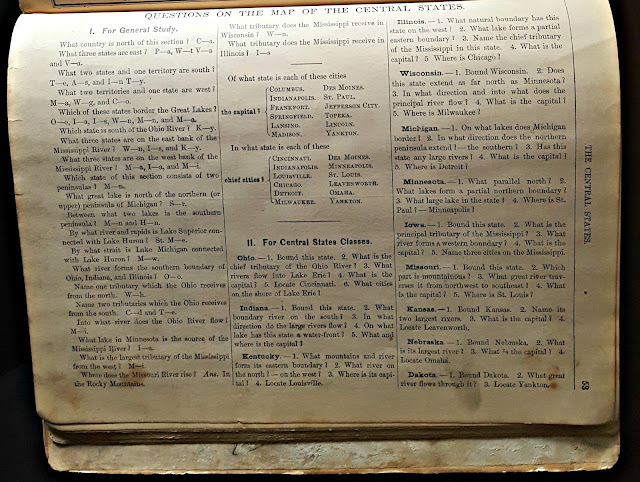 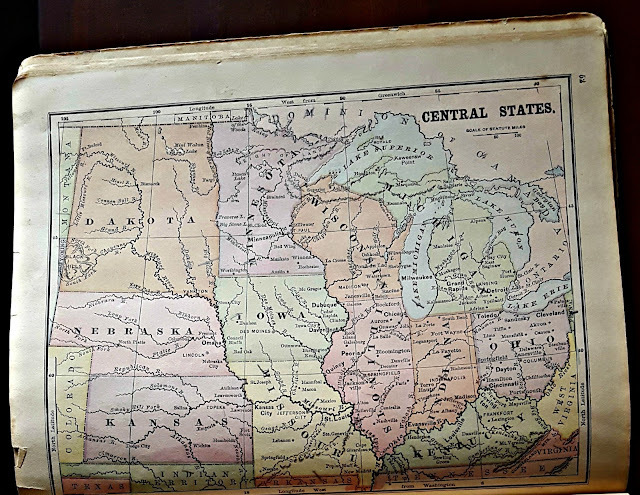 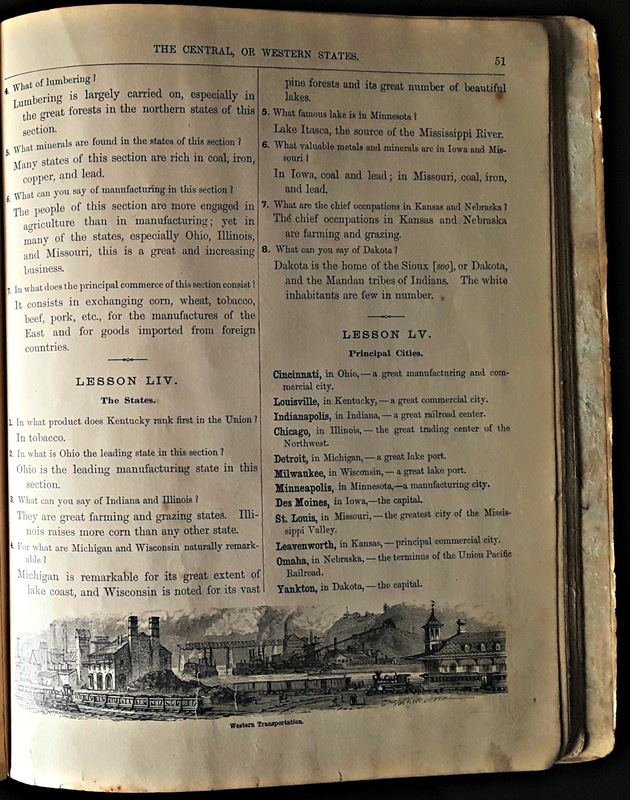 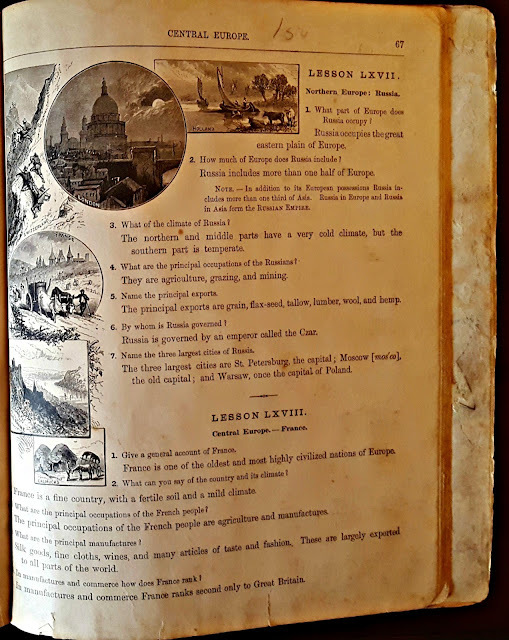 According to the publication called History of Cook County, Illinois (p.710) the first building was probably constructed from wood and built in 1864. 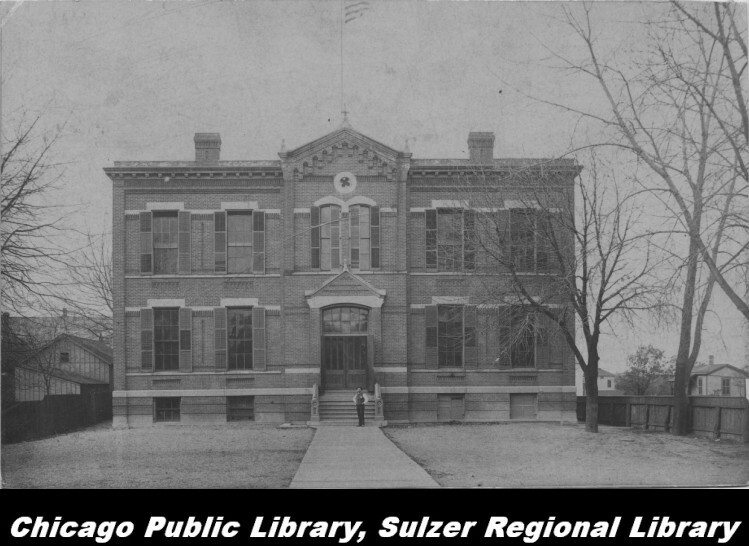 The first brick building was built in 1879 while the addition and/or second building by 1893 presently located at 3252 North Broadway Avenue. 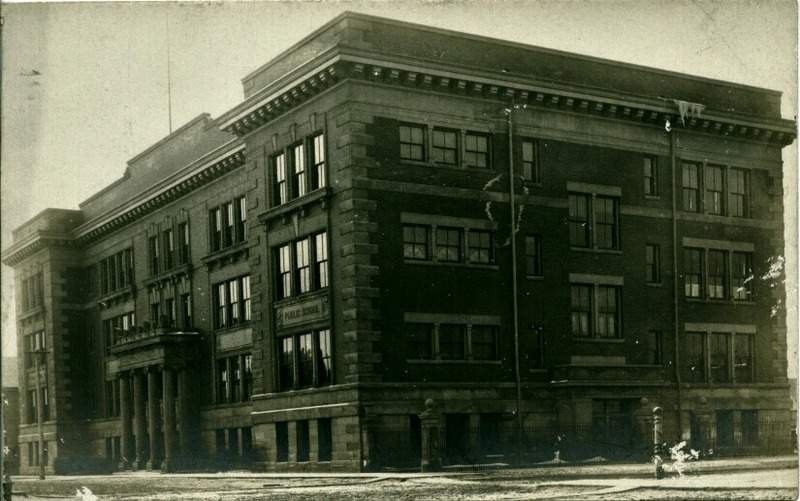 This postcard image shows both the original school and the newer school. A building bridge was constructed later to connect to the two buildings. 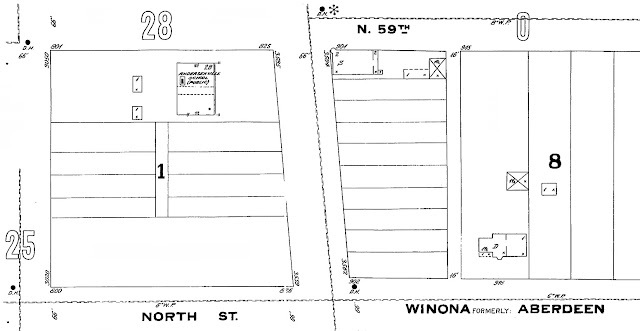 Below are images of the Sanborn Fire Map 1894 indicating the bridge link to the two buildings as well as illustrations from 1923 & 1950. 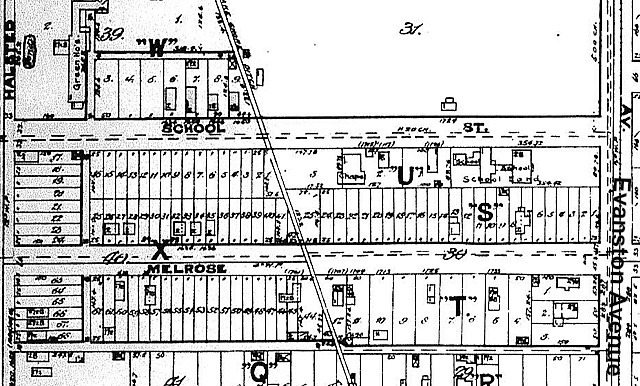 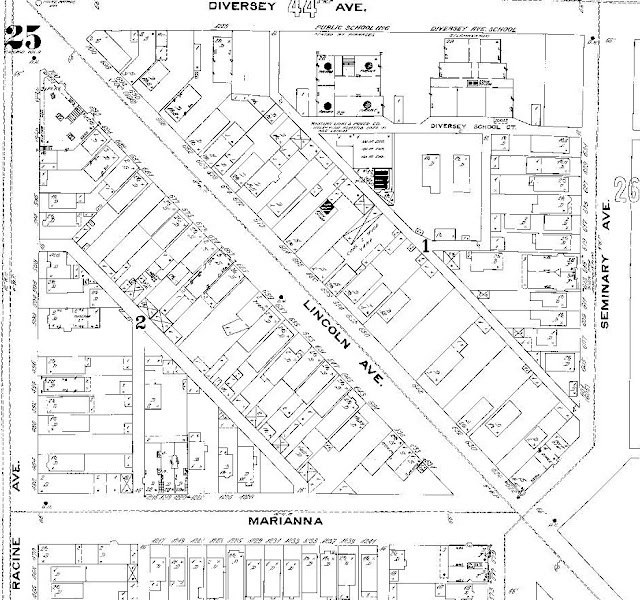 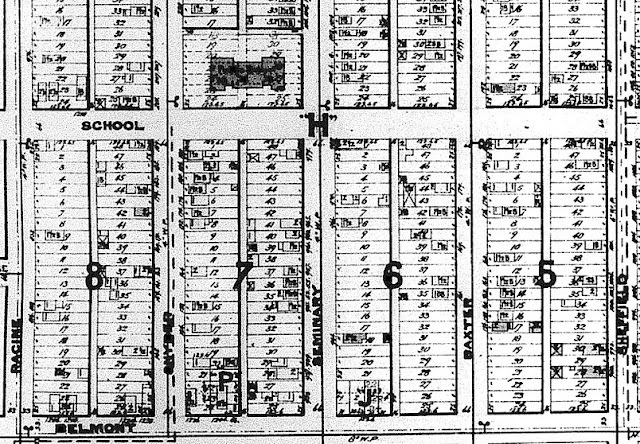 Broadway was called Evanston Avenue prior to 1914 and School Street end at Evanston in 1894. Lake View Plank Road and Evanston Avenue. 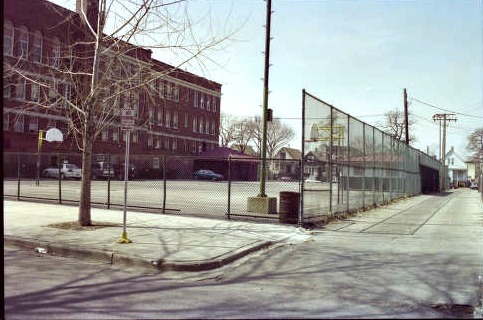 This was the mode of transportation along Broadway (Dummy Road/Evanston Avenue). 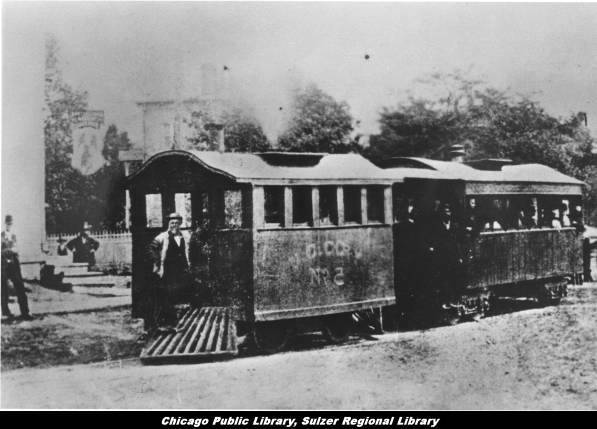 It was called the 'dummy train' because the first car was the engine masked to look like the others behind it. 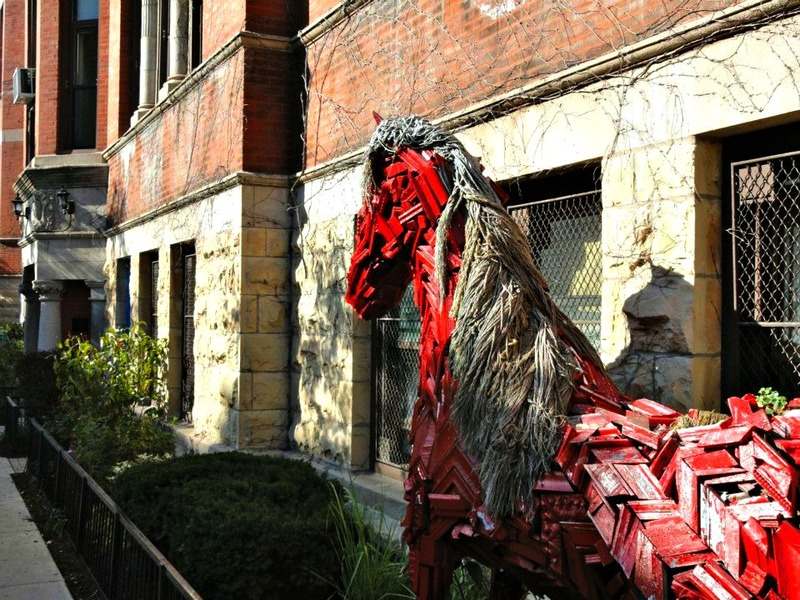 The first engine car design was so that the horses would not recognize where the LOUD engine noise was located - not kidding! 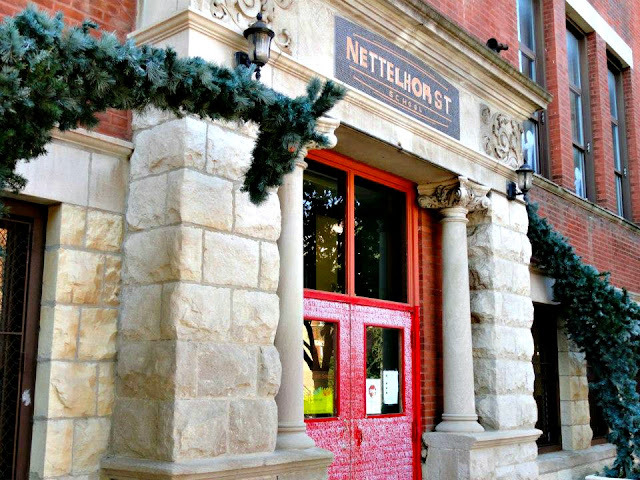 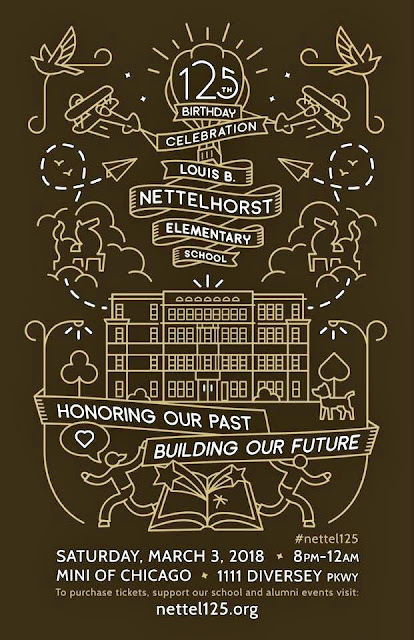 Their namesake, Louis Nettelhorst, was born on February 4, 1851 in Bremen, Germany. 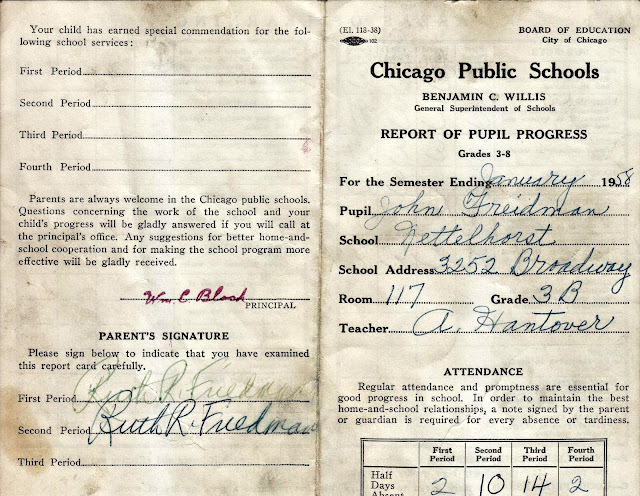 As a teenager he moved to Chicago without his parents, who joined him a few years later. Upon arriving in Chicago in 1870 he joined an insurance company that sent him to New York where he married Tillie Ropeniak. 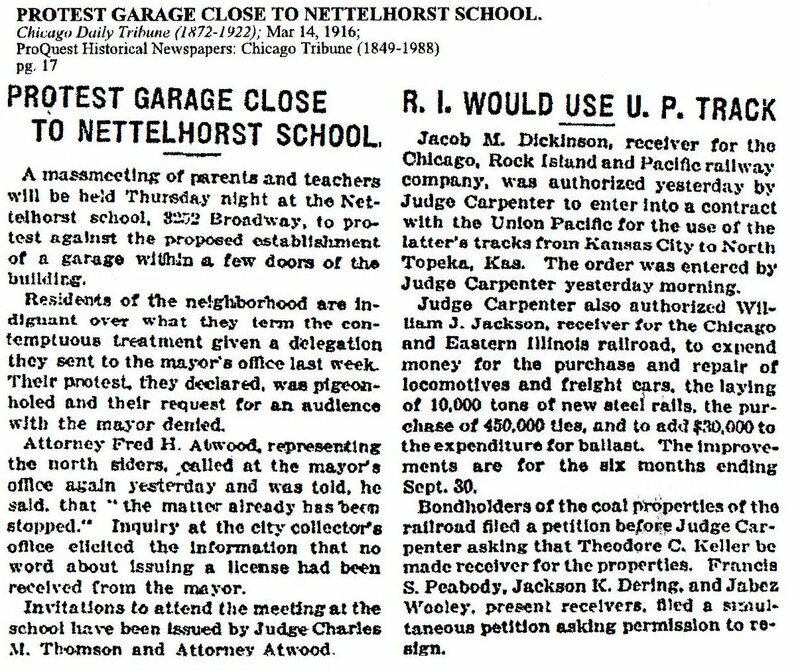 After five years Louis Nettelhorst missed Chicago, so he quit his job selling insurance in the East and returned to Chicago. 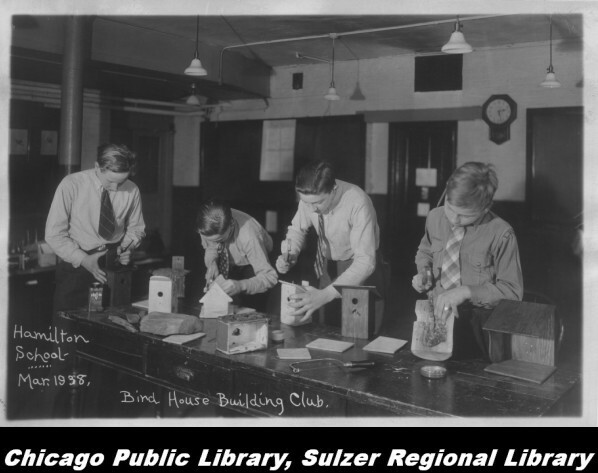 He took a position as a bookkeeper for Charles Emmerich & Co., the world’s largest feather dealer, and worked hard to become a partner in the company. 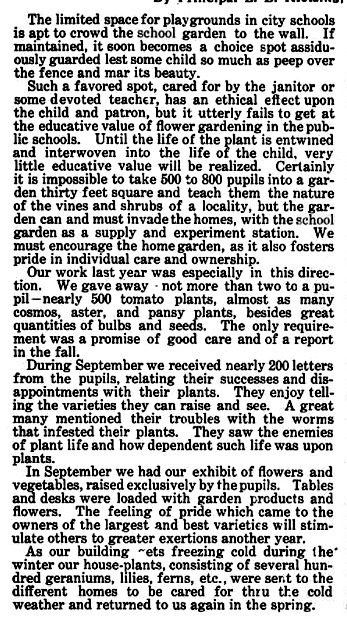 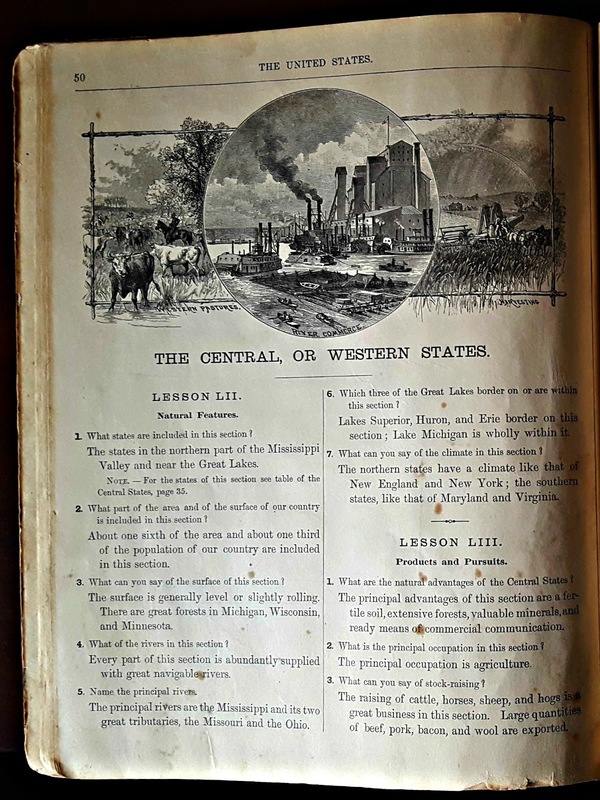 In 1876, with his assistance, this Chicago-based company exported 15,000 lbs. 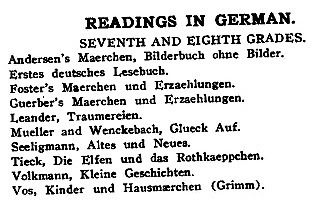 of feathers to Germany. Louis Nettelhorst served on the Chicago Board of Education from 1886 to 1892, three of those years as President. 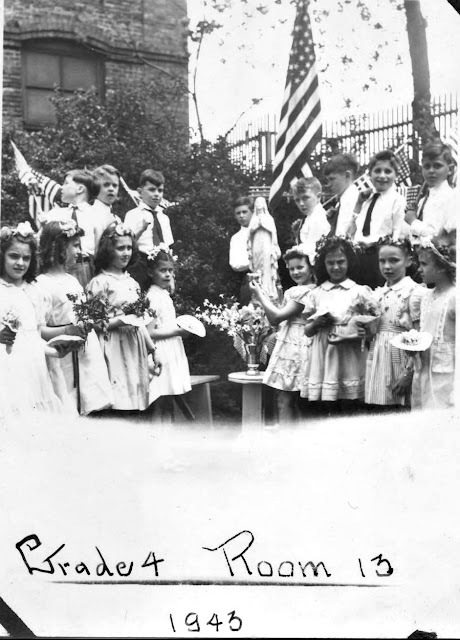 An advocate for immigrants’ rights, he helped establish cultural organizations and gymnastics clubs called Turnverein. 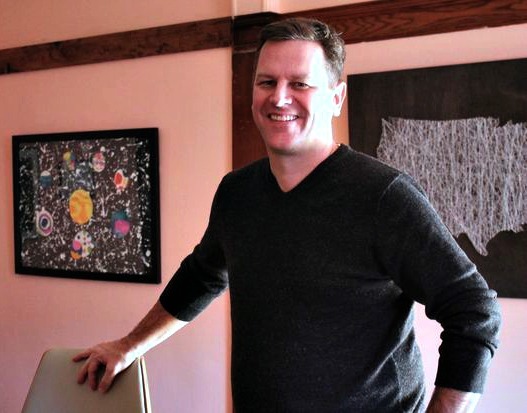 While campaigning unsuccessfully for city treasurer he caught the flu and never fully recovered. 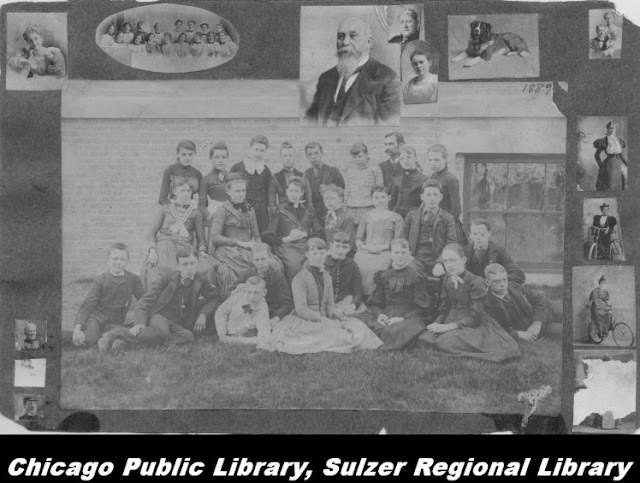 He died at his home in Chicago on March 14, 1893 leaving behind his wife and three young children: Freda, Carl and Louis, Jr. Several thousand people attended the funeral of this popular German immigrant. He is buried in Graceland Cemetery. 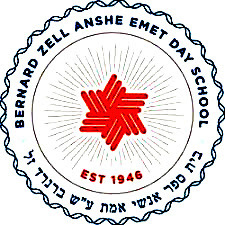 Visit this school on Facebook. Susan is the second row on the left of this photo. She was in third grade & 8 years old. 2003 This school was in a downward spiral but was saved by the dedication of a principal/staff and community associations + business merchants. 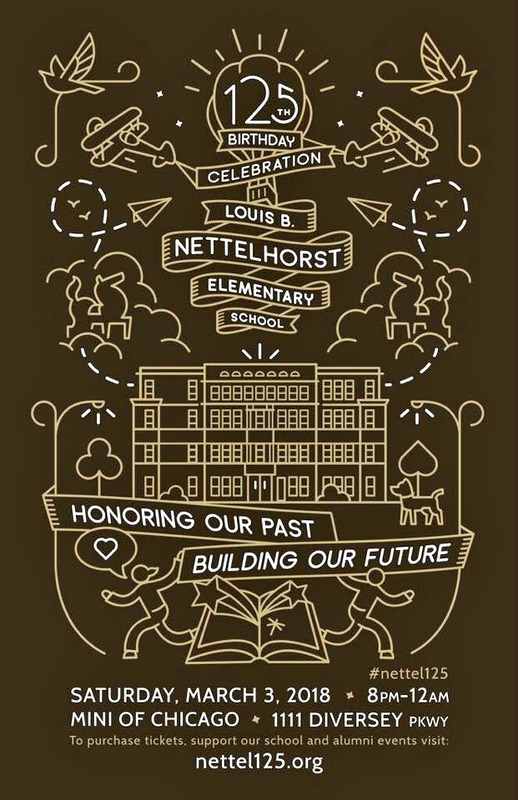 2013 This school formed a innovative partnership with Northwestern University to inspire and educate elementary students to become the inventors, engineers and entrepreneurs of tomorrow. 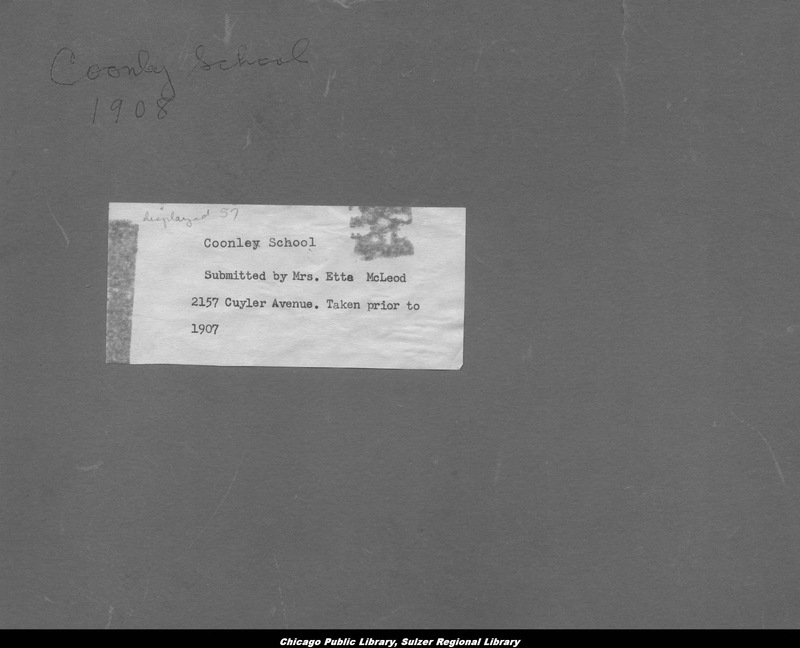 Note: View more current photos of this school via Flickr. 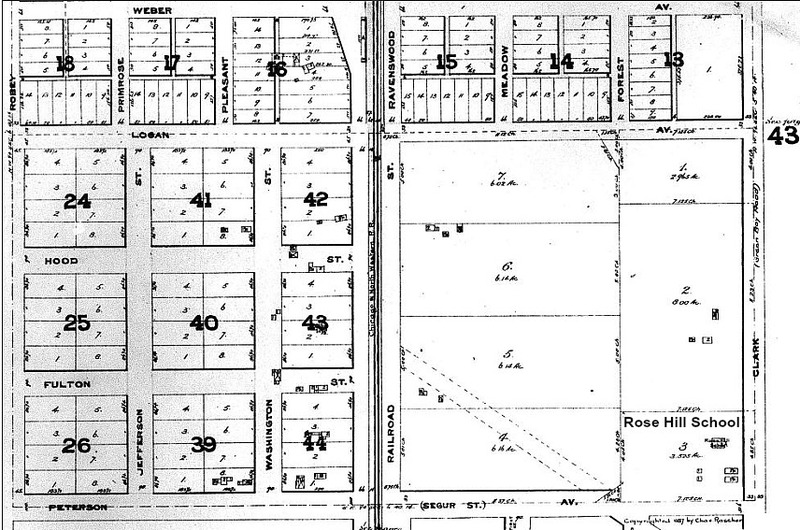 on the bottom right along with clay ponds on the other side of Ashland Avenue. 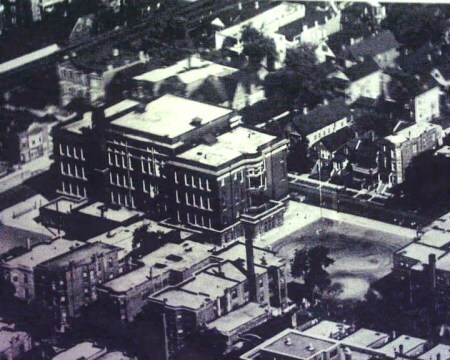 These ponds were used for the manufacturing of bricks. 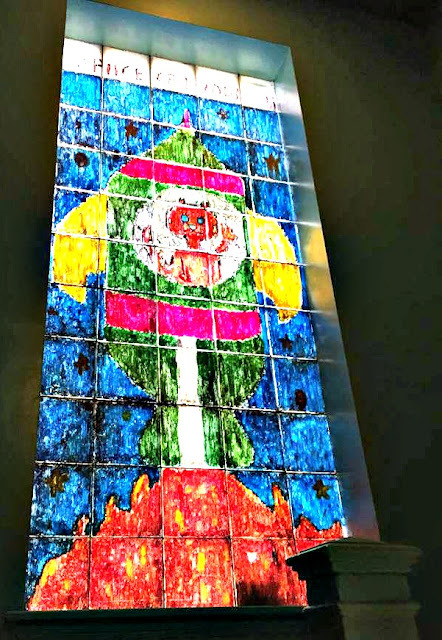 View the 3 mosaics of this school via Flickr. 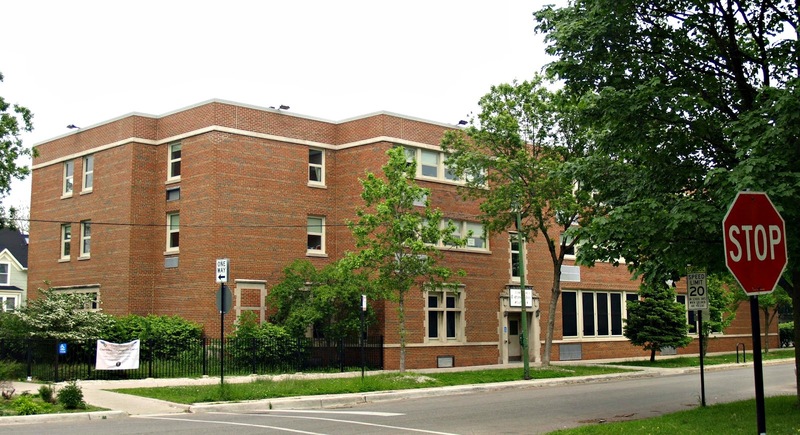 Prescott Elementary: As a literature and writing magnet cluster school, Prescott is a Level 1+ school of approximately 375 students. 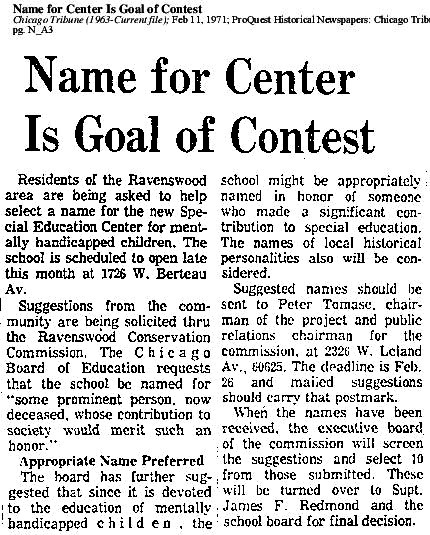 Ranked the No. 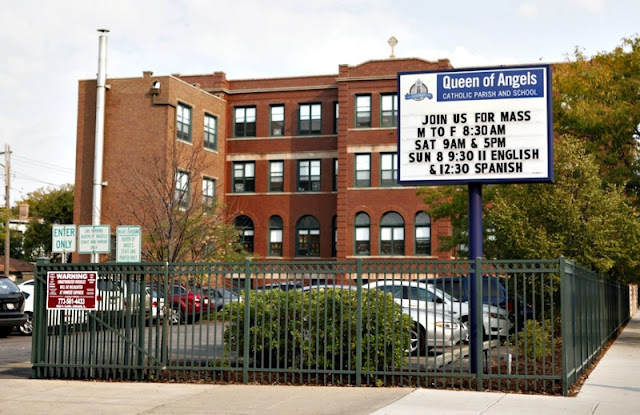 14 school in Chicago by Chicago magazine, students and teachers applaud Prescott for its ambitious instruction and supportive environment. 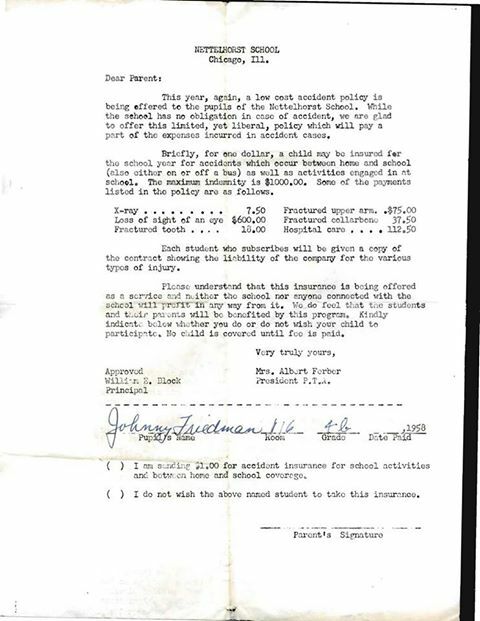 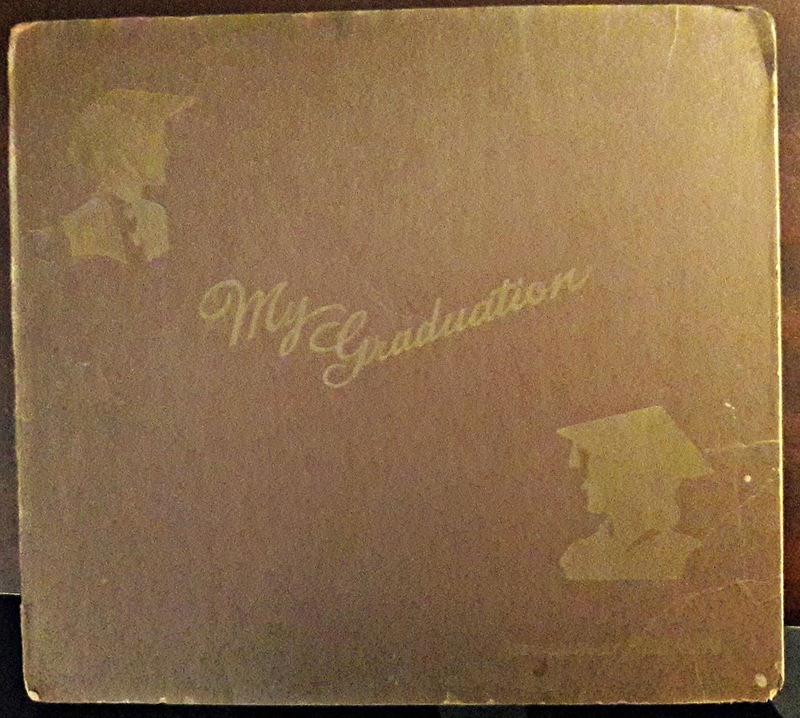 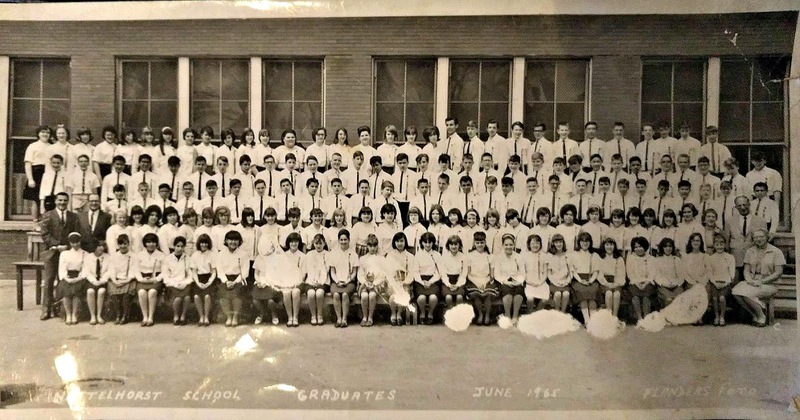 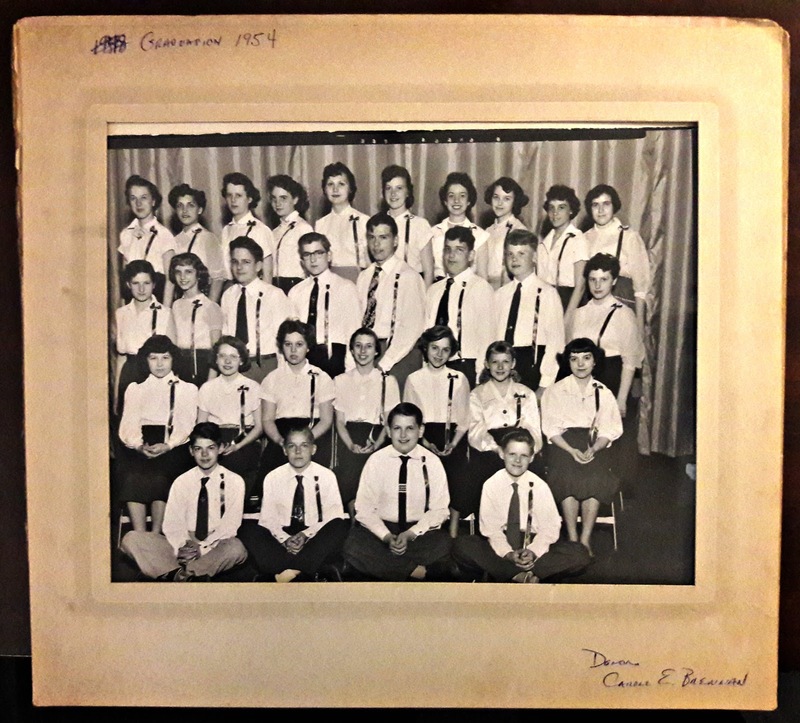 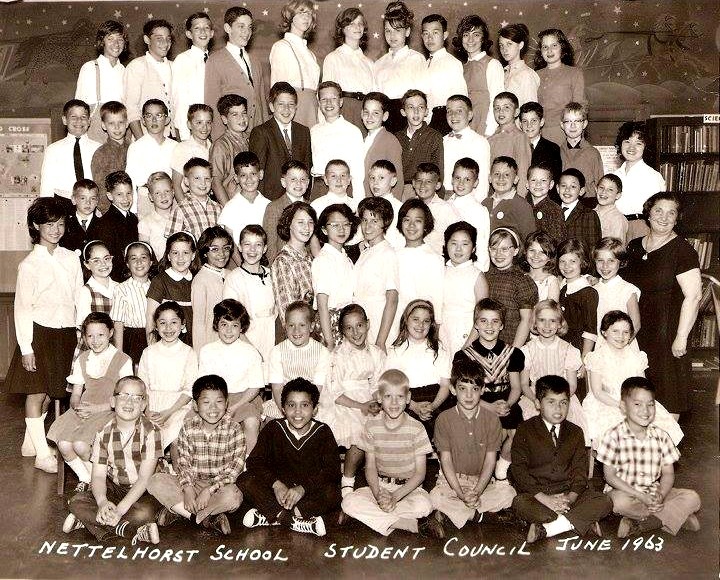 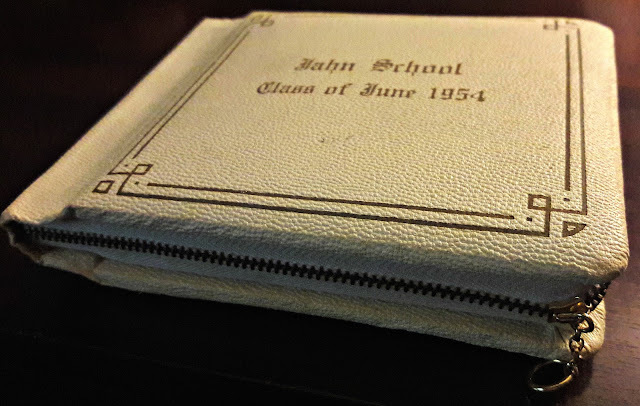 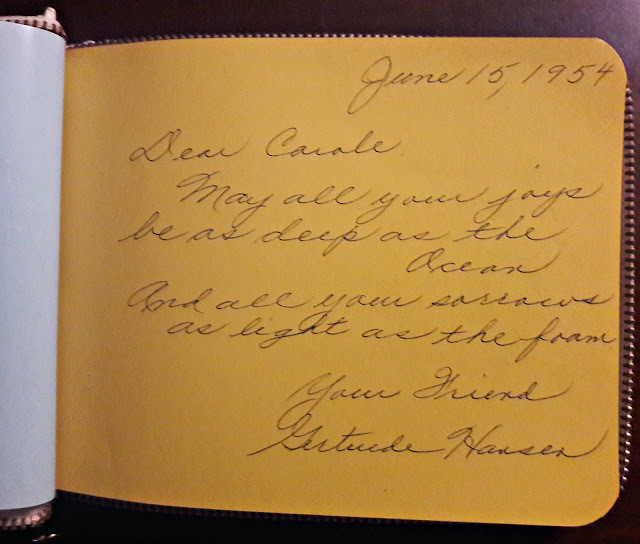 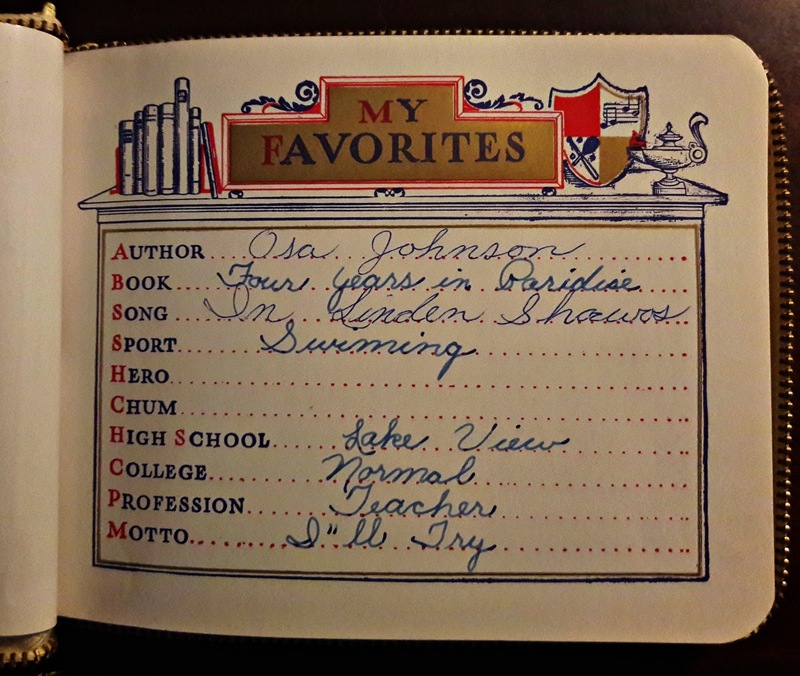 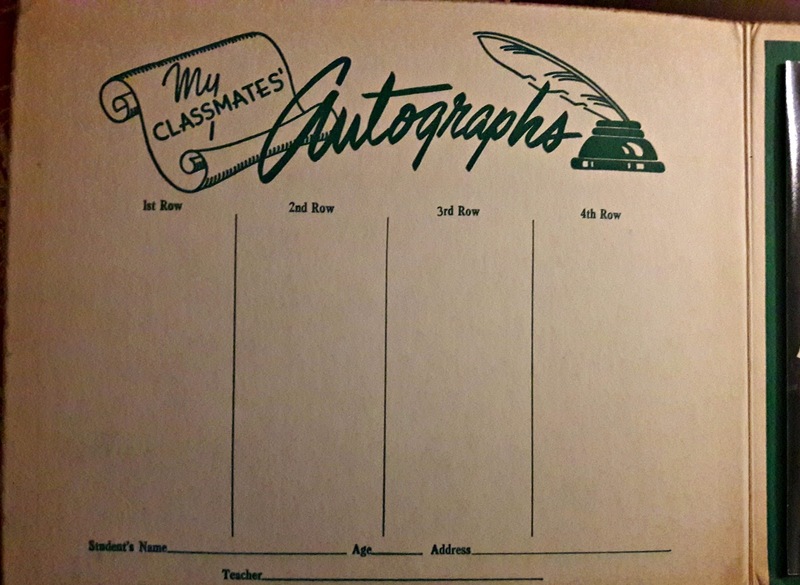 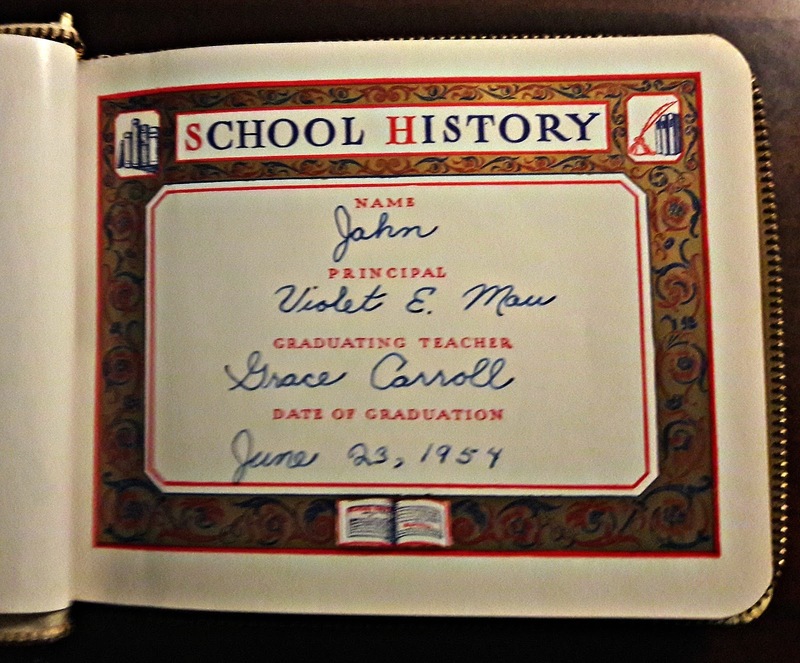 "I attended this fine school in the early 50's for my 6th and 7th grades. 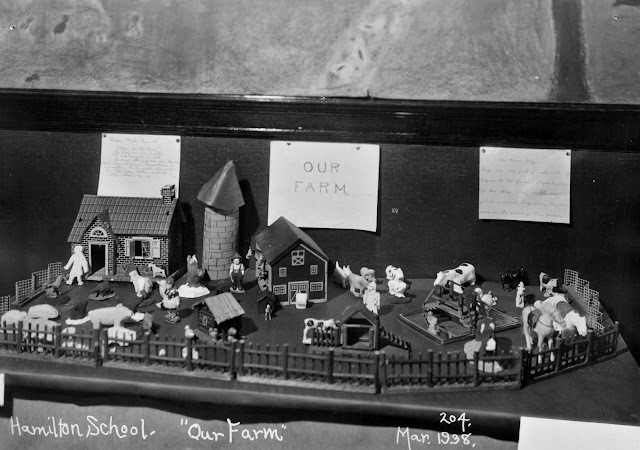 It was during this period that the present school was built, and that we moved out of the old school. 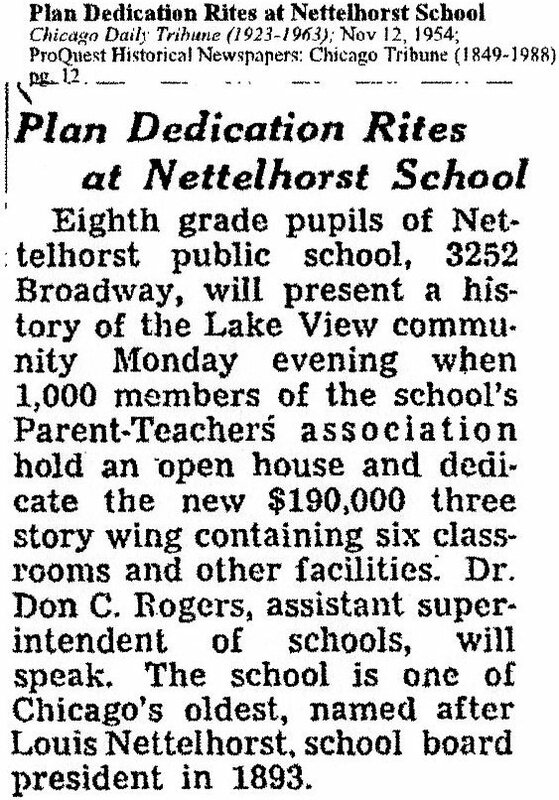 I remember that many of the students helped their teachers move classroom items into the new building. The two years that I attended this school were some of the happiest in my life. I am very happy that after all these years this school still remains such an excellent educational institution. Best of luck to all present and future students." Read about a teacher at this school that tests your critical thinking skills via DNAinfo-Lakeview. 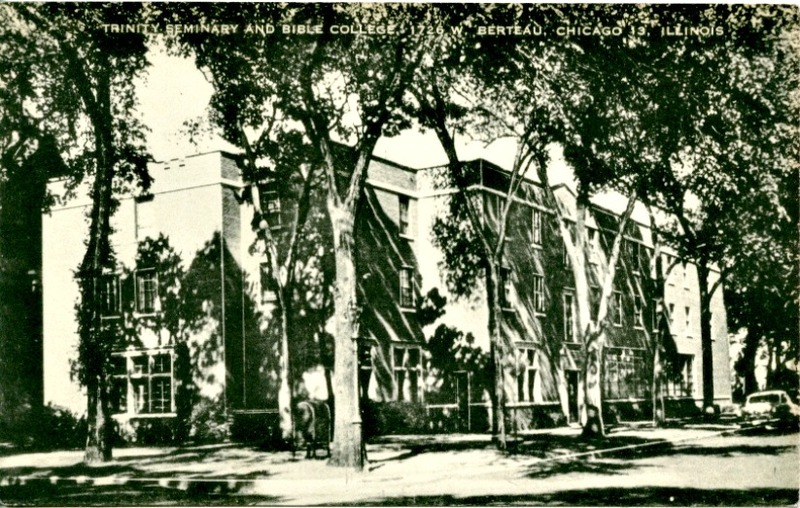 View more current photos of this school via Flickr. Alexander Hamilton (1755-1804): He was 'aide-de-camp' to General Washington during the Revolutionary War & served as Secretary of the Treasury during President Washington's presidency. 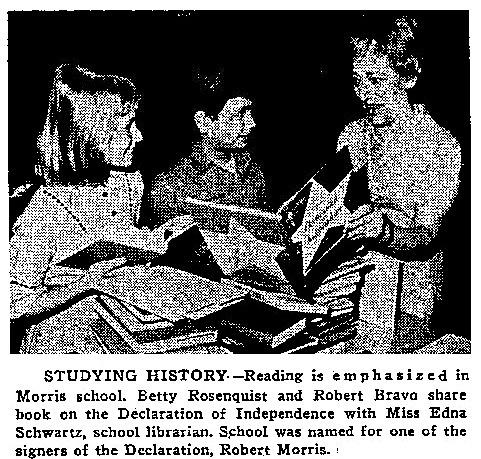 He studied law - one of the first Constitutional lawyers. 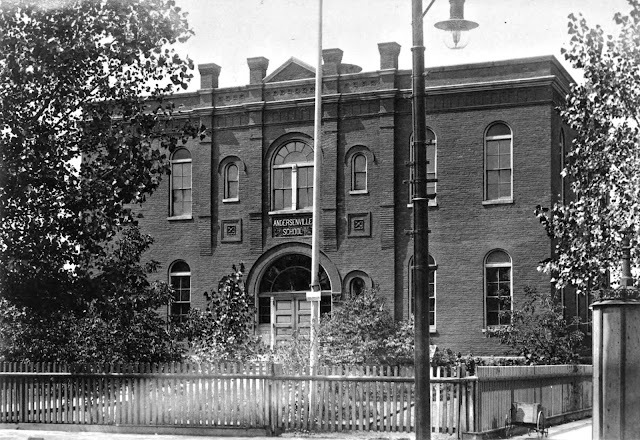 He was a member of Congress and founder of the Federalist party - one of the first political parties at the time. 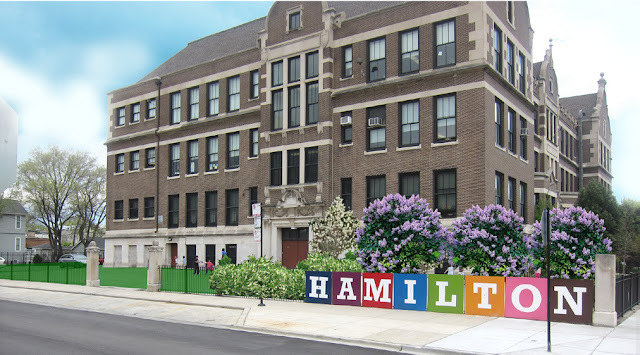 Currently at Hamilton School students can access the school's website posting all their homework via the web. This relationship lasted many years. 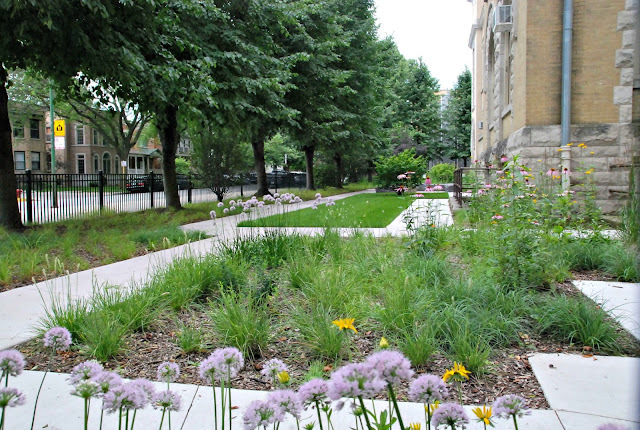 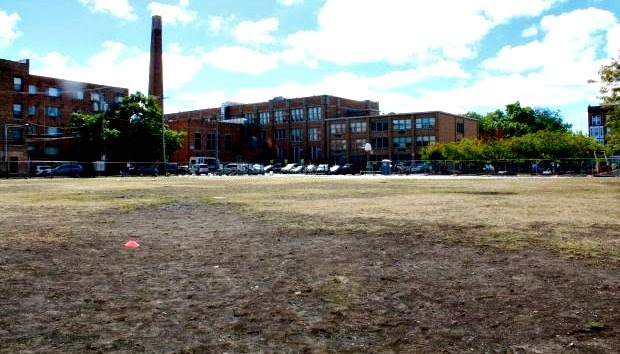 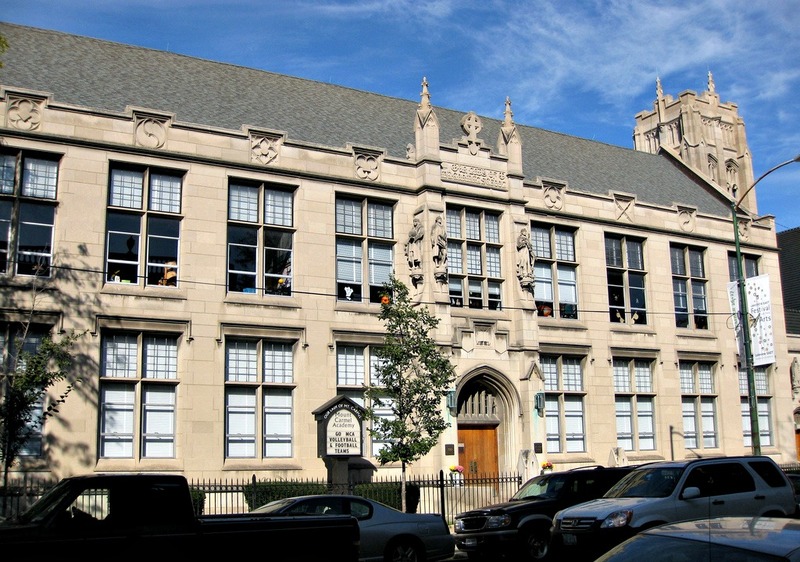 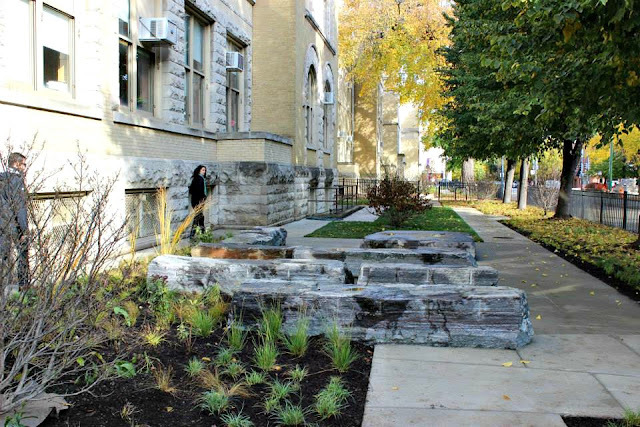 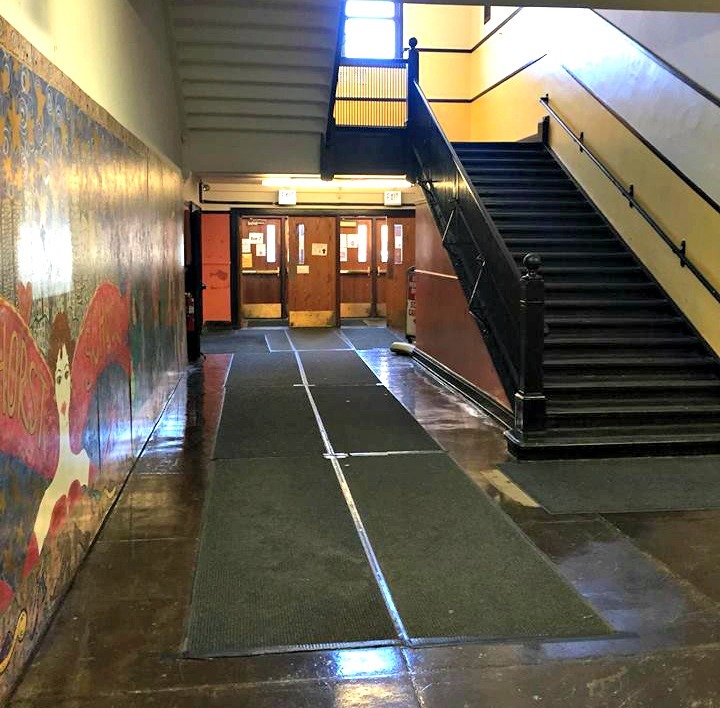 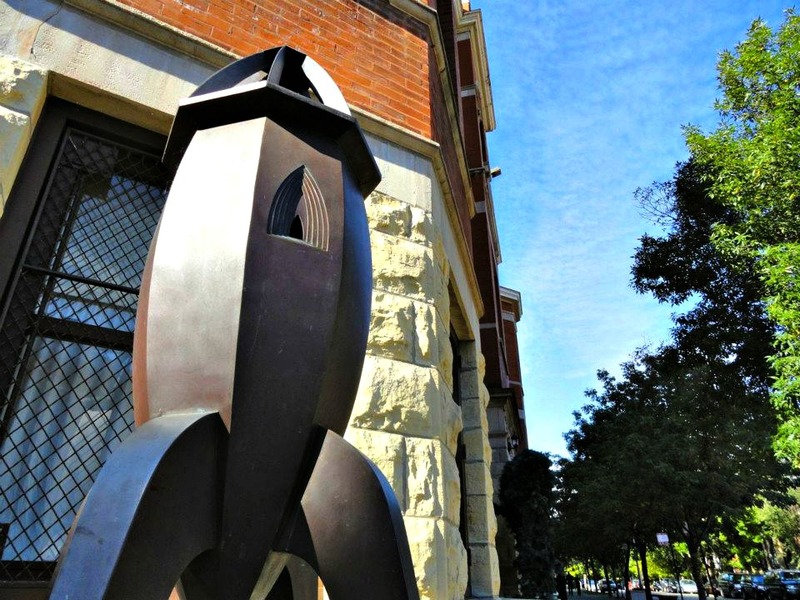 In 2009, the Lake View neighborhood school was set to be phased out as Chicago Public Schools moved to close, consolidate and "turn around" two dozen schools. 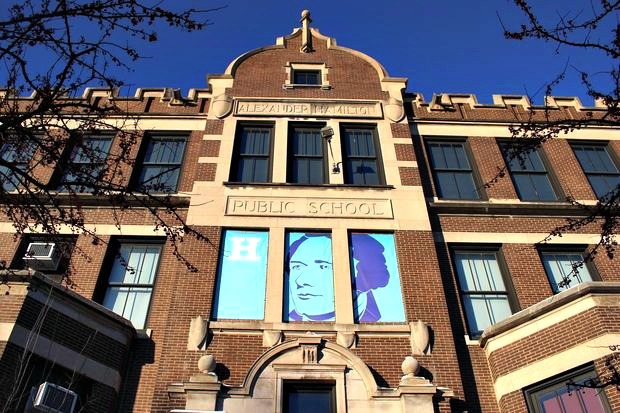 Local School Council Chair Stacey Paradis and Gray, who was about to begin his first year there, credit "a passionate group of Hamilton parents" with persuading CPS to give Hamilton another chance. 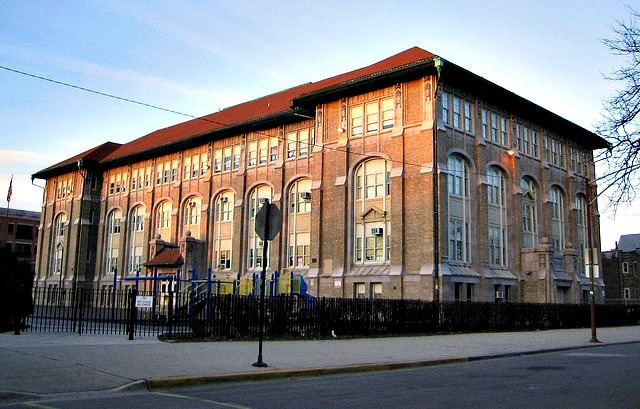 In 2016 the principal who spearheaded the survival of the school in 2009 retired per DNAinfo. 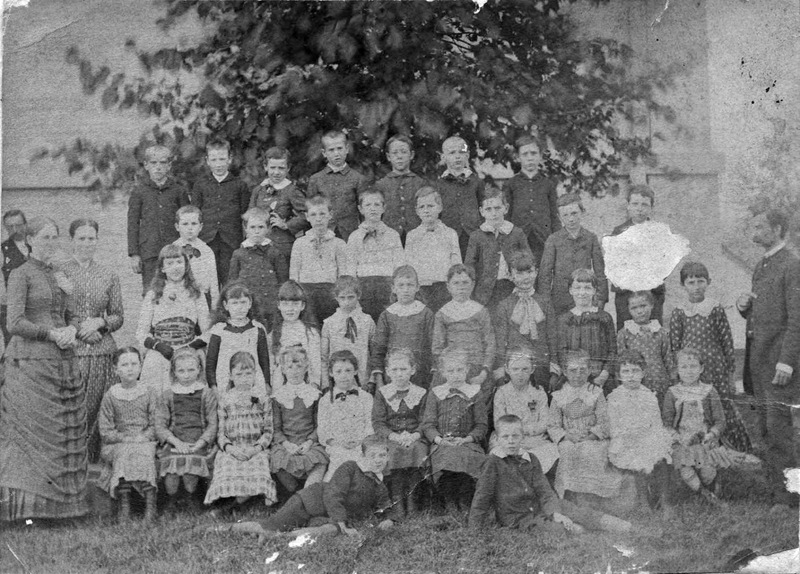 Audubon Elementary School was built in 1893. 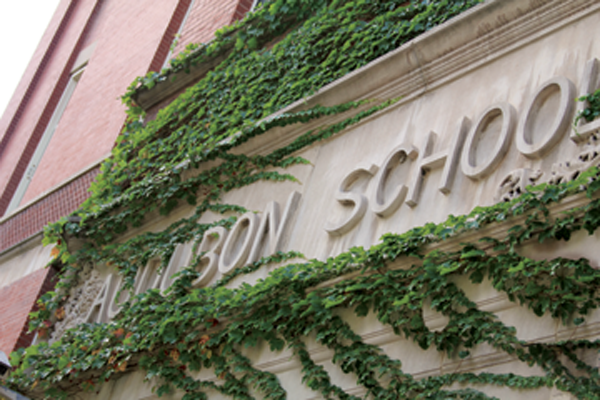 The school was named for John Audubon, a famous ornithologist. 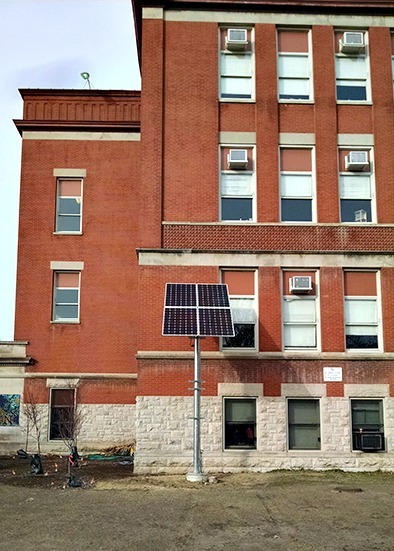 The school entered the 21st century with solar energy. 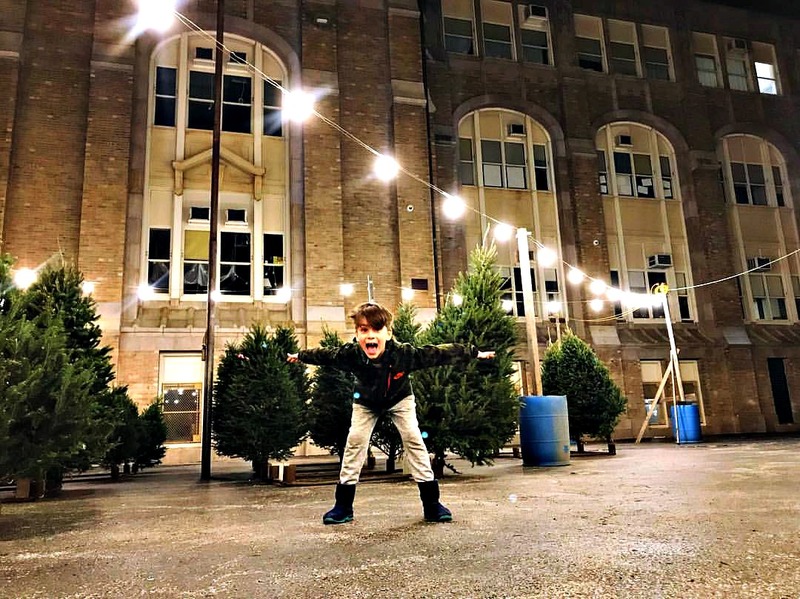 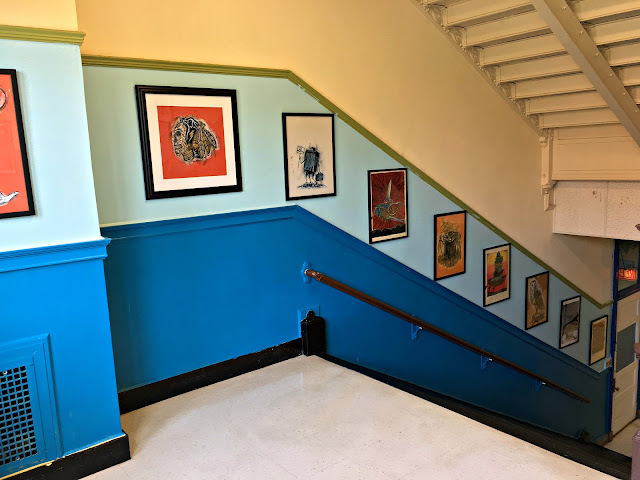 Agassiz Elementary School: Agassiz offers a fine and performing arts magnet cluster program, bringing in artists and musicians to work with its roughly 500 students through the use of grants and arts partnerships. 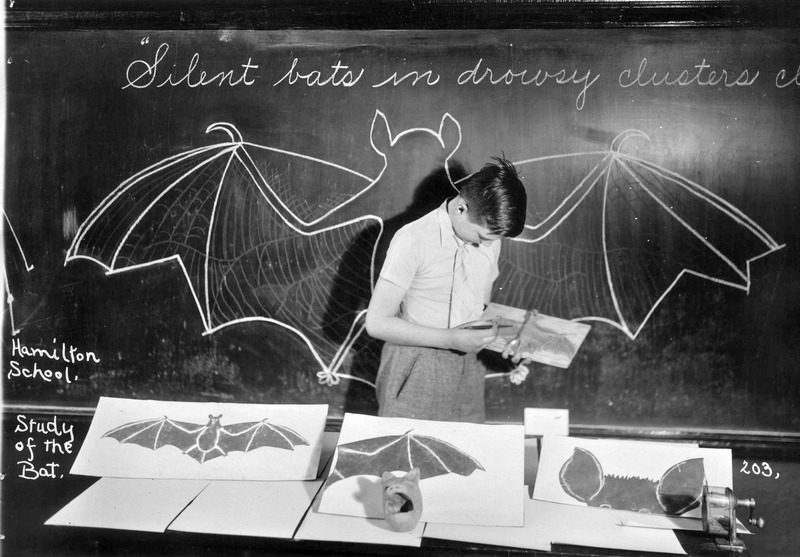 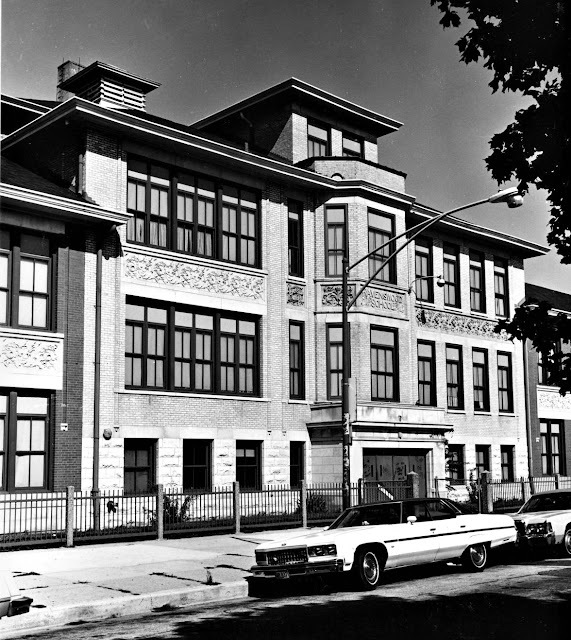 The Level 1 school was one of the first in Chicago to open a program for students with autism. 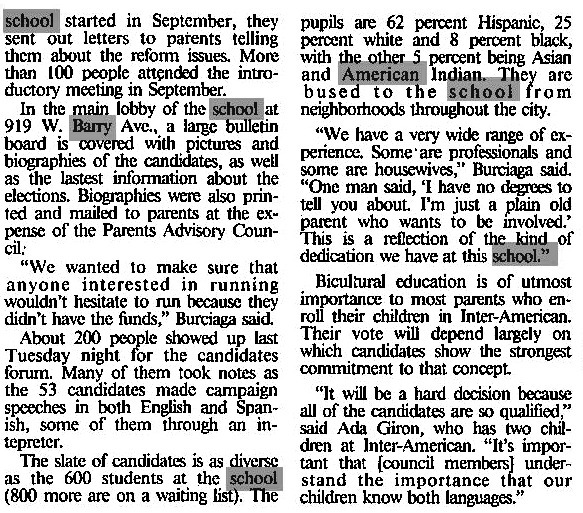 Younger students take Arabic lessons, while middle schoolers learn Spanish. 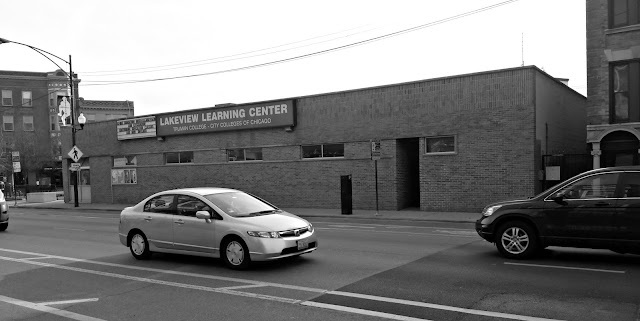 This Lake View school, 2815 N. Seminary Avenue offers violin and guitar lessons, dance classes, flag football and volleyball. Teachers and students applaud the school's ambitious coursework and support systems. 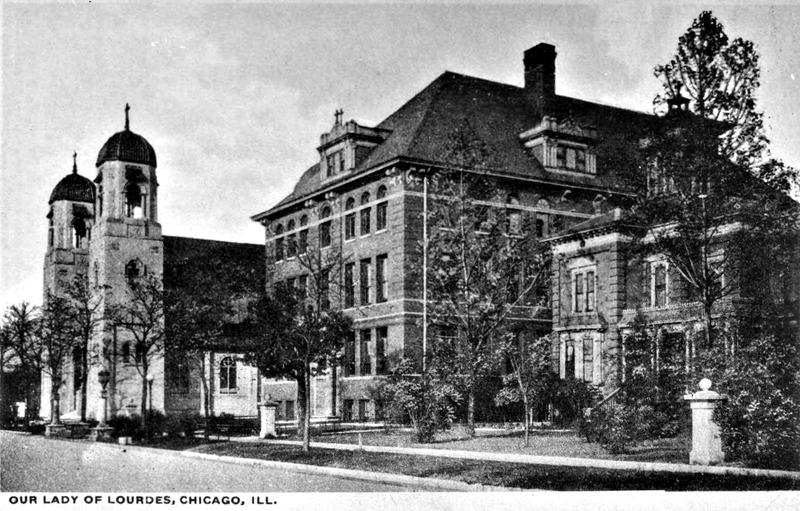 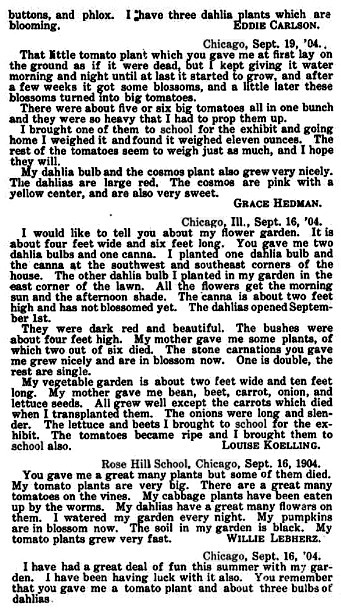 Built in 1908 and for many years in the 20th century housed students who were 'physical impaired' according to some articles from the Chicago Daily News Archives shown below. 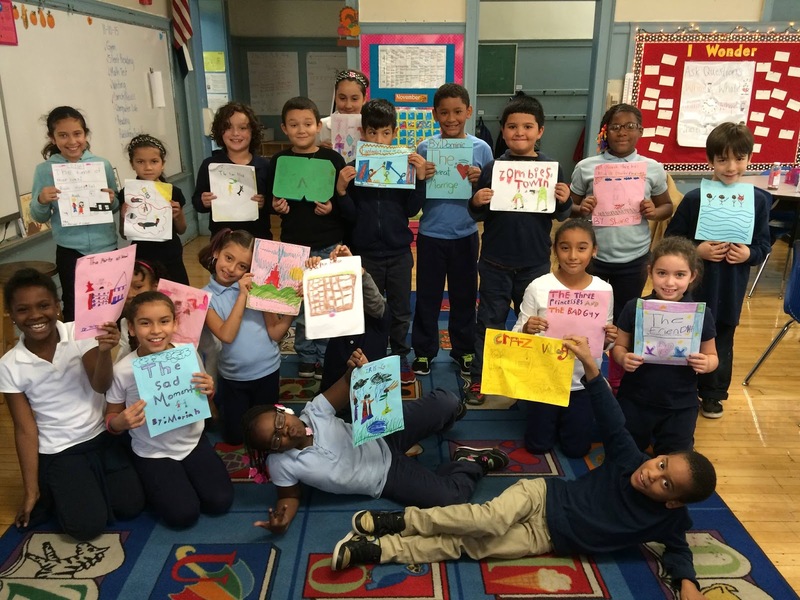 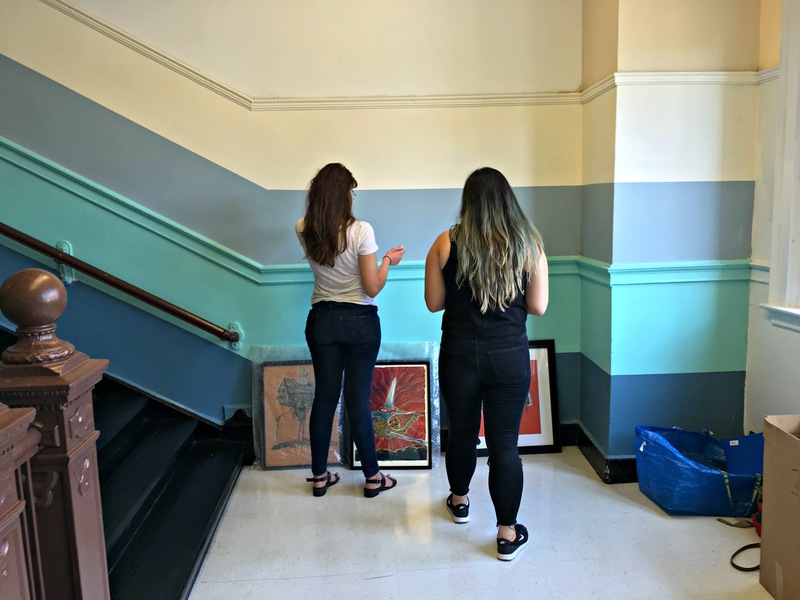 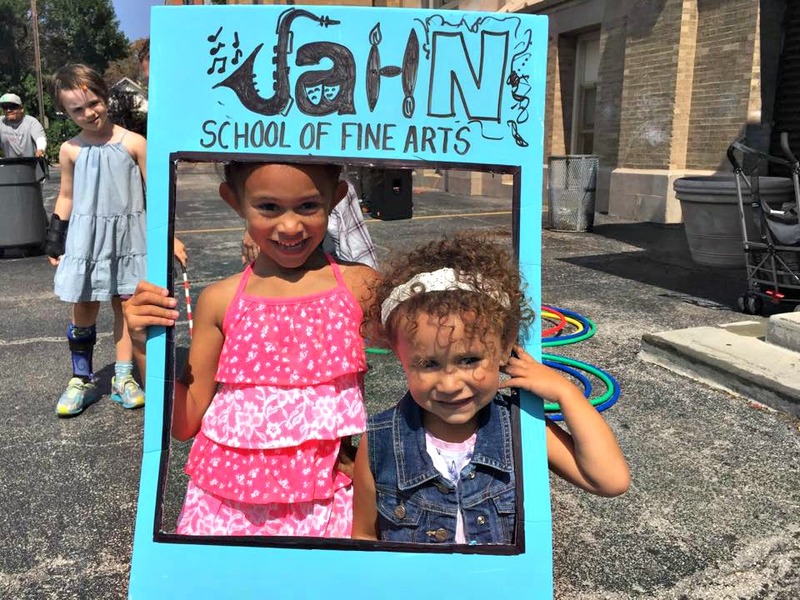 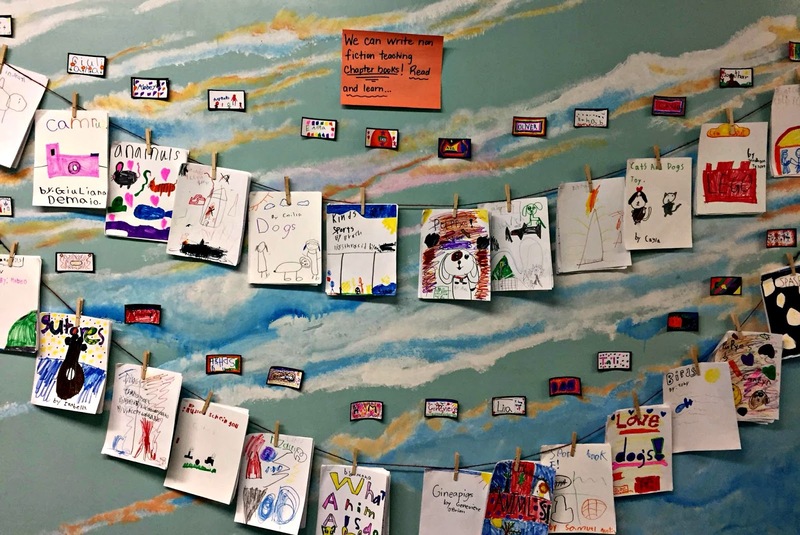 Jahn Elementary: Focused on fine arts, Jahn has given students opportunities to explore the street art movement of Buenos Aires and beautify their school. 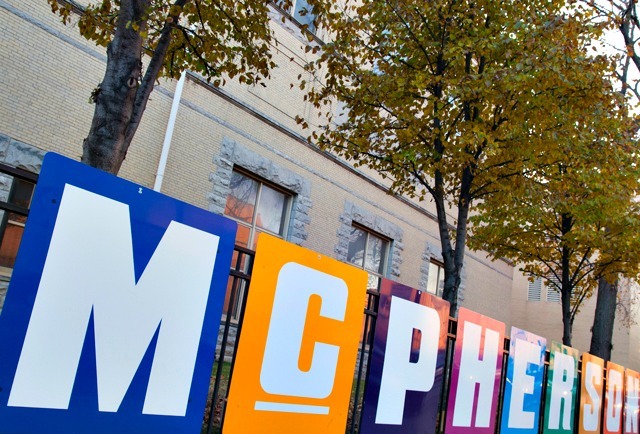 The school partners with Emerald City Theatre, DePaul University and The School of the Art Institute of Chicago to offer theater, art and music programs. 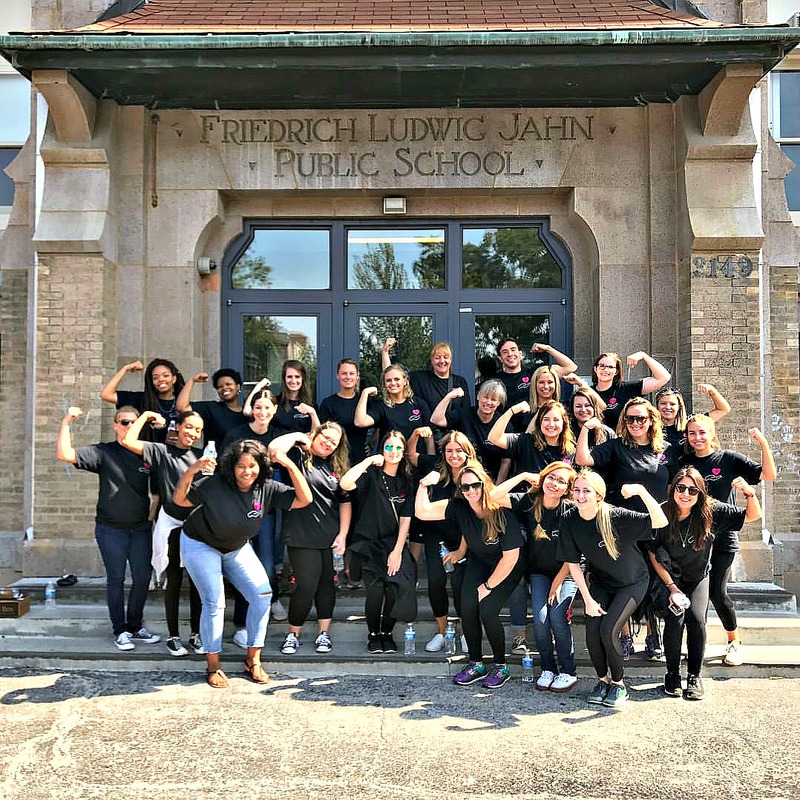 As an inclusive school, Jahn educates children with and without disabilities together with the goal of improving academic success and social outcomes for all the students. 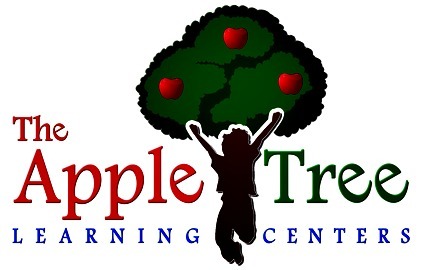 It also offers daily structured recess and social emotional curriculum. 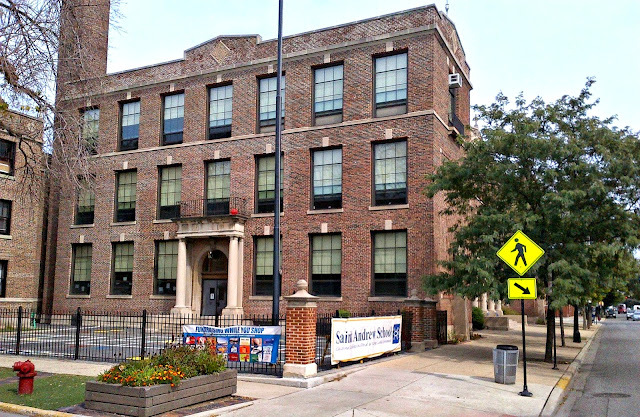 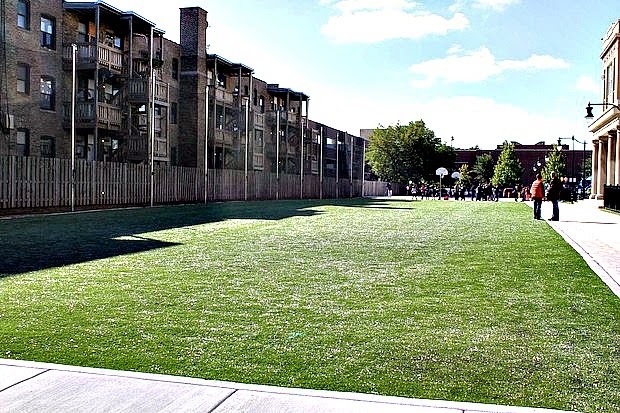 The North Center [neighborhood] school, 3149 N. Wolcott Ave., is rated Level 2, and parents find it offers a welcoming community. 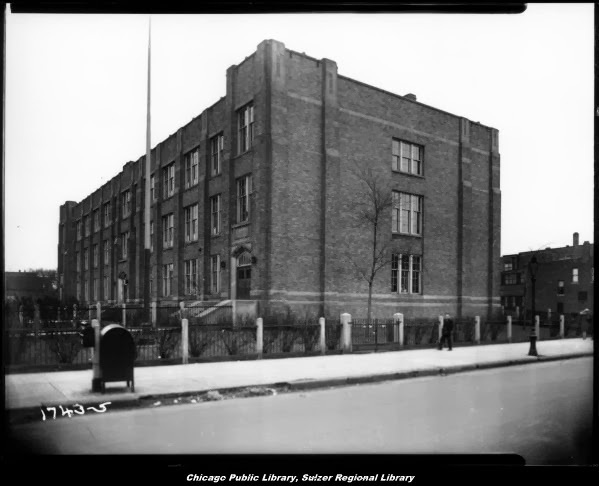 Official mailing address was 2625 N. Orchard Street when the second building was constructed in 1937. 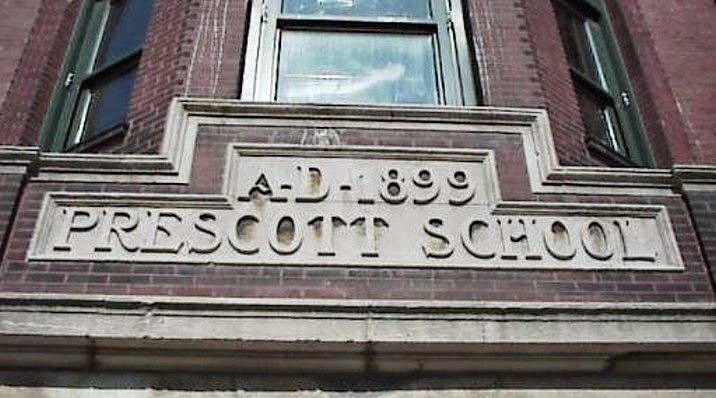 Alcott serves grades pre-kindergarten through eighth grade. 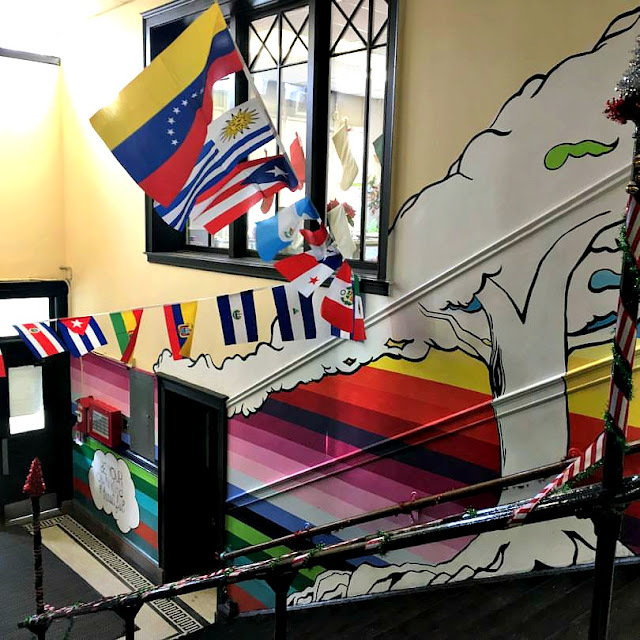 Dedicated faculty, community partnerships and over 400 students representing more than 200 families make up the vigorous Alcott community. Our sprawling grounds include plenty of green space and a school garden that serves as a teaching lab for healthy eating. 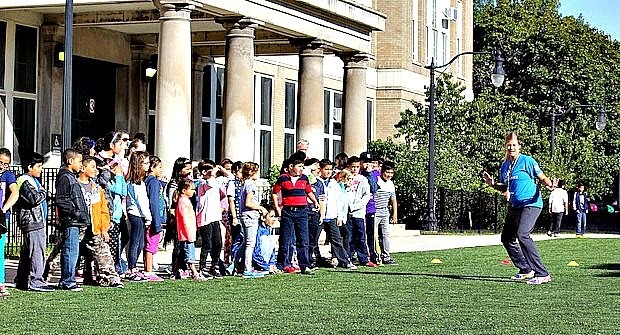 In addition to our integrated curriculum, they offer instruction in Mandarin Chinese for students K-8, perform an annual Shakespeare medley and offer a rich array of after-school programming. Alcott is a preKinder to 12th grade college prep school. The elementary campus is located in Lincoln Park and the high school is located in Roscoe Village. 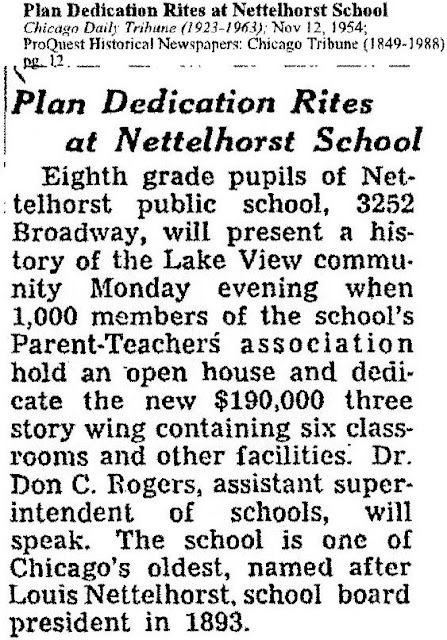 This school originally housed sixteen rooms and had a student capacity of 972 in the District of Lake View. 'Lake View' by Matthew Nickerson. 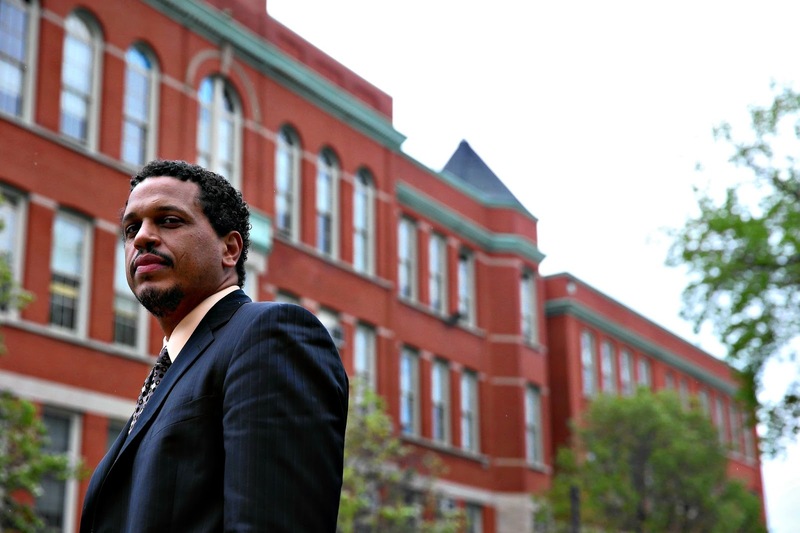 Blaine Elementary School Principal Troy LaRaviere, an outspoken critic of Chicago Public Schools and Chicago Mayor Rahm Emanuel, has been ousted in a sudden change that left most in parents shocked. 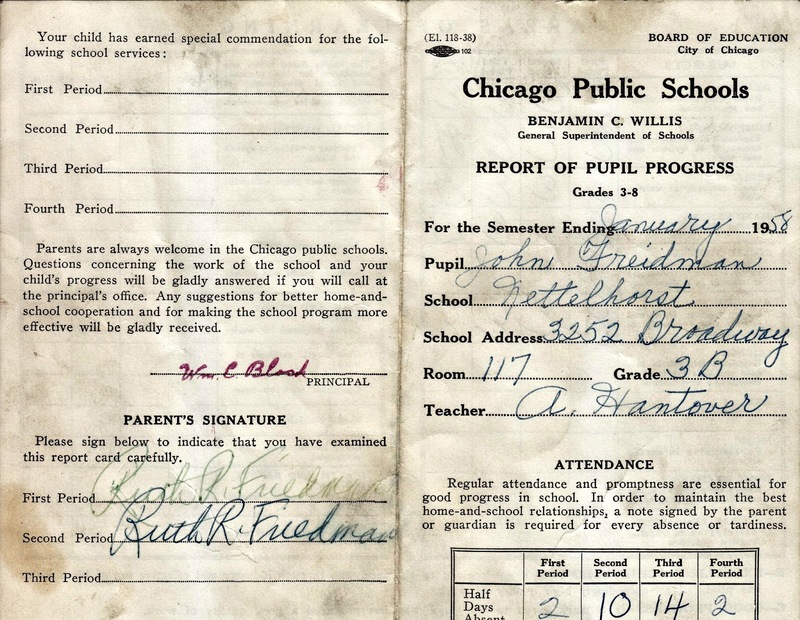 His politics ended this career in the Chicago Public Schools. 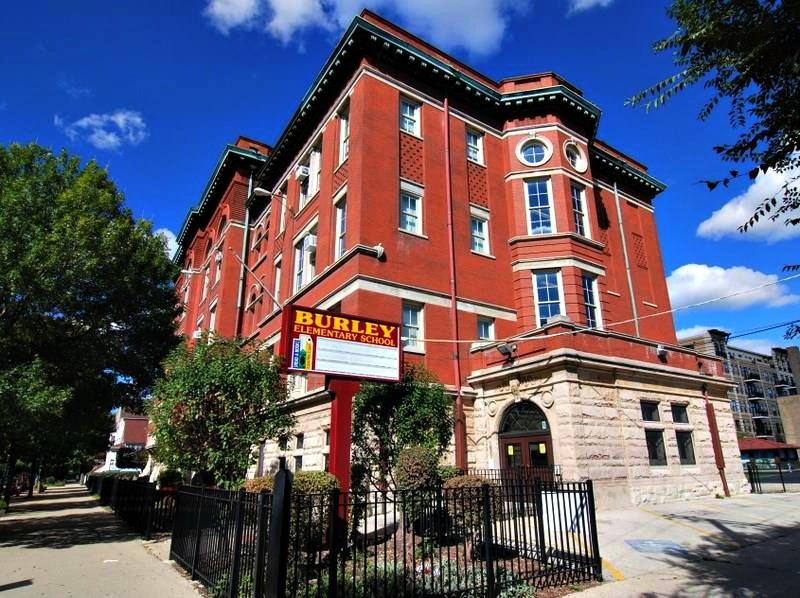 Burley School: Similar in size to Agassiz, Burley School is located one block south of Lincoln, Ashland and Belmont in Lakeview. 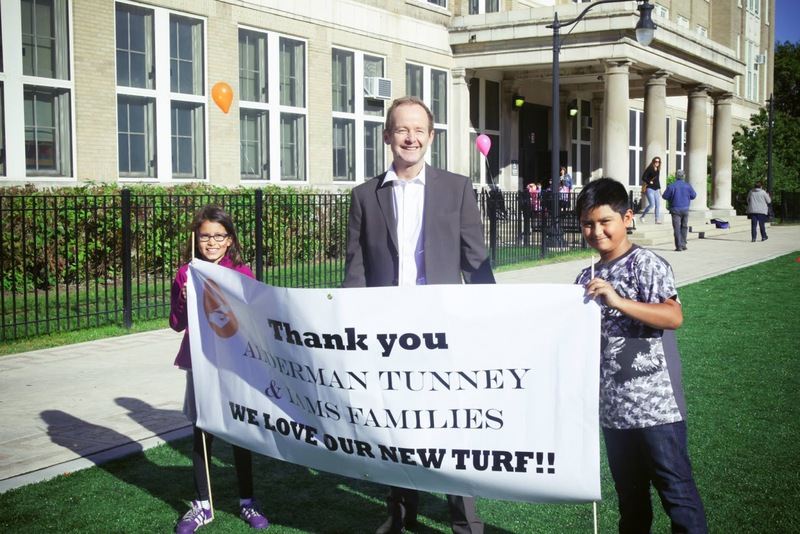 The Level 1+ school ranks in the top 5 percent of schools in reading and math attainment nationally, and parents, students and teachers give Burley high ratings across the board when it comes to school culture. 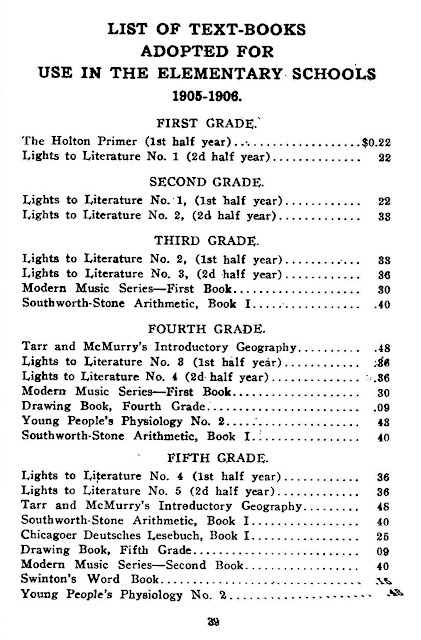 Burley prides itself on offering teacher-authored curriculum and active learning not based on textbooks. 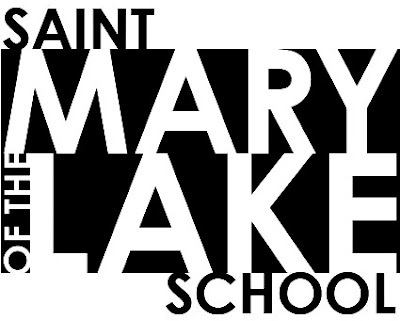 As a magnet cluster school, it focuses on literature, writing and technology, and weekly art and music classes. 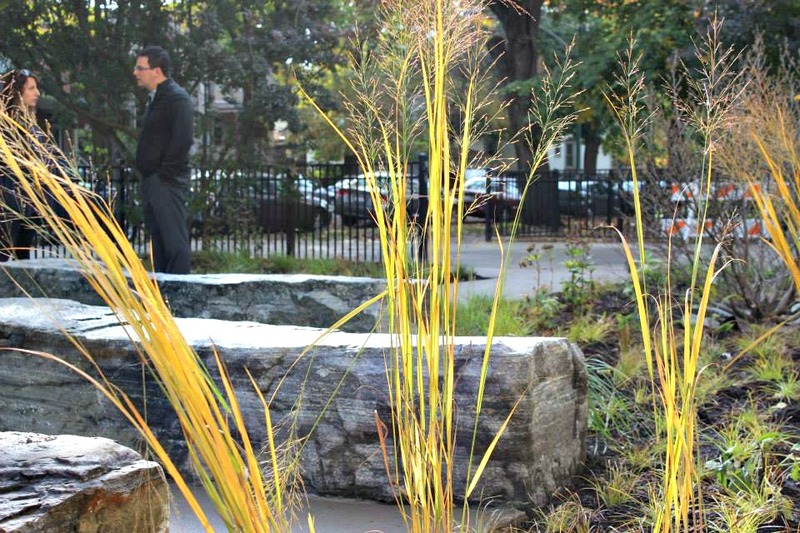 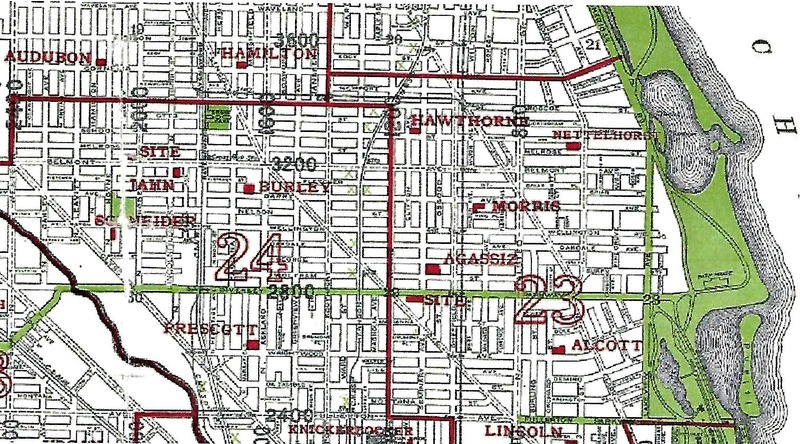 Like Agassiz, it offers a lottery process for families outside the neighborhood boundaries. 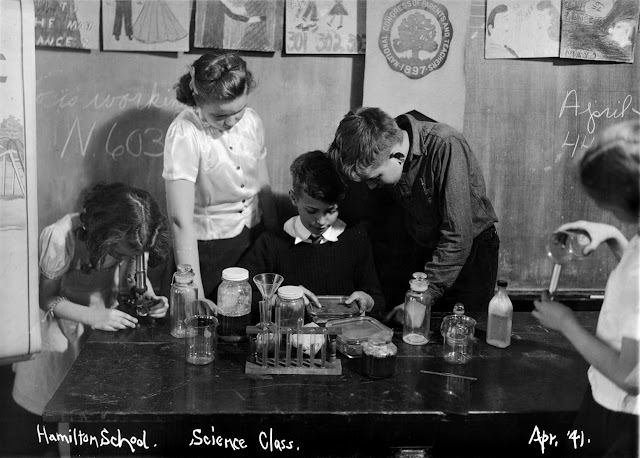 Extra-curricular activities include drama, cooking, woodworking, animation, dance and sports. 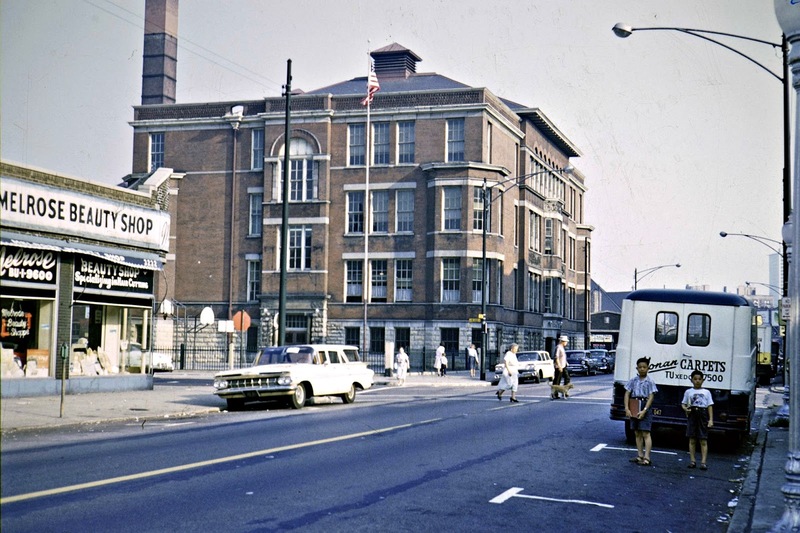 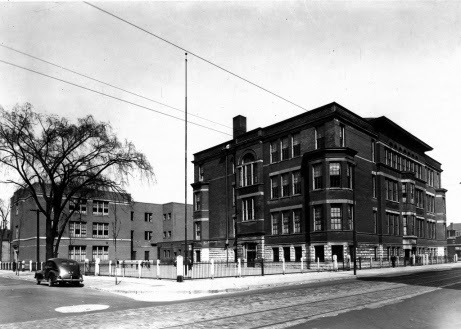 This school was originally located on the northeast corner of Grace Street and Sheffield Avenues. 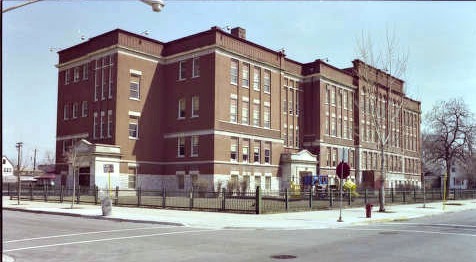 The current school is located at 832 W Sheridan Road. 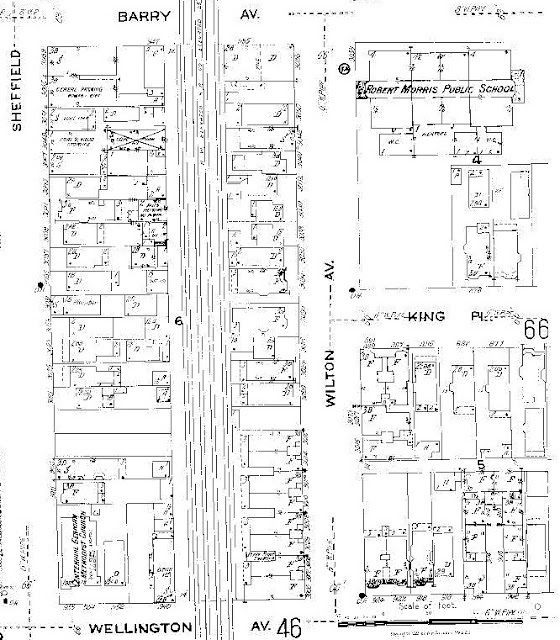 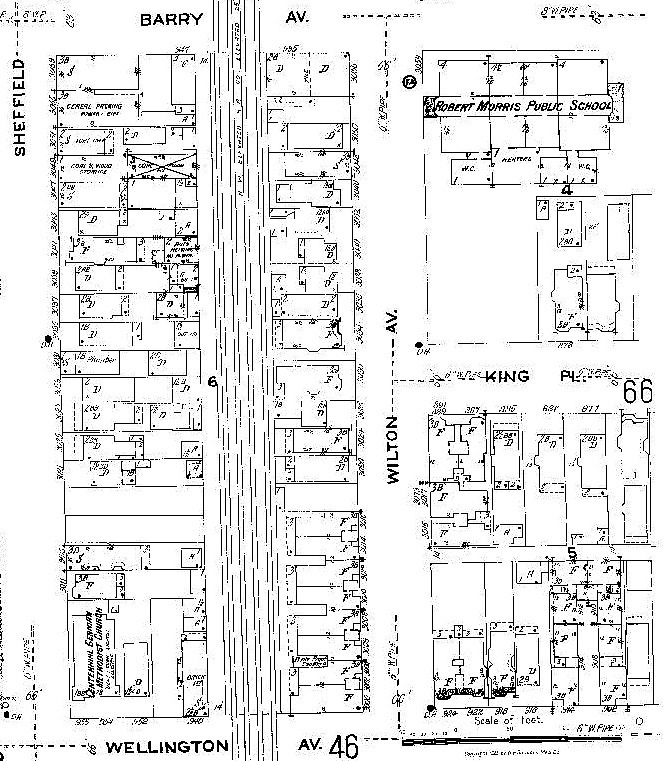 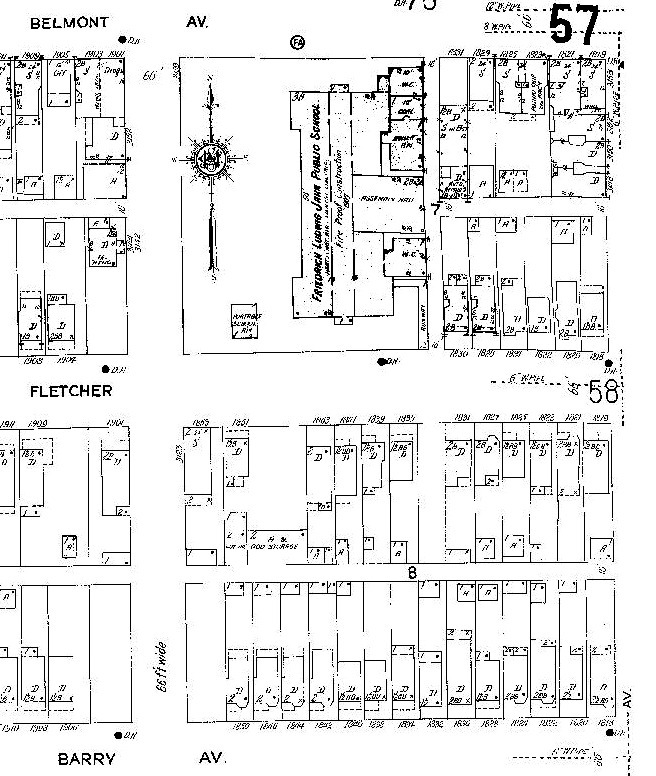 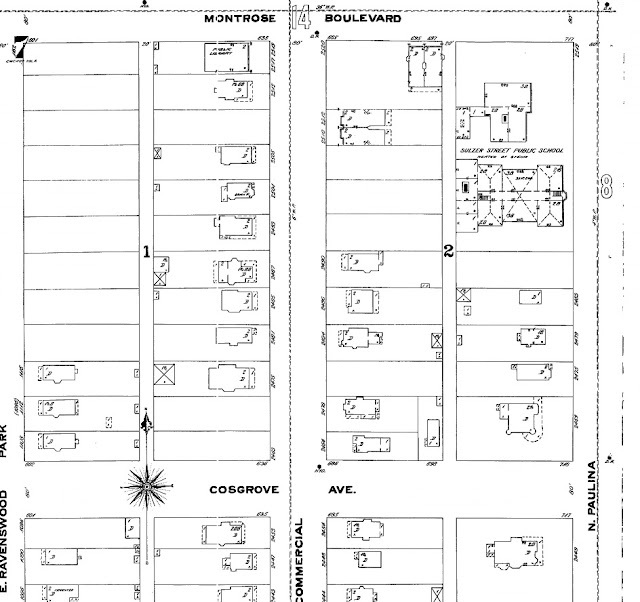 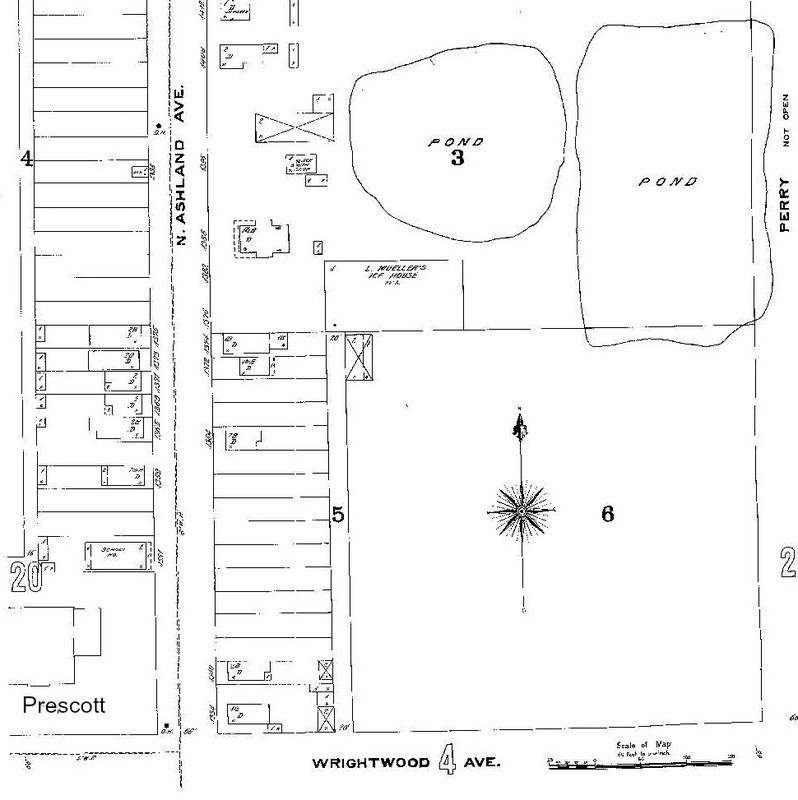 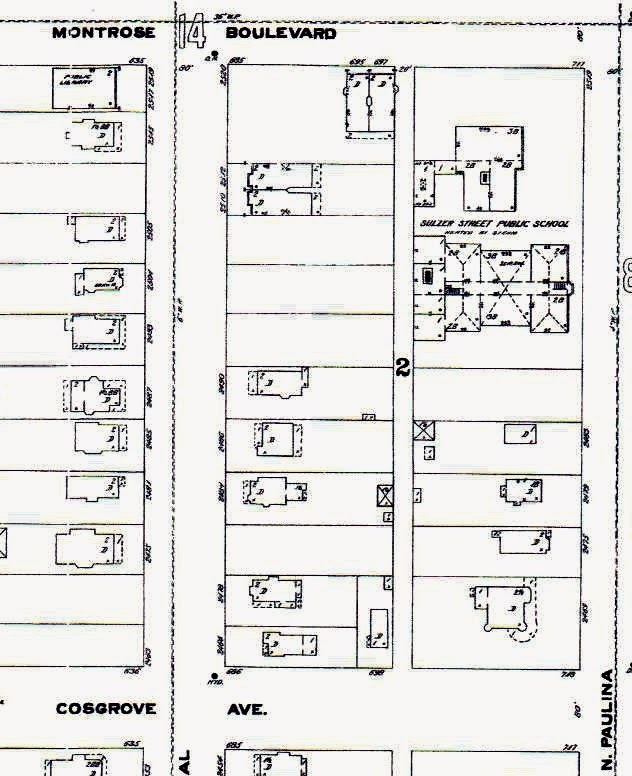 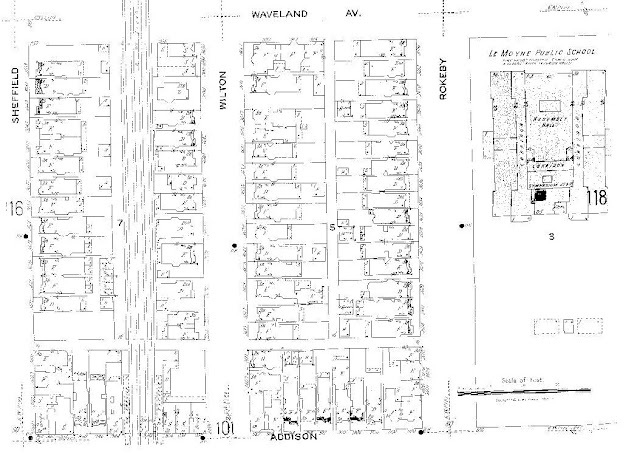 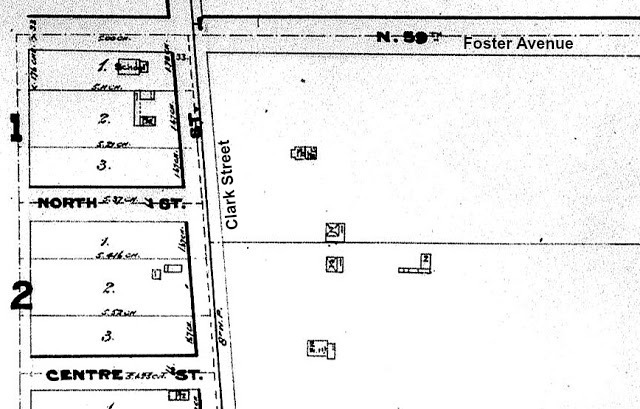 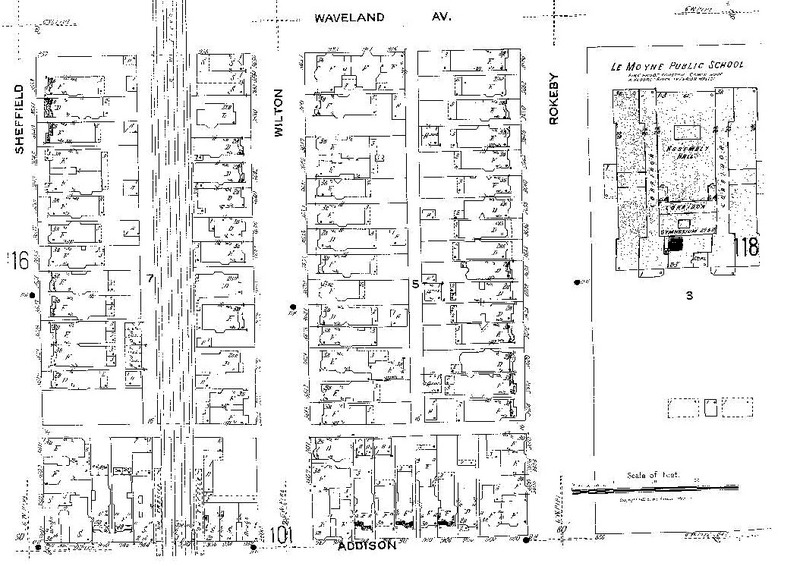 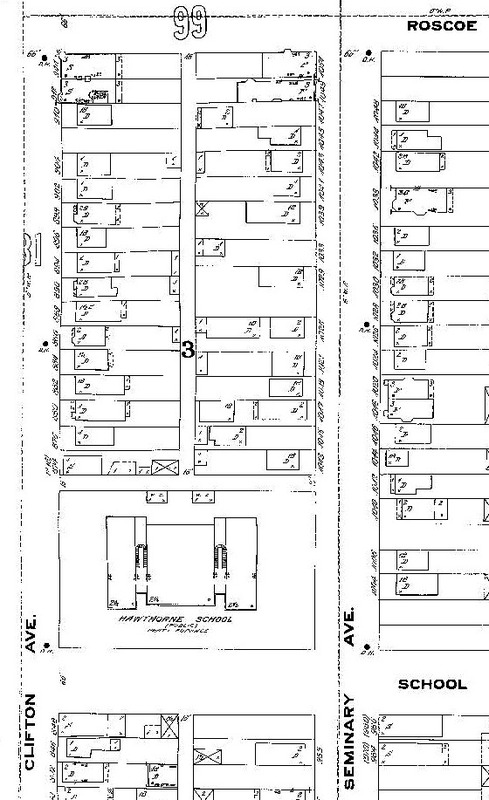 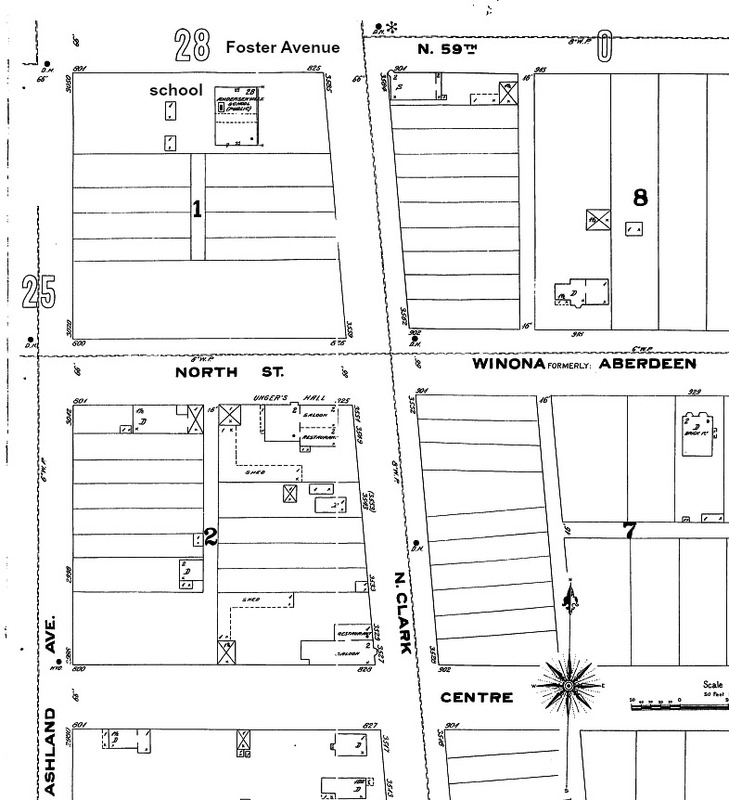 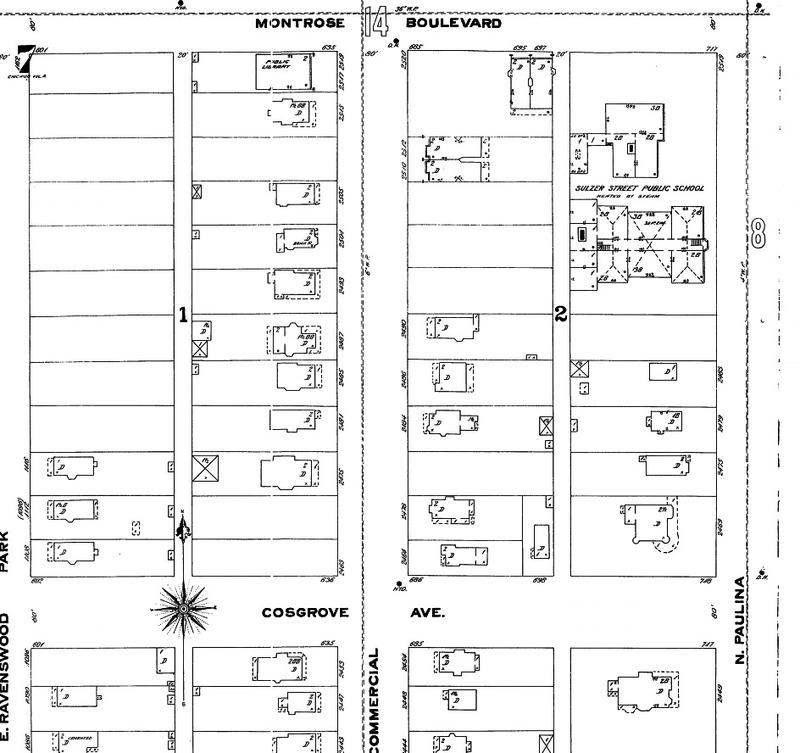 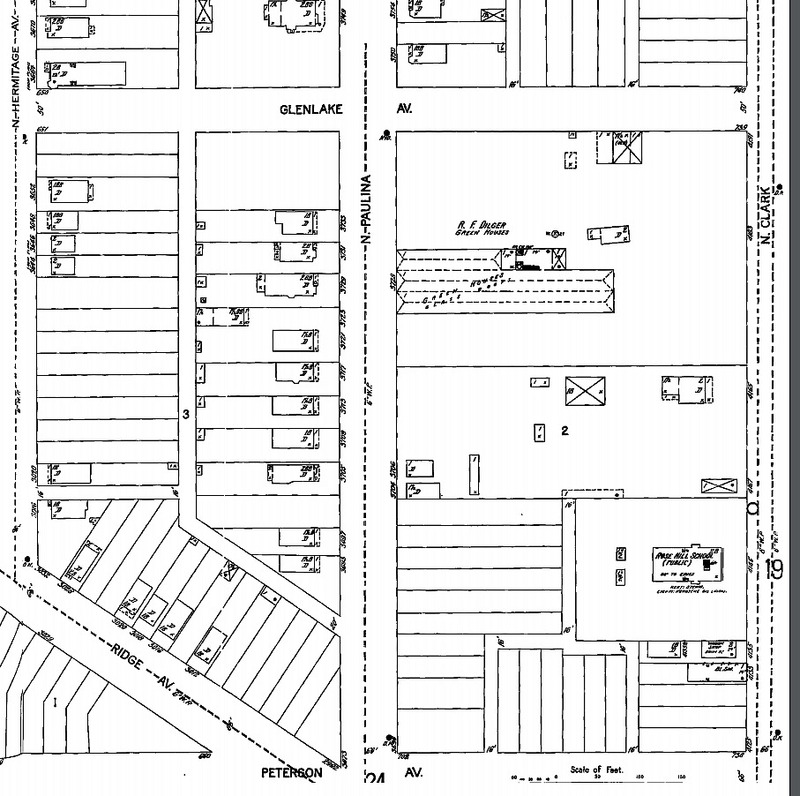 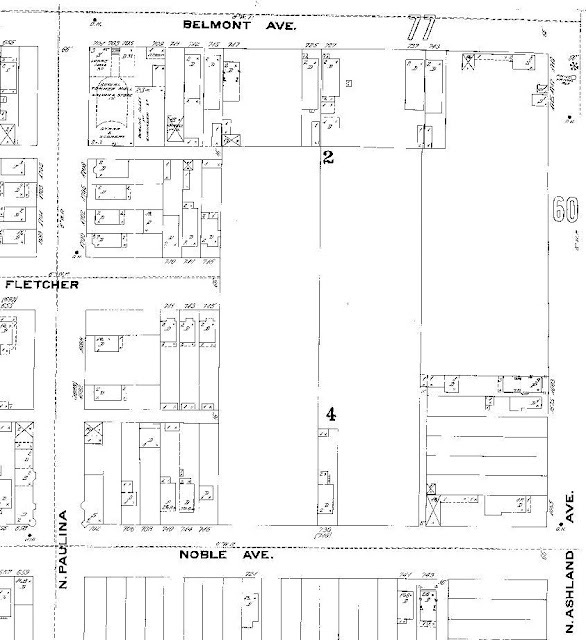 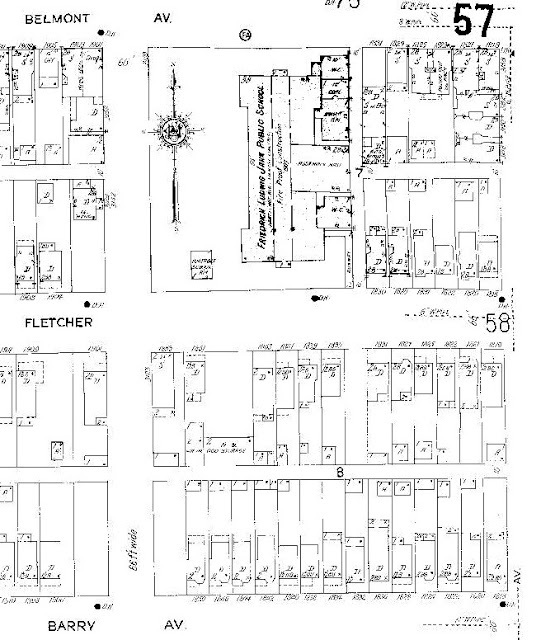 Interesting note about this map is that sometime after 1950 this block of Wilton failed to exist. Morris Elementary Elementary School was established by 1895 & the building was demolished probably by 1976. 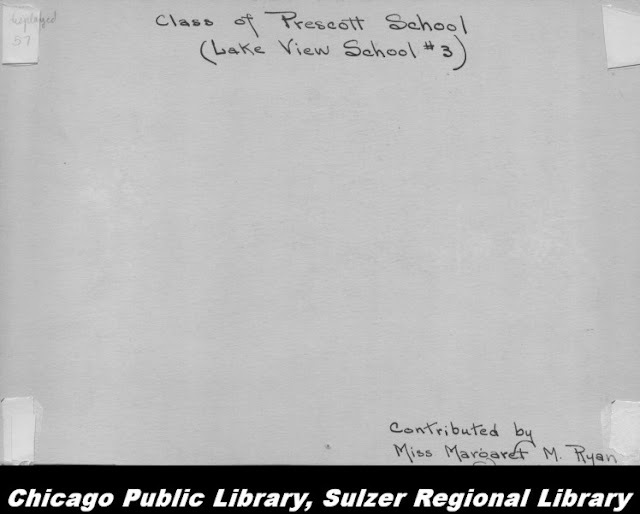 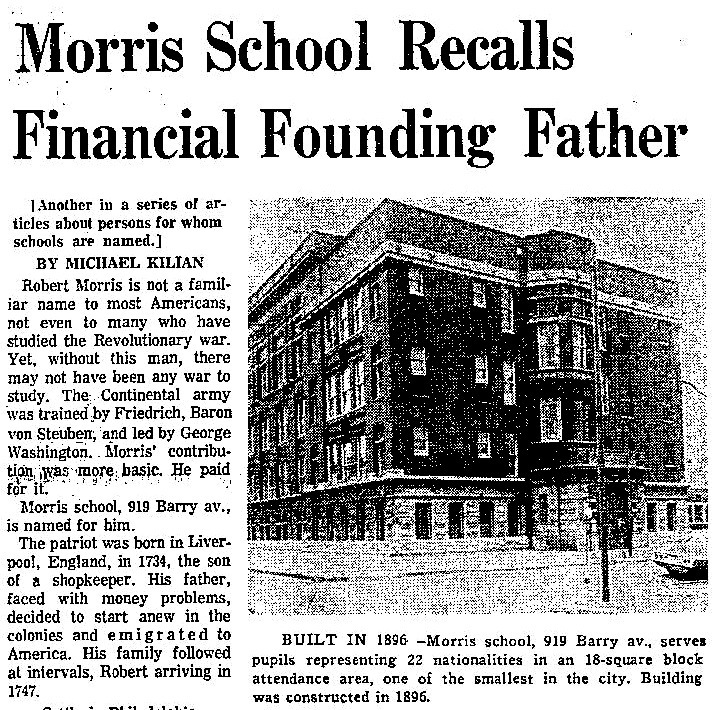 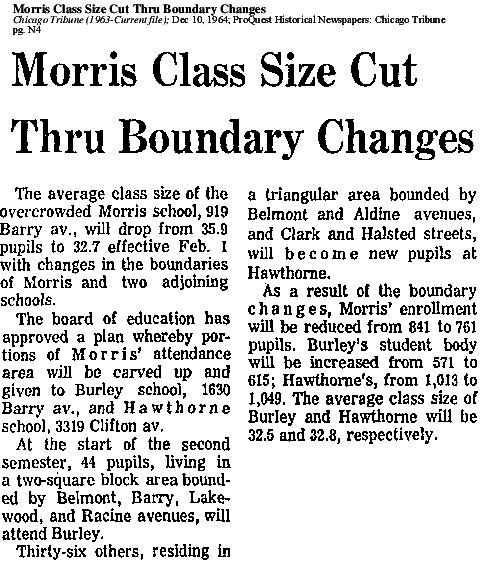 The Morris name was decommissioned from the Chicago Public School system. 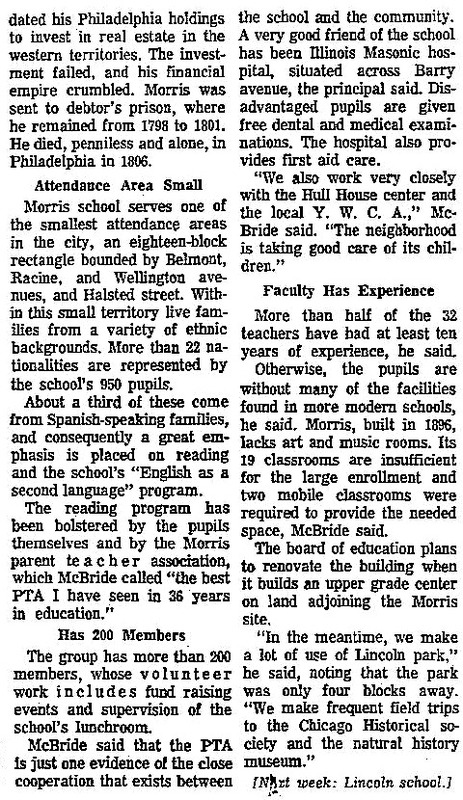 My educated guess is the CPS finally found the funds to build a new school for the Morris students in the mid-1970's and by the mid-1980's the building was integrated with both the Morris students with the Inter-American students. The building would soon lose the name of Morris to replaced by Inter-American Magnet, reflecting the dominate population. 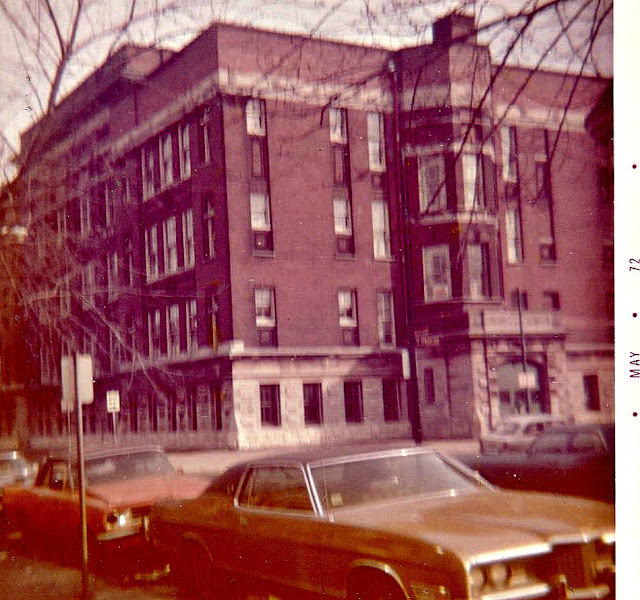 to its current location on Waveland Avenue. Apparently,the property and building was donated to the Chicago Public Schools by the wife of John V. Le Moyne solely for a 'special needs' student population in 1914. 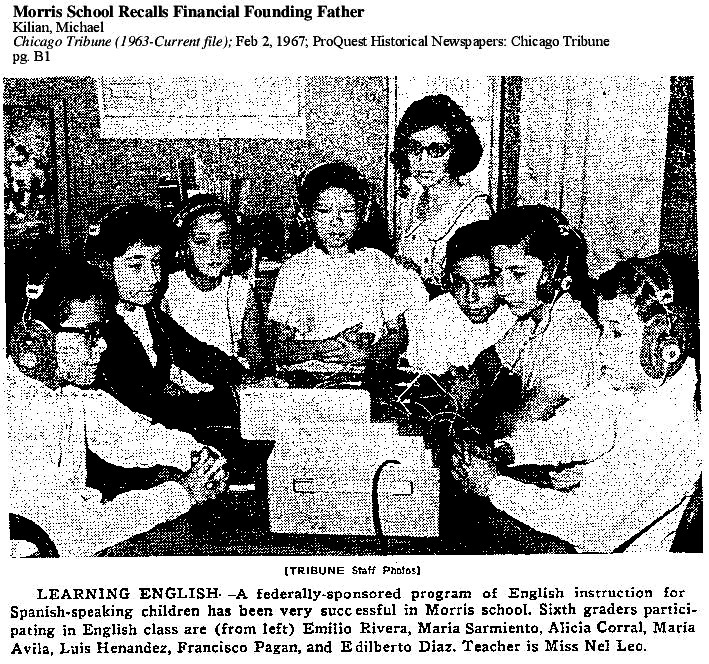 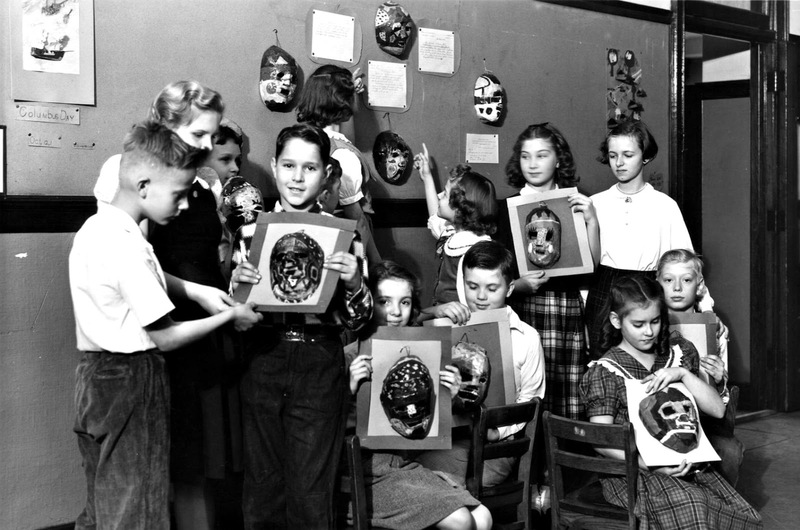 Inter-American began by two mothers, Adela Coronado-Greeley and Janet Nolan, who dreamed of a multilingual, multicultural school where children from varied backgrounds would be taught in English and Spanish in an atmosphere of cultural pride. 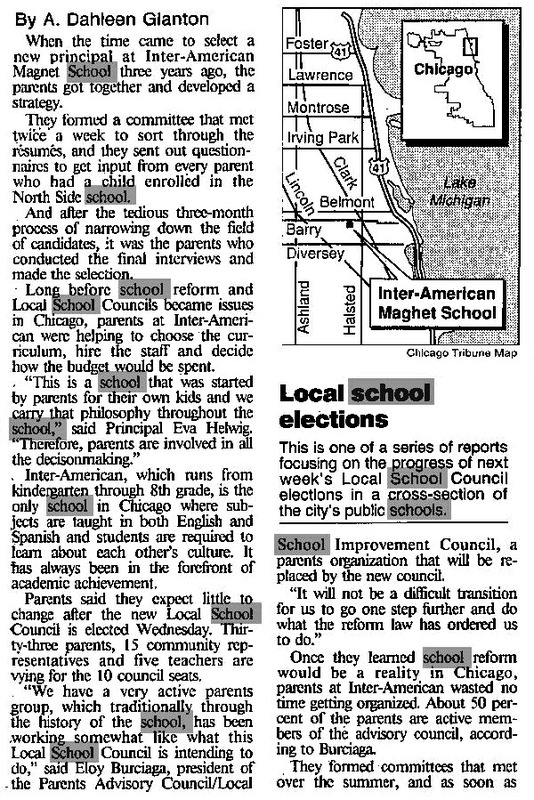 It is one of the oldest and most comprehensive dual language (also known as two way immersion) schools in the Midwest. 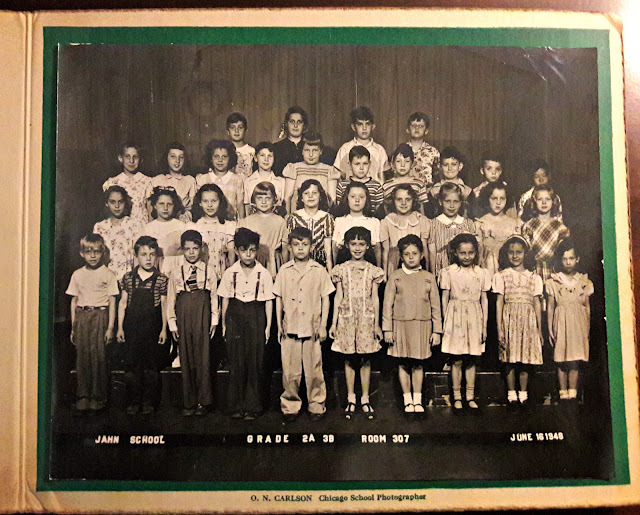 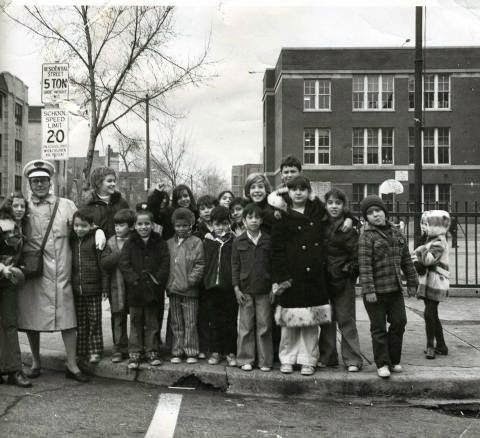 The preschool opened in September of 1975 in two rooms in the old Bartelme School in Rogers Park where Janet and Addy Tellez were the only teachers. 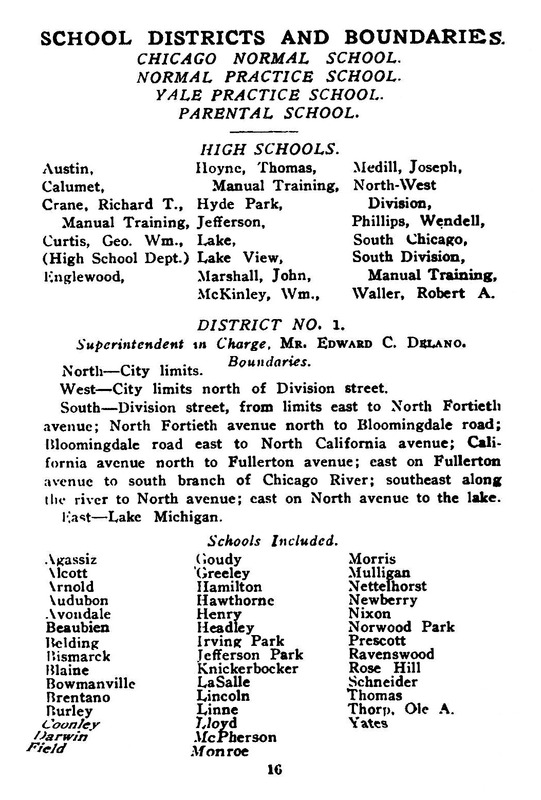 A single bus provided transportation for the students. 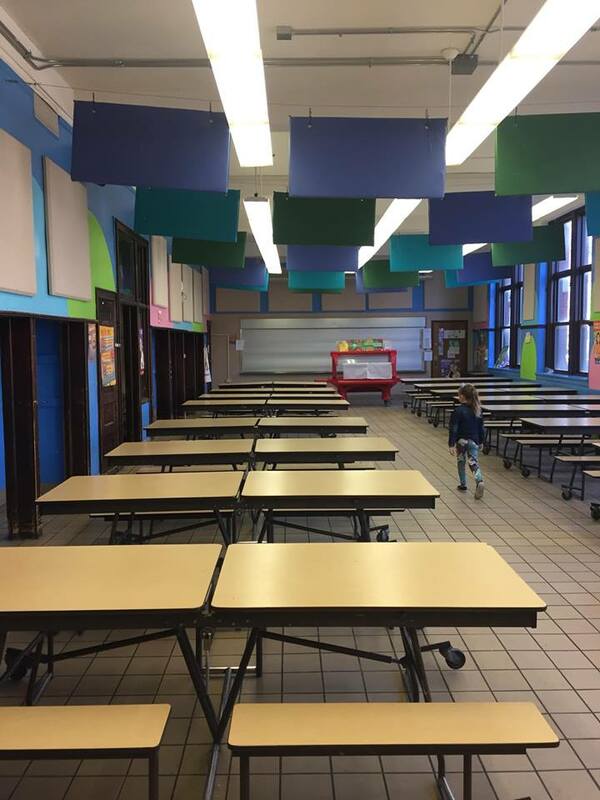 LeMoyne Elementary was initially designed exclusively for students with 'special needs' until the school policy changed to integrate the population into a mainstreamed classroom environment. 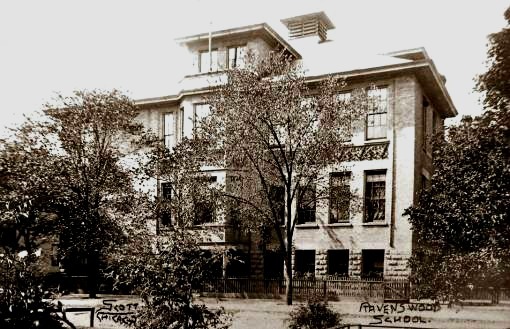 The Le Moyne building was re-named a year or so later to be called Inter-American Magnet School. 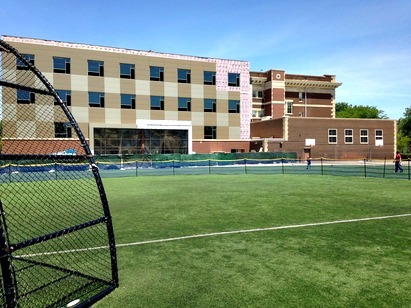 Simply, Le Moyne lost their student population and Inter-American need the extra space. 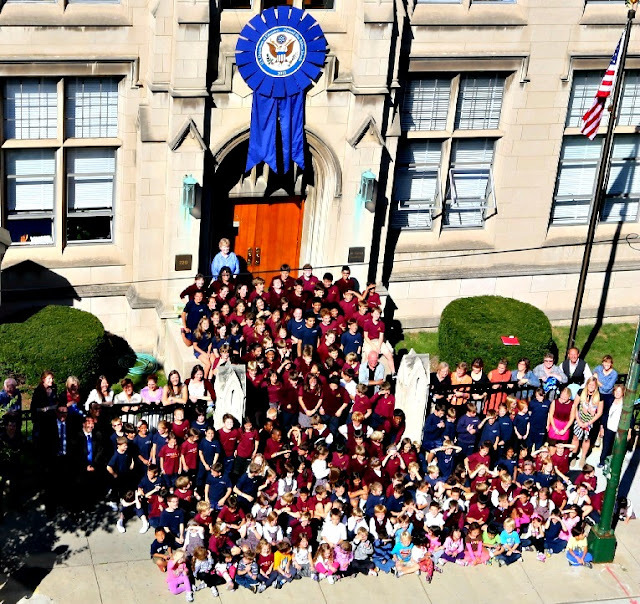 Find information about Inter-American Magnet School on Facebook. This was a missed opportunity on my part not collecting images & text of the school at this particular location when I began this blog in 2007. 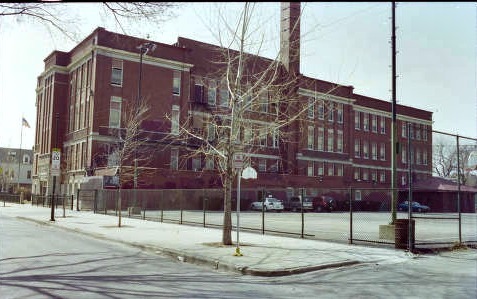 Due to a CPS restructure in 2013 this location was closed and responsibilities transferred to formerly named Stockton School in neighborhood of Uptown. 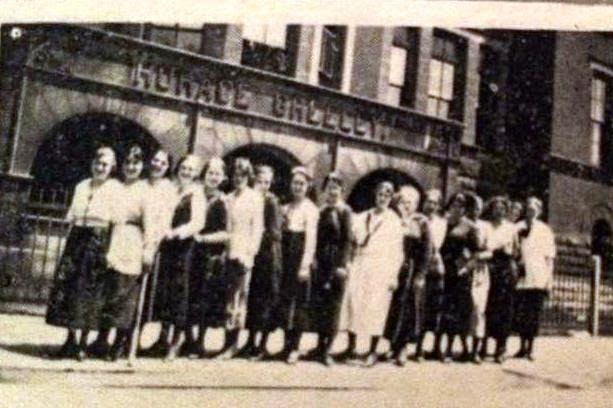 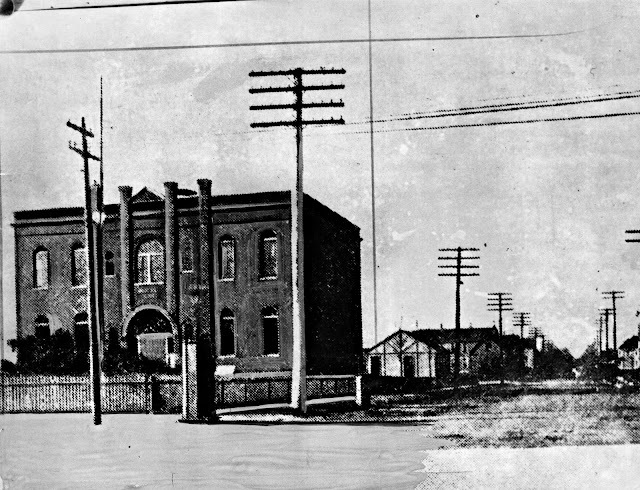 I am currently requesting any pictures you may of this old location - but this is what I have on the location since 1928. 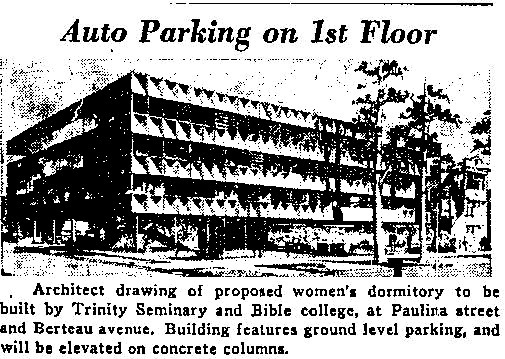 While the building was on constructed by 1928 there were plans to constructed more under the name of 'Swedish Free Church Bible Institute'. 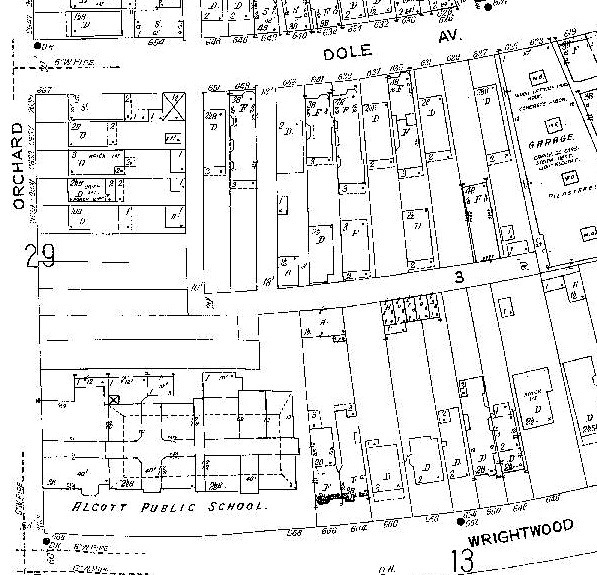 The edited 1950 map below shows those additions but under the name of 'Trinity Seminary & Bible College'. 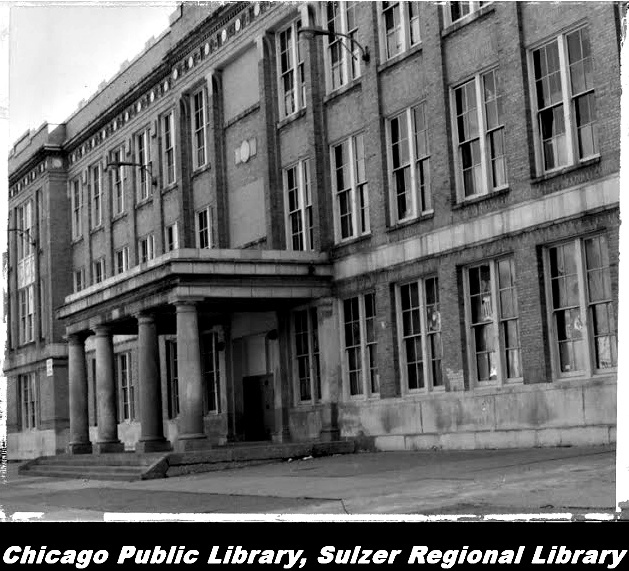 The structure north of it now a 'dining area'. 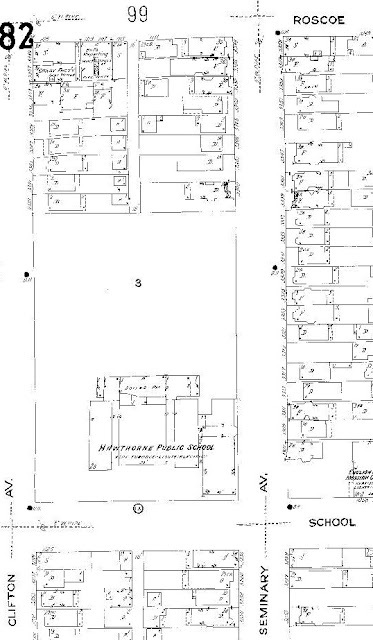 The future school was laid out as dormitories. The dorm-like structured remained during the Courtney School years. Courtney was one of the 29 schools that were closed by Chicago Public Schools and to be sold by 2017. "Courtenay Language Arts Center is not only a school, but a close knitted community; a family. 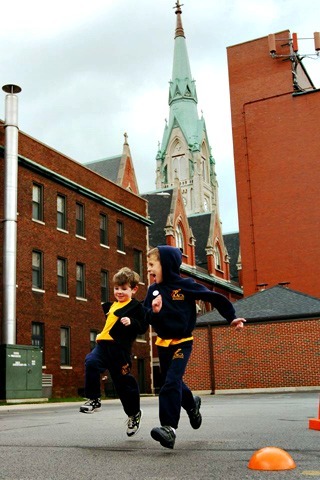 Your children will not only learn the needed skills to achieve in life, but will also develop friendships that will last beyond elementary. 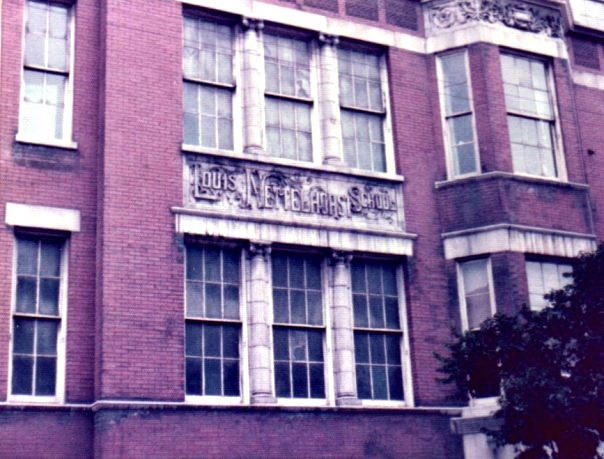 I went to this school, and I honestly believe that Courtenay prepared me for high school. Currently, I go to Lane Tech, one of the best high schools in Illinois. 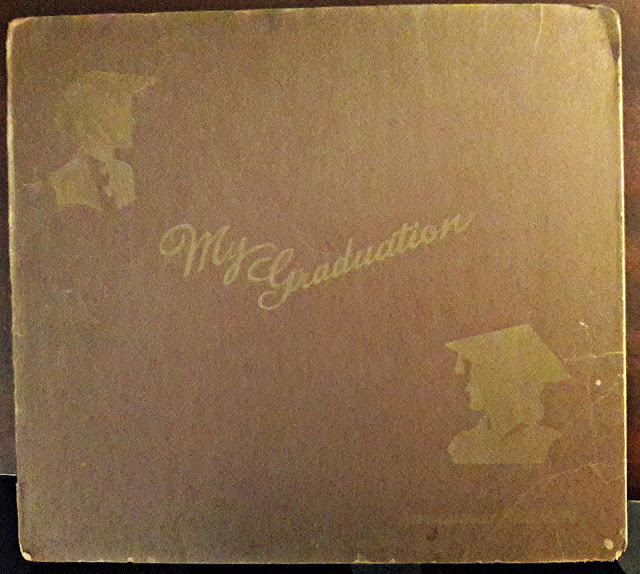 Thanks to Courtenay, I am now enjoying my time there. The staff is very friendly and efficient, they truly do care about their students. 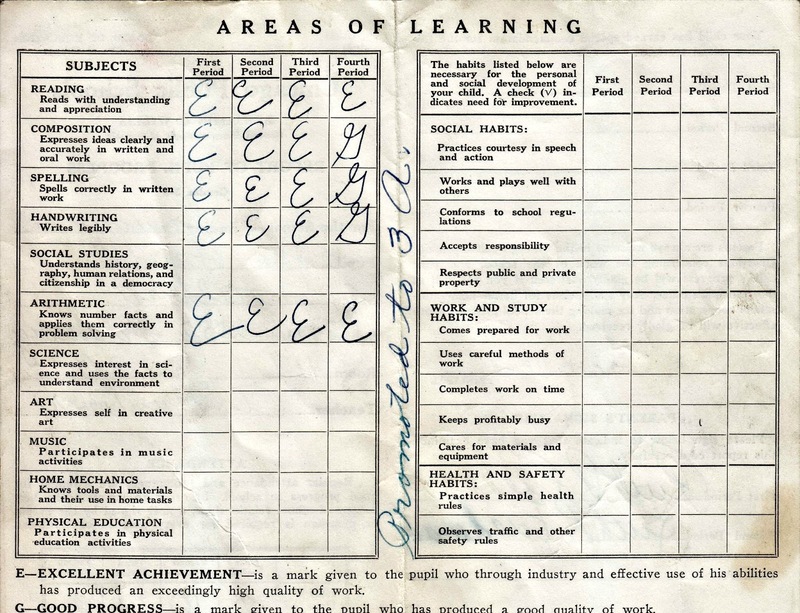 As a student there, I was encouraged to do my best every day. 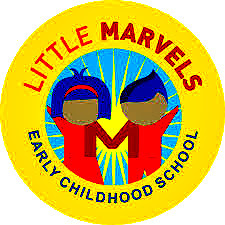 If you are considering a school for your child, look no further, this is the school for you." 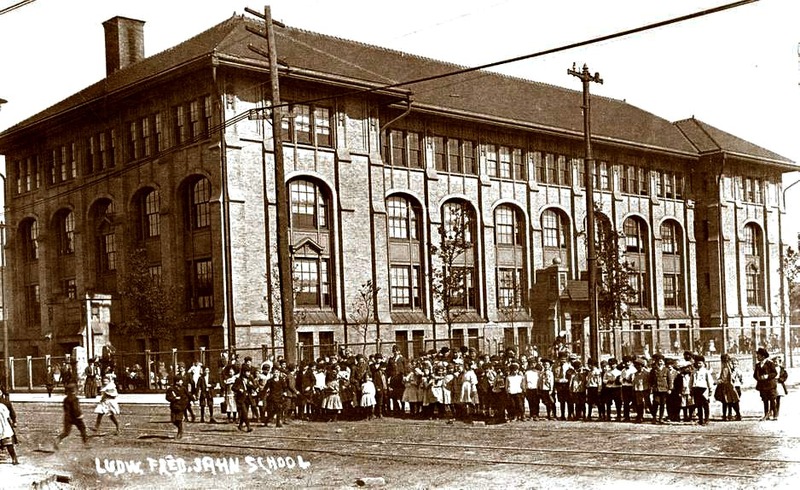 "I am a graduate from Courtenay that goes to Amundsen. 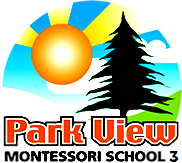 The teachers and staff at Courtenay are amazing and kind. 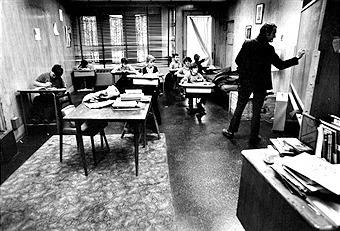 The teachers are relaxed and try hard to help kids get good grades. 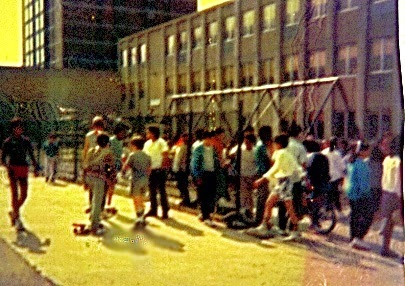 When I went I was part of C3 club where we learned about recycling and the earth. 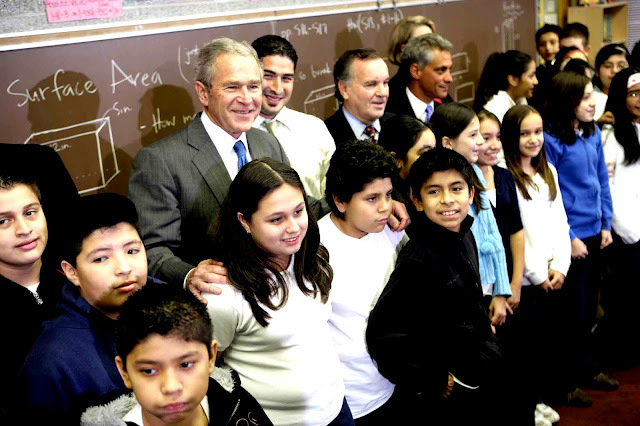 I was also part of the robotics club, even though we did not win it was an amazing experience." 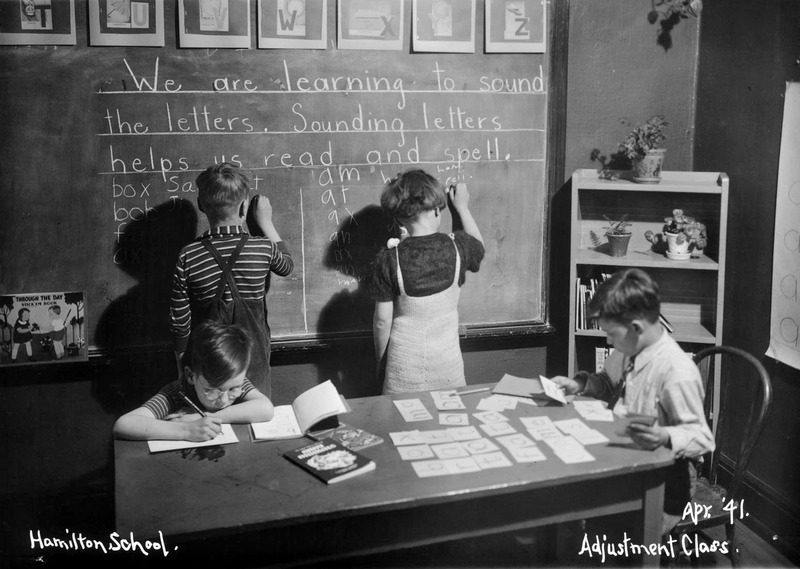 "Courtenay Language Arts School is a great school where children are put first. If you want your child to feel valued and learn leadership skills, then this is your school. 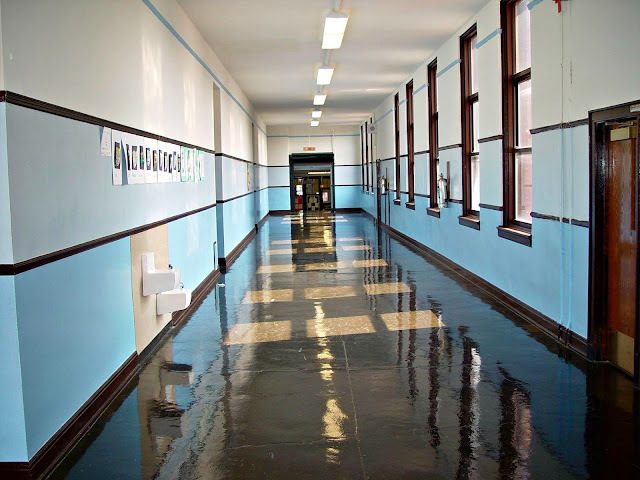 The school has excellent teachers and great leadership and support from the administration." 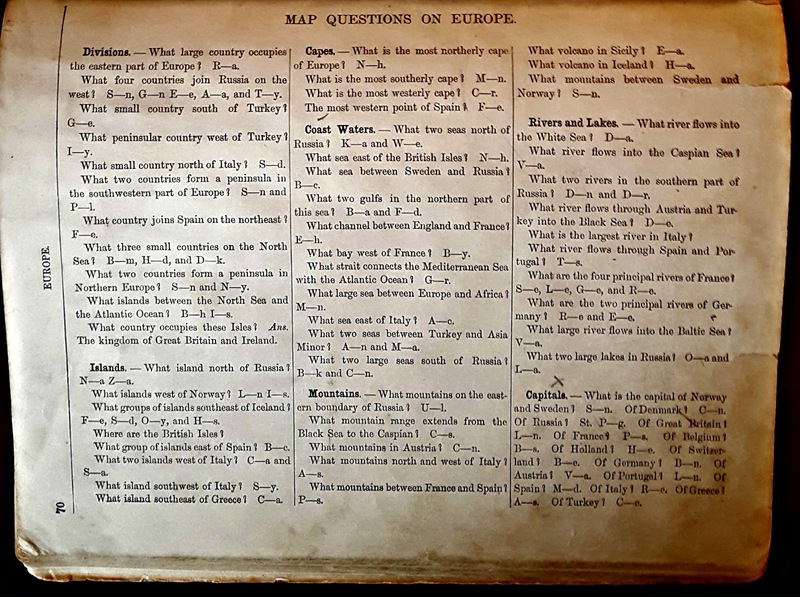 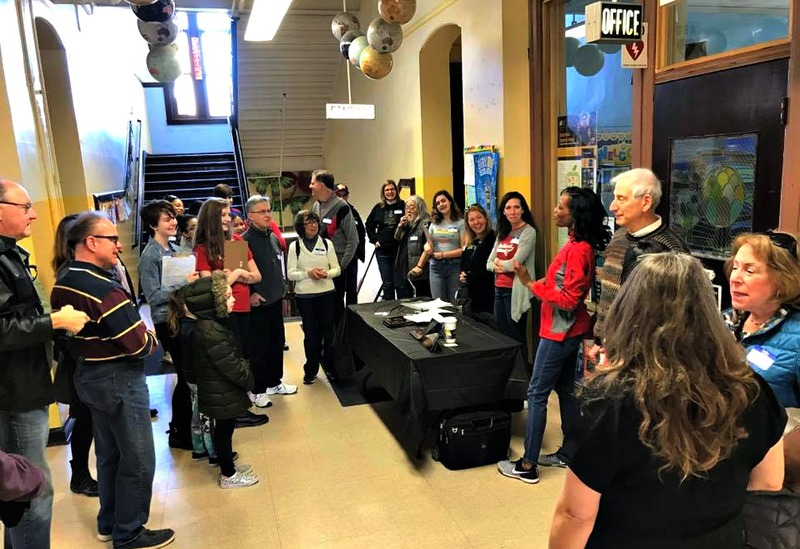 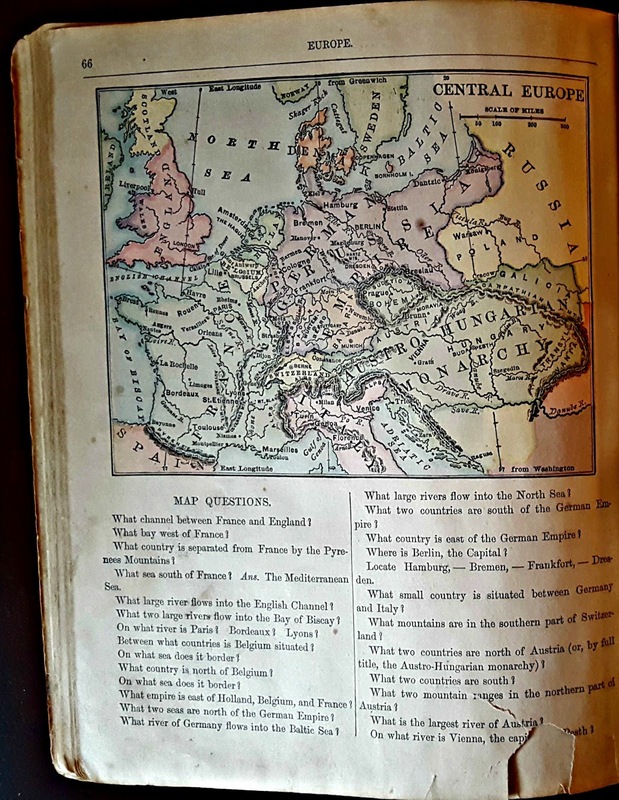 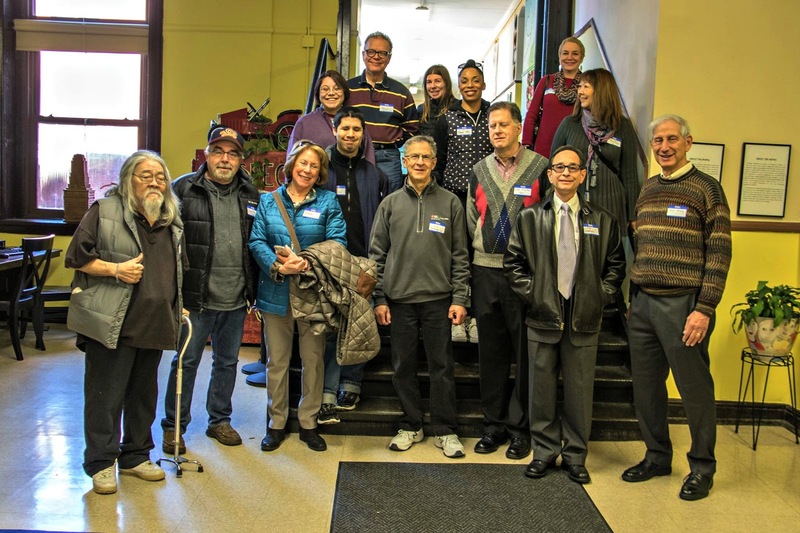 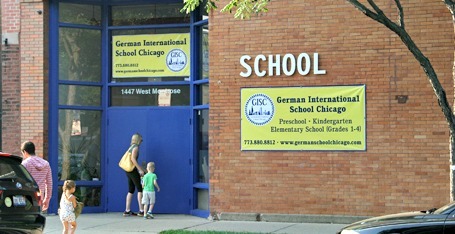 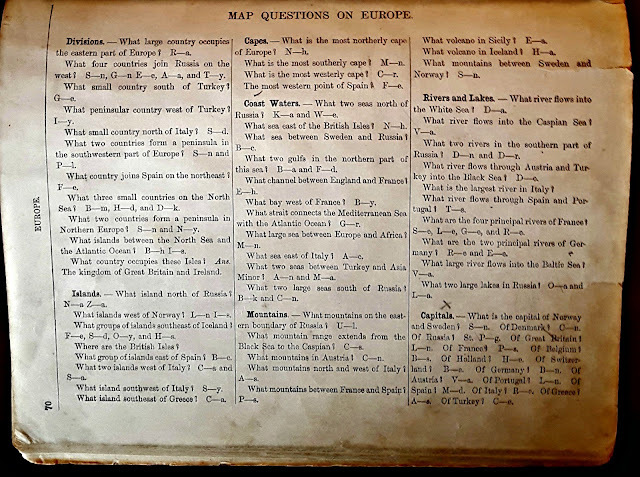 "In 2007, a few German, American and Austrian parents and educators got together to explore ways to establish a German immersion school in Chicago. 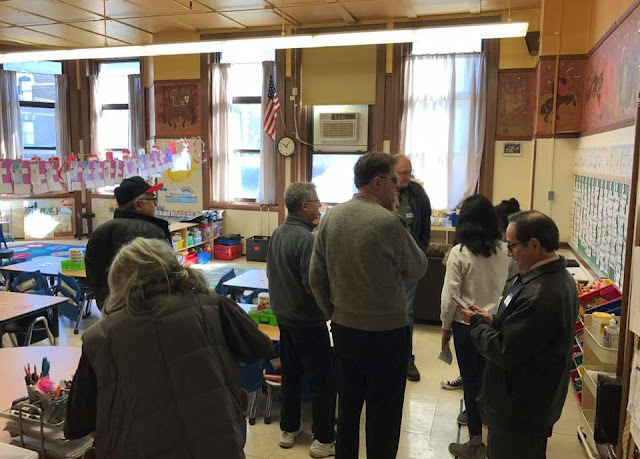 We found much interest in such a school and gained the support of members of Chicago-area German, Austrian and Swiss cultural and business communities. 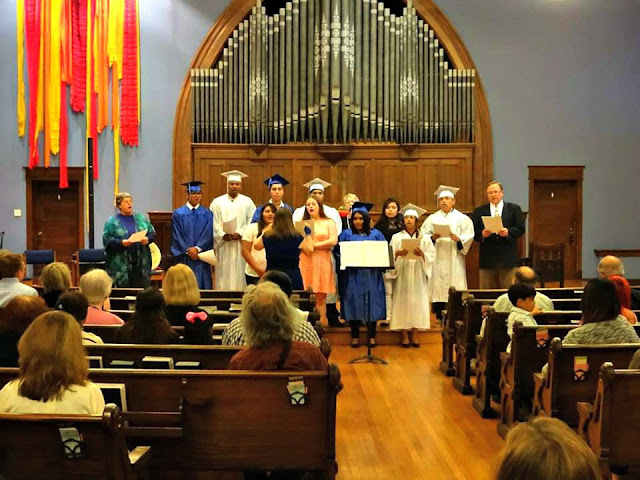 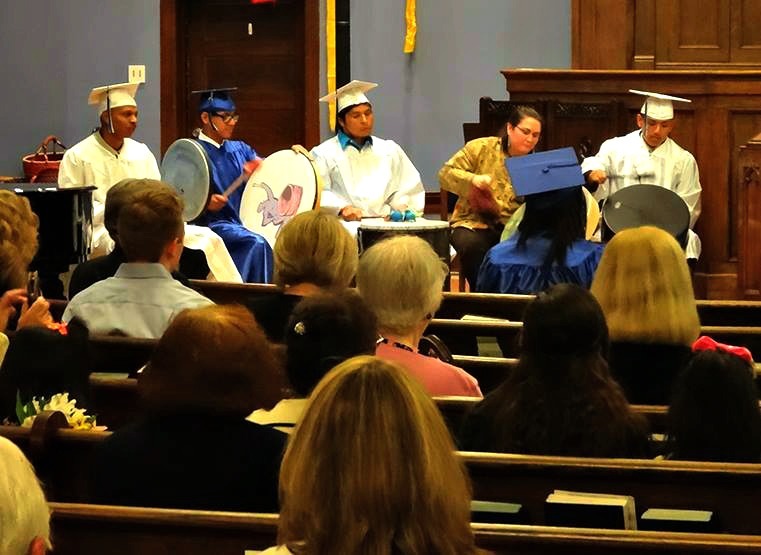 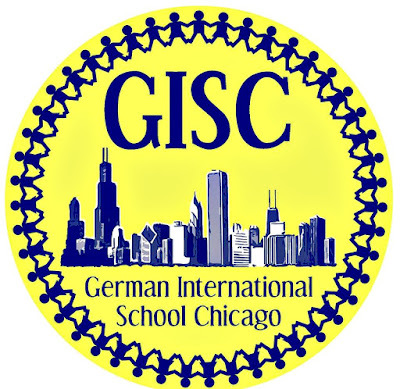 Consequently, we incorporated in December of 2007 as an independent, not-for-profit, co-educational pre-K through 12th grade German dual-language (German and English) school named German School Chicago. 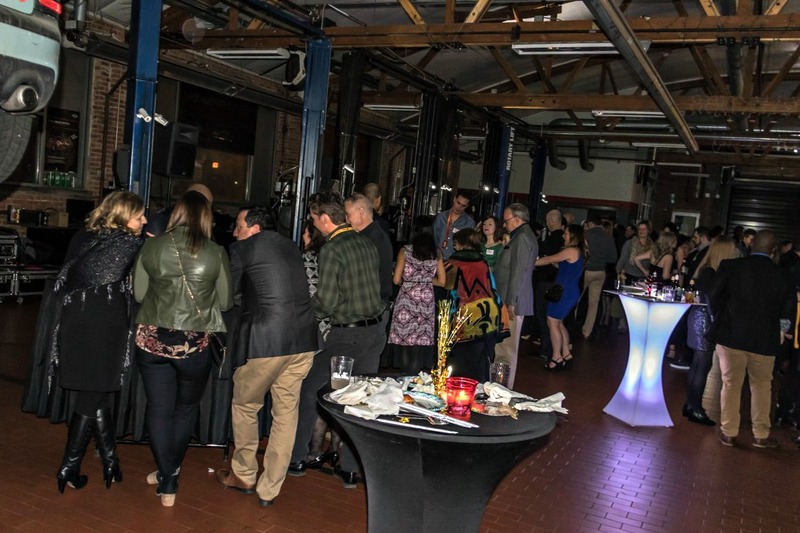 We changed our name to German International School Chicago (GISC) in 2014, because it more accurately presents our vision with respect to curriculum, staff, students, their families, and our larger community." 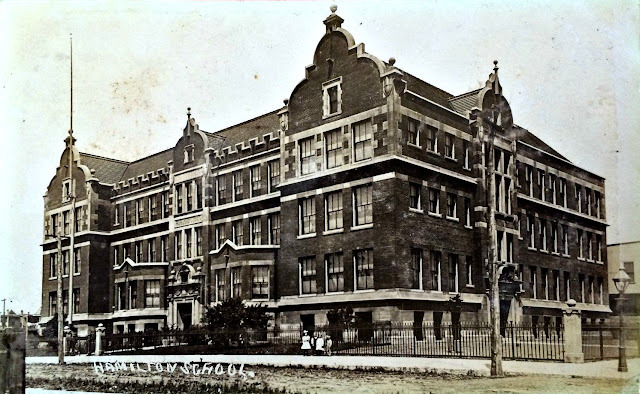 [Charter School] and a vacant factory before that." 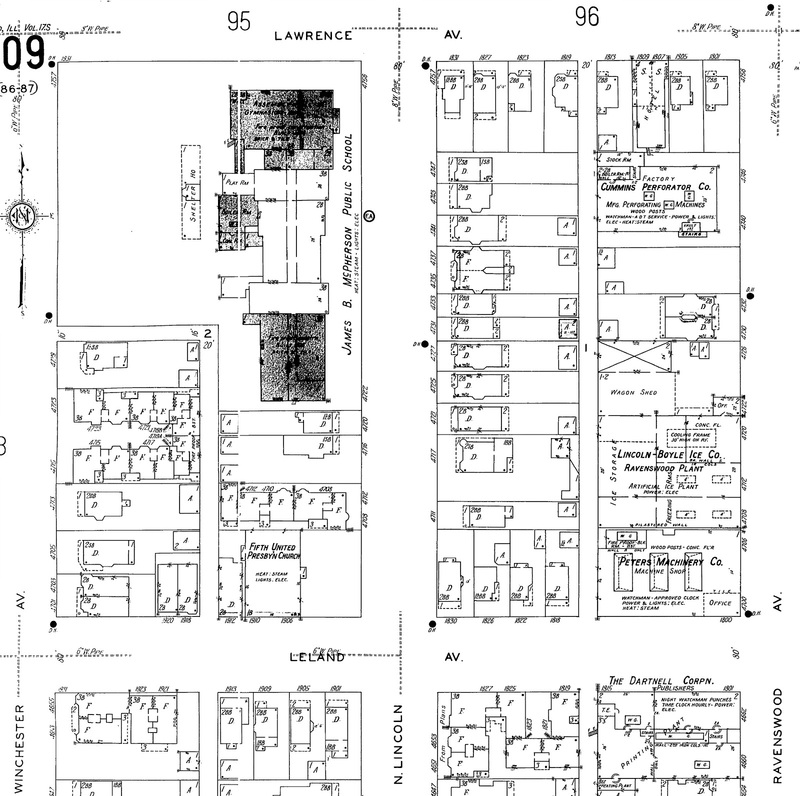 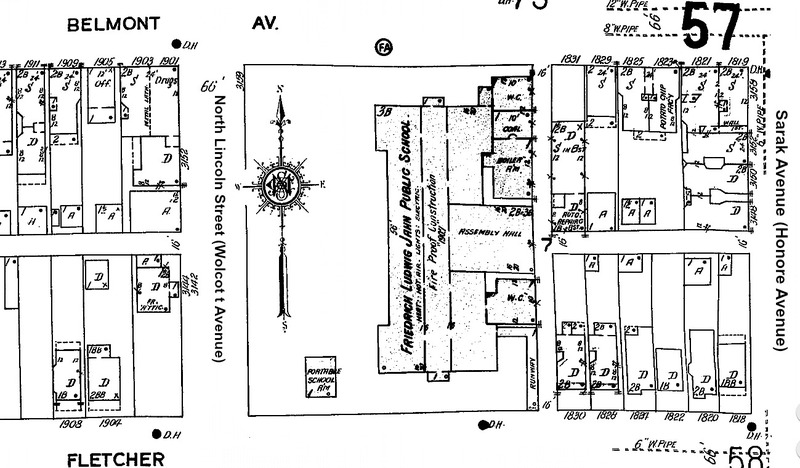 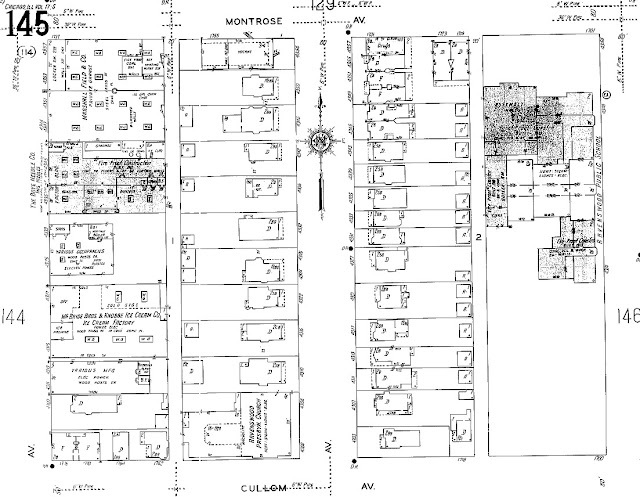 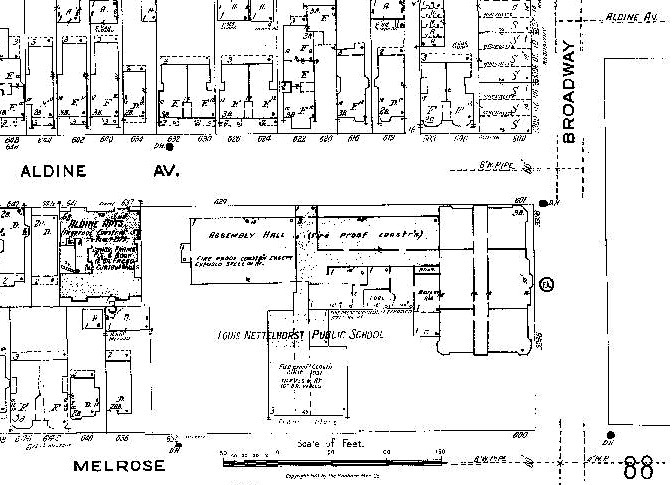 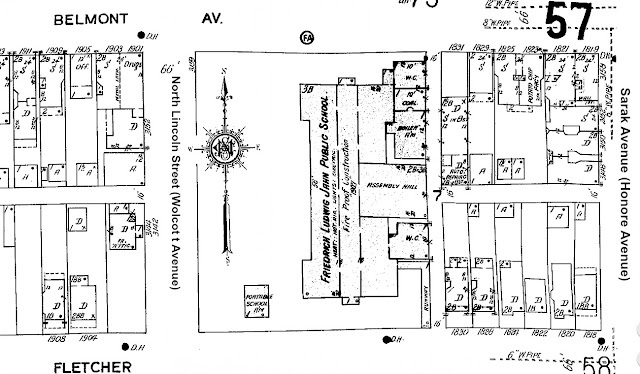 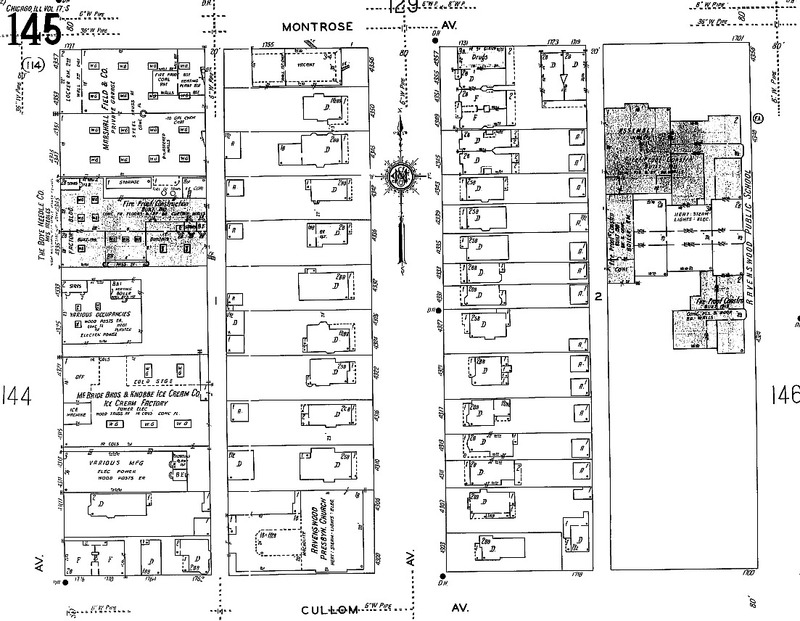 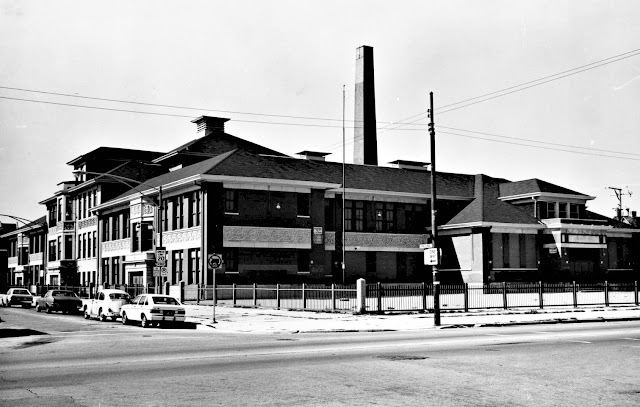 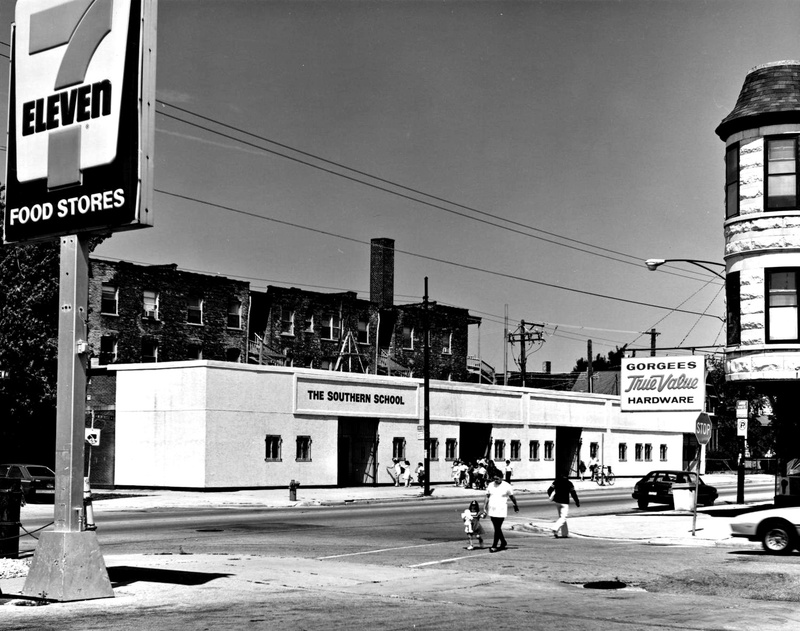 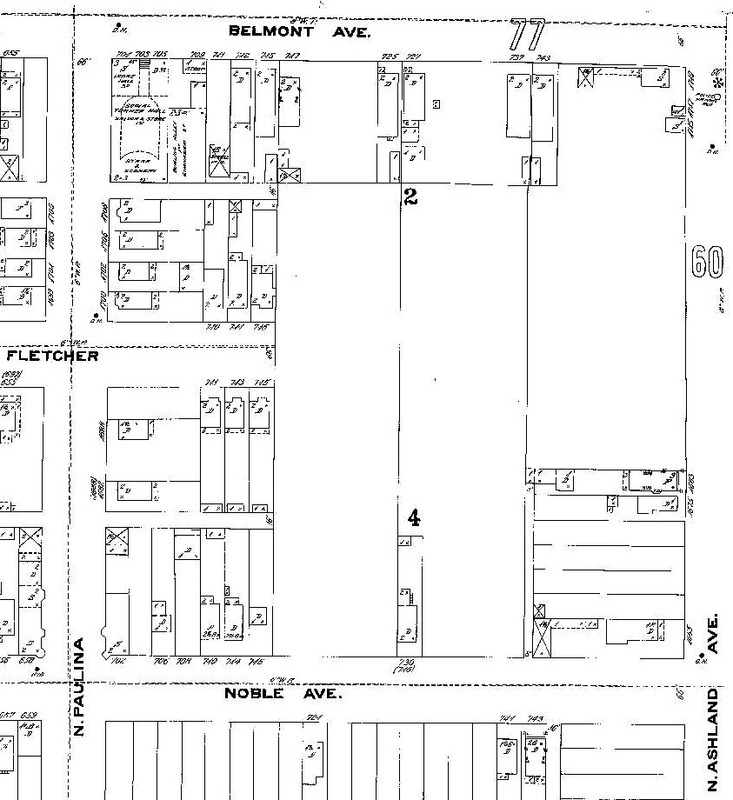 The factory, she mentioned, was a refrigerator plant and confirmed by a 1950 Sanborn Fire Map. 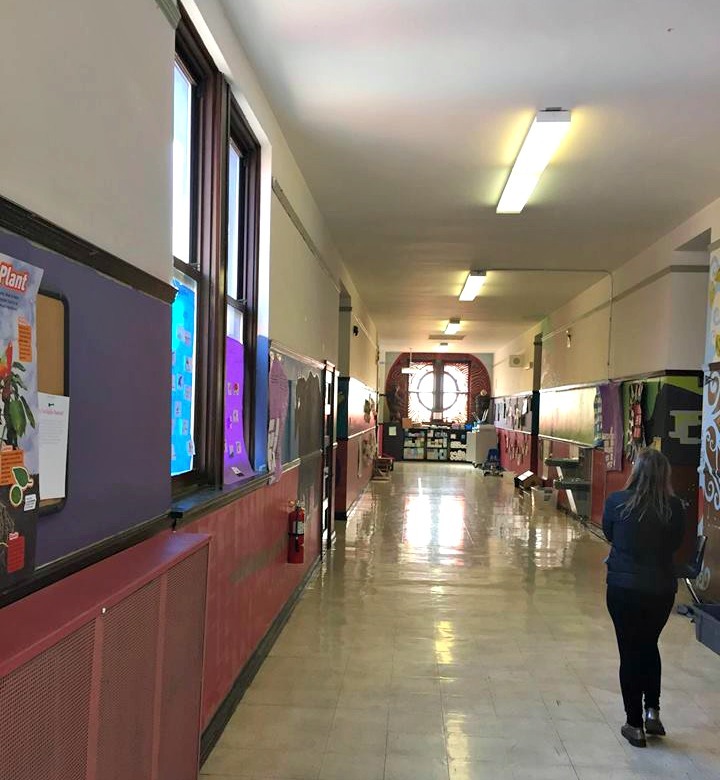 Coonley has experienced an influx of students in recent years. Though the school currently has just one seventh-grade and one eighth-grade class, lower grades have three or four classes each. 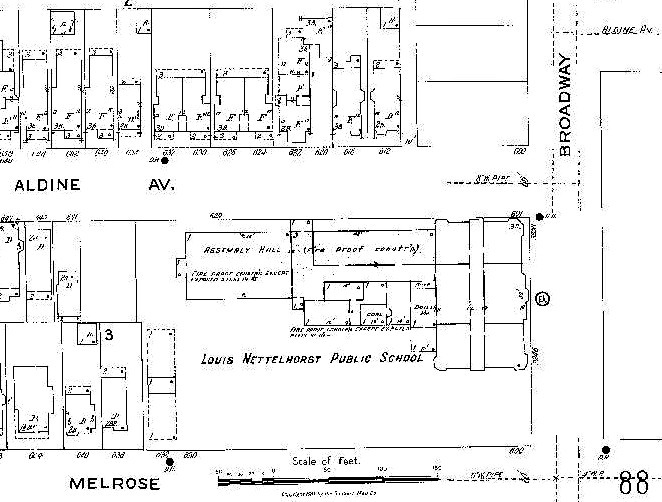 Coonley's existing building only has 22 classrooms according to DNAinfo. 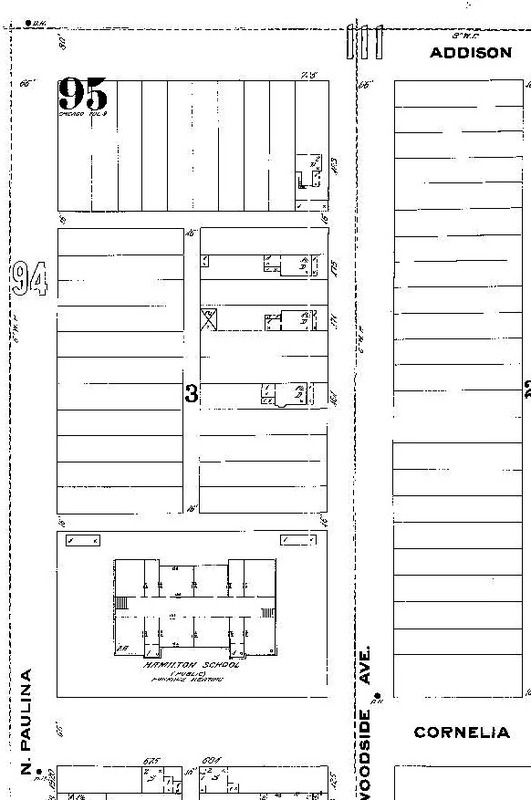 The three-story annex funded with Tax Increment Financing dollars will contain 12 classrooms, a kitchen and multipurpose room. The Center’s roots trace to 1972, when it was known as Universidad Popular, a groundbreaking educational program that predates a relationship with City Colleges of Chicago, and offered multi-level English instruction, along with assistance in immigration law, local politics and tenants rights for its largely Latino student body according to an online news source called the Chicagolist. 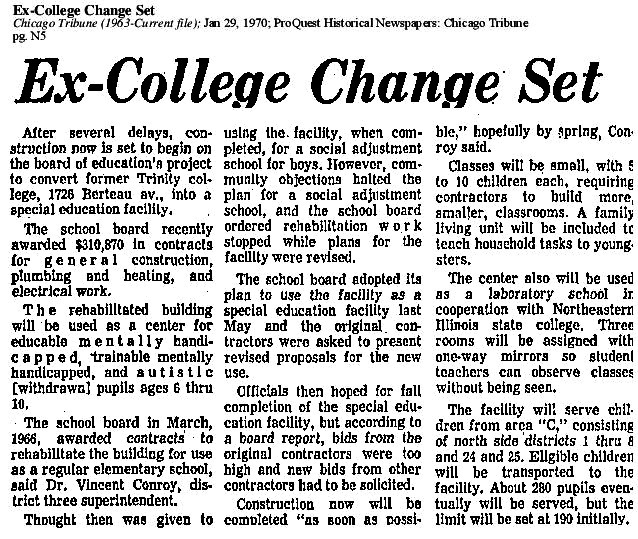 According to the Chicago Tribune, the Public Building Commission of Chicago built the 14,200- square-foot facility in 1983. 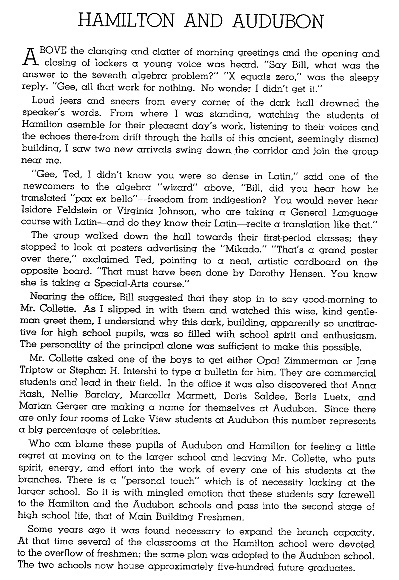 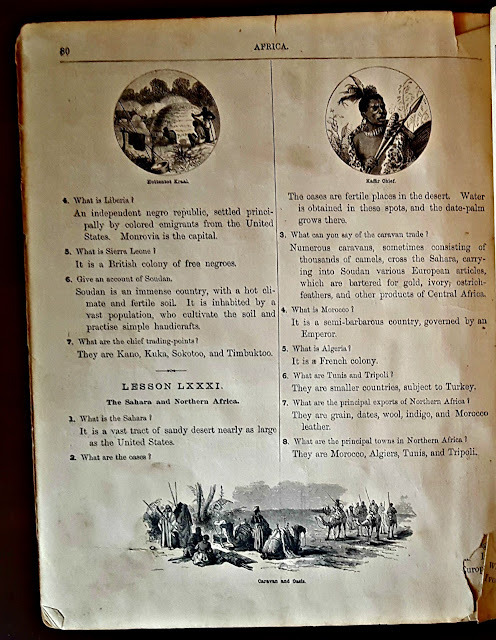 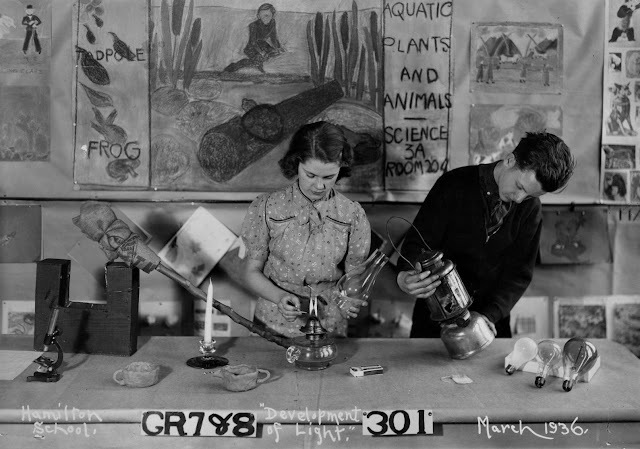 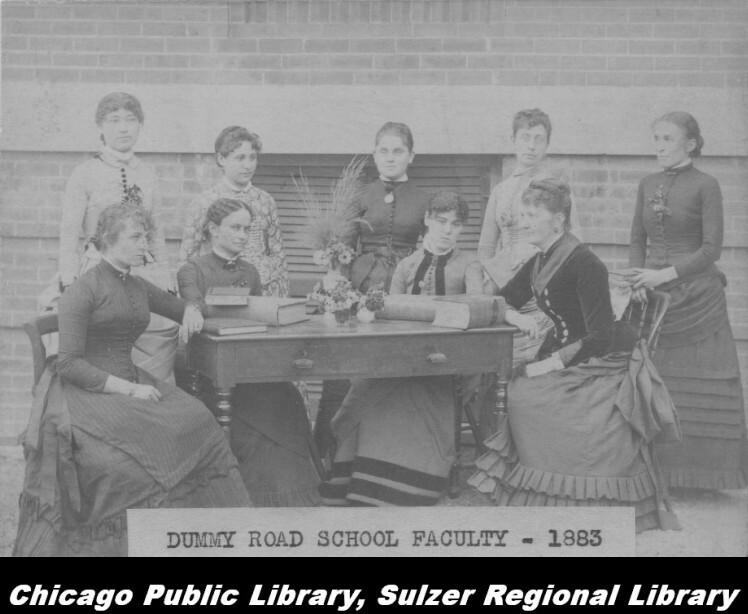 Universidad Popular's founders had experience with the Highlander Folk School in Tennessee and Jane Addams Hull House in Chicago-used that to promote adult literacy. 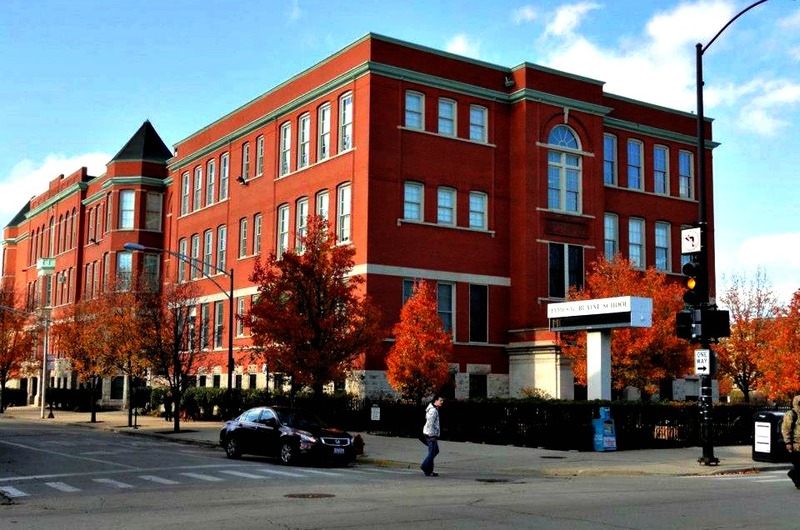 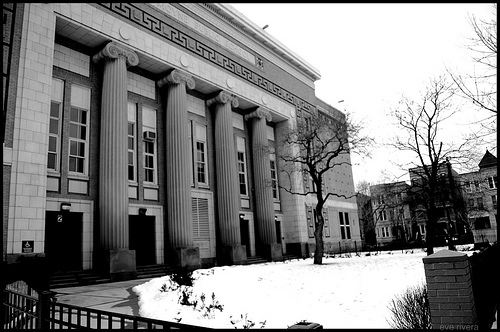 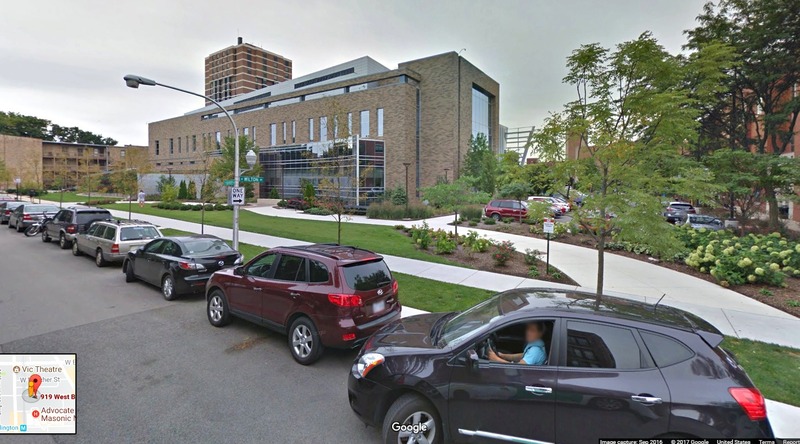 The City Colleges of Chicago sold the building to developers for seven million dollars. 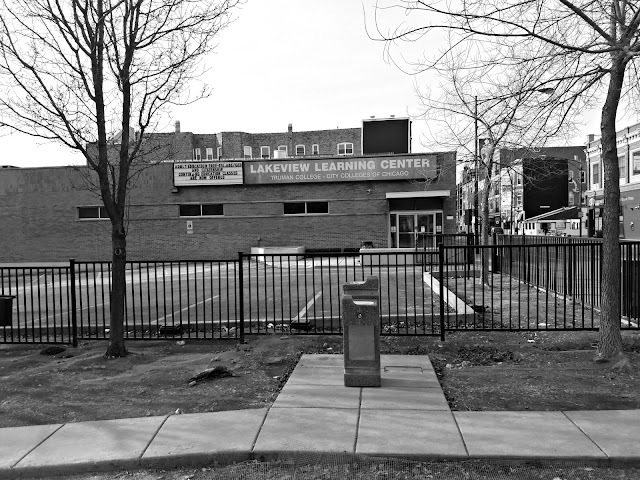 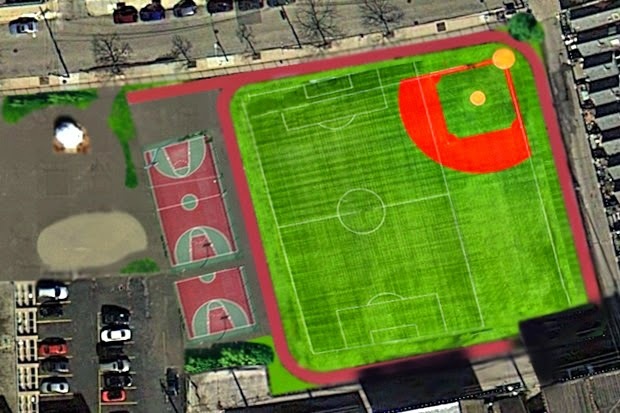 All serves will be housed in Uptown in the Truman College that is part of the City colleges of Chicago network. 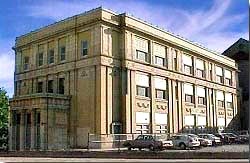 This building is planned to be demolished as of 2018 for a new development. 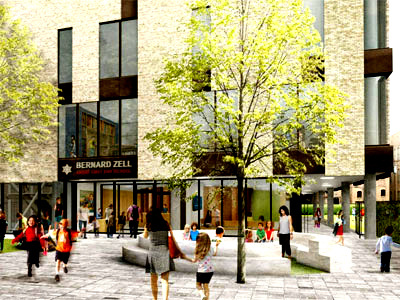 This new building will also coincide with the eight-year long CTA Belmont Elevated Overpass project. 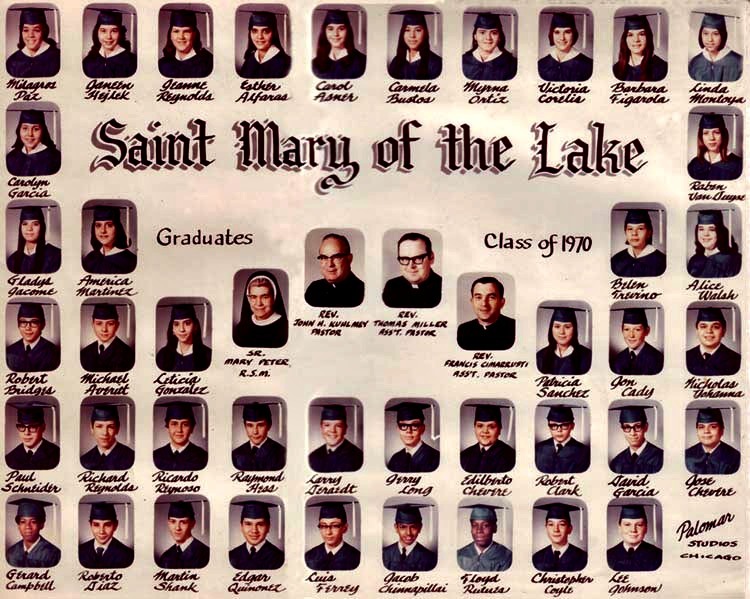 St. Mary of the Lake Parish was established by His Grace, Archbishop Patrick A. Feehan in September, 1901. 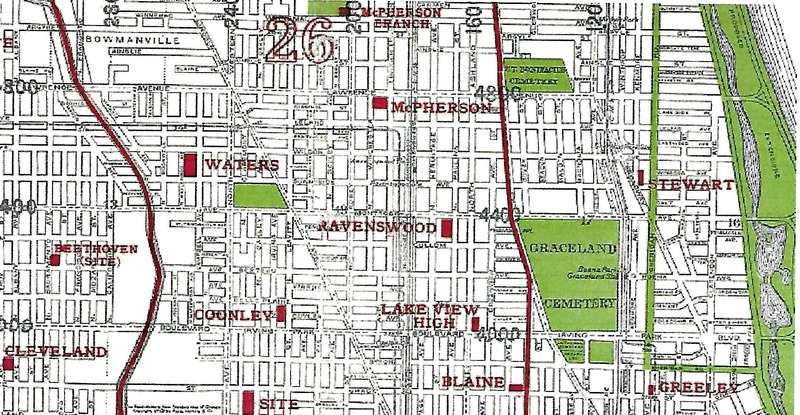 It comprised the territory known as Buena Park, and was bounded by the lake on the east and by the following streets: on the north by Wilson Avenue; on the west by Racine, Clark, and the east line of Graceland Cemetery; and on the south by Waveland Avenue. 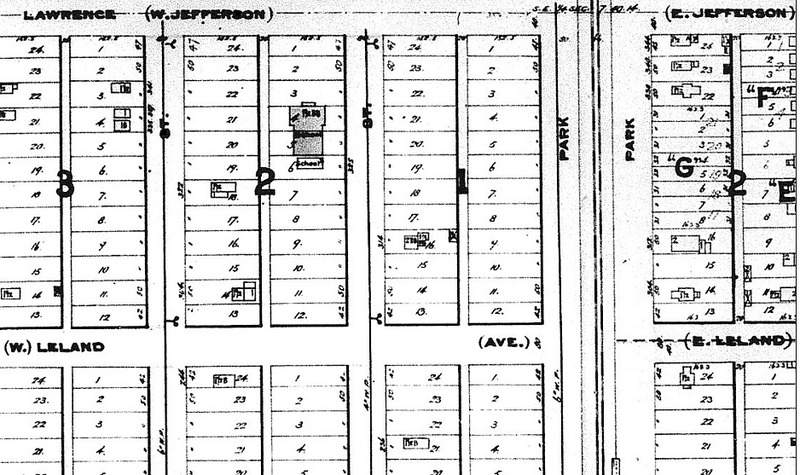 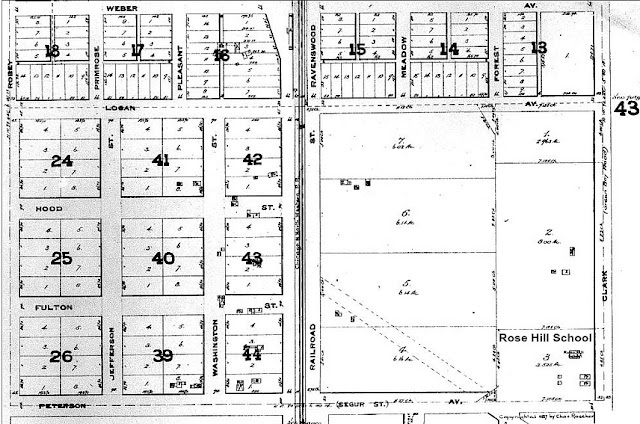 In 1901, Buena Park was sparsely populated and the lakeshore reached as far west as Sheridan Road. 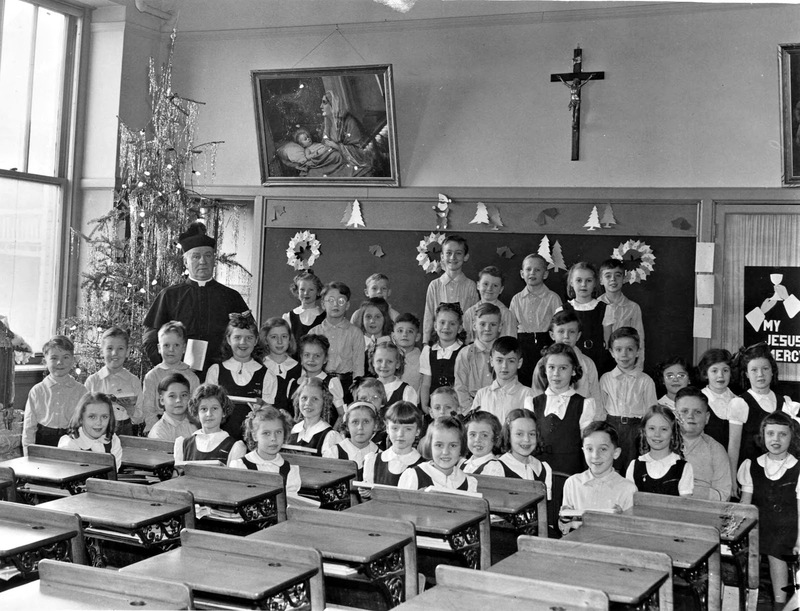 There were only sixty families identified as Catholics who attended church when Father John J. Dennison was appointed to organize the parish. 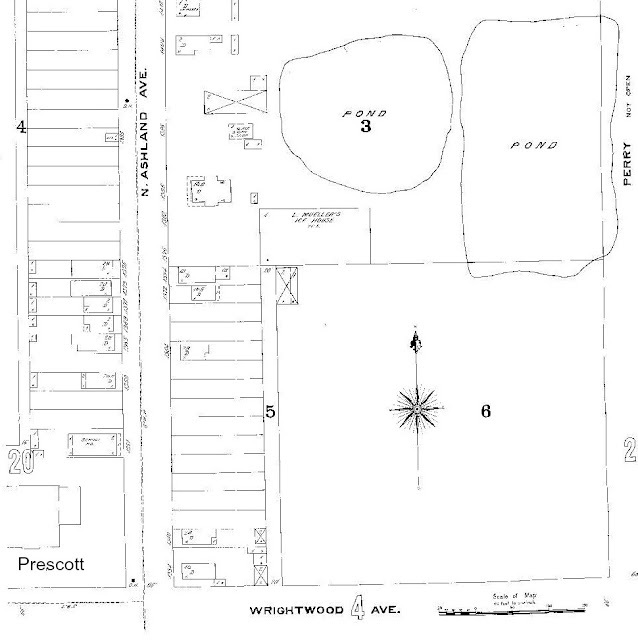 Finding a stable location for a church in the district was a difficult task. 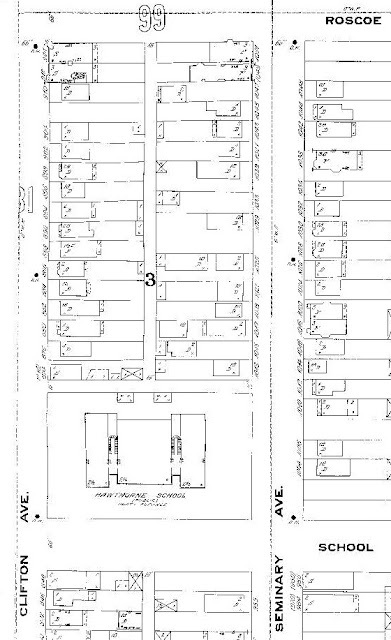 Vacant property was abundant, but prices were prohibitive and finally after a month of searching, one hundred feet of property was secured from Mr. Adam Schneider and another gentleman. 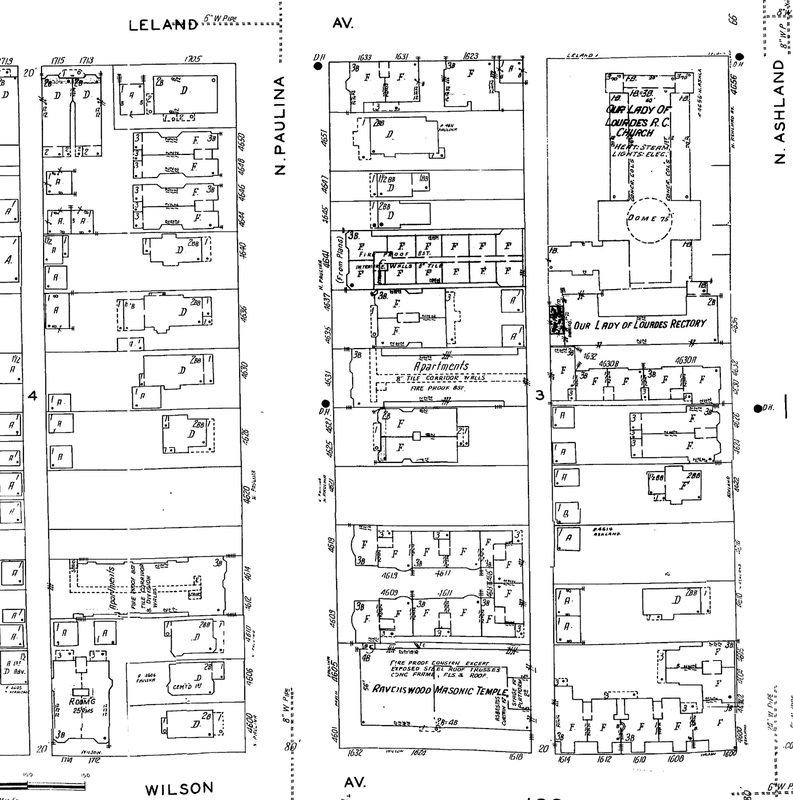 Plans were formulated for a new building, which was to be a combination church and residence. 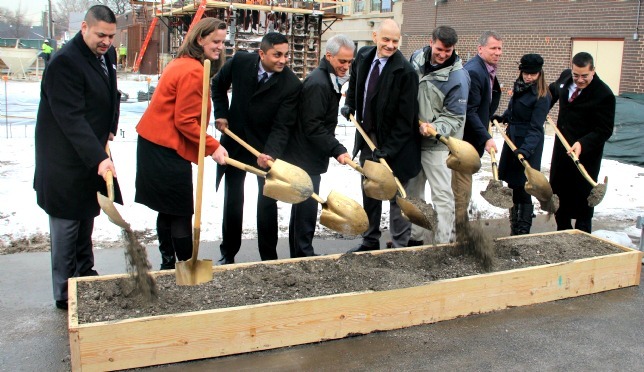 Ground was broken the 20th of November, and the new building was begun almost immediately. 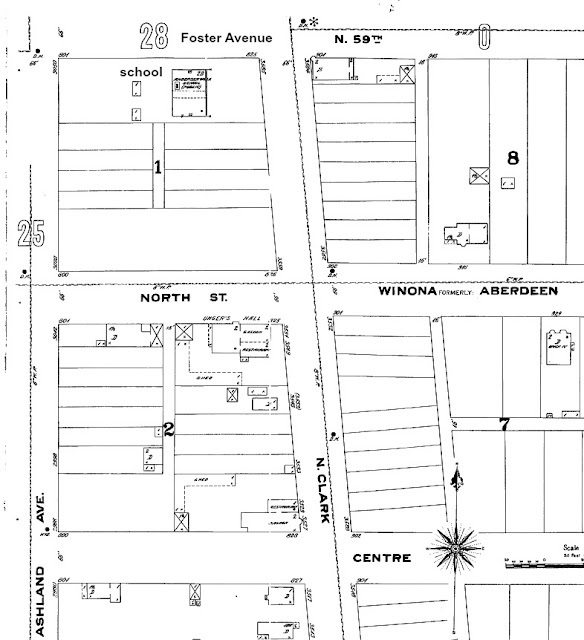 In April 1913, Father Dennison announced plans to build a new church and rectory at the northwest corner of Buena Avenue and Sheridan Road. 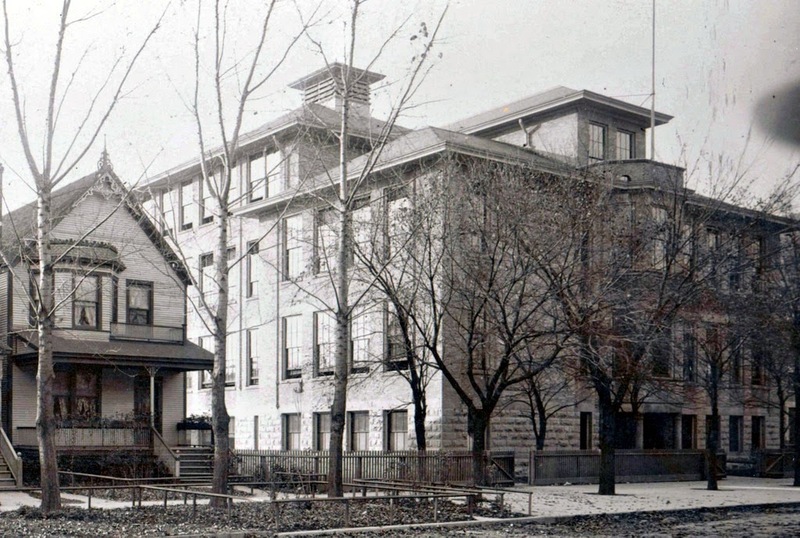 Before construction could begin, the Robert A. Waller home - which stood at 4210 North Sheridan Road - was purchased and moved to 1026 West Buena Avenue which was south of the church on Buena. 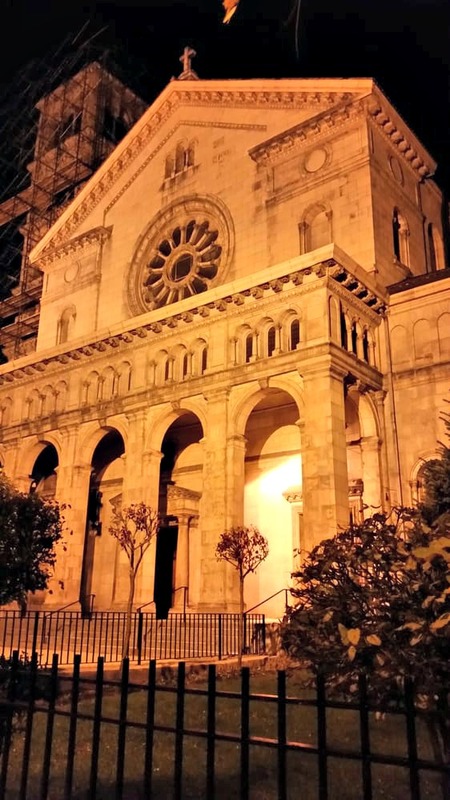 The church was designed by Henry J. Schlacks - a Chicago native - who had already made a name for himself as a church architect despite his young age. 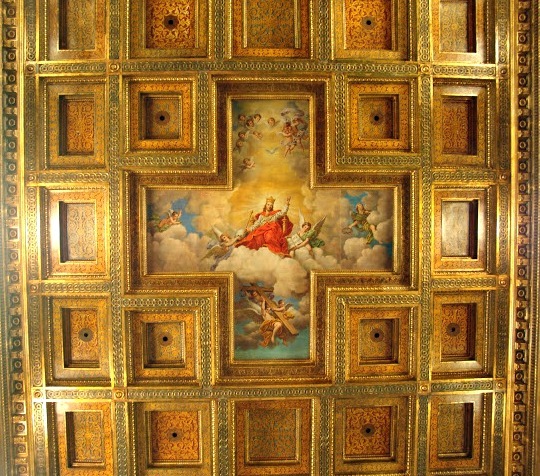 He chose the Italian Renaissance style of architecture, patterning the structure after the Roman churches of St. Paul Outside the Walls and St. Mary Major. 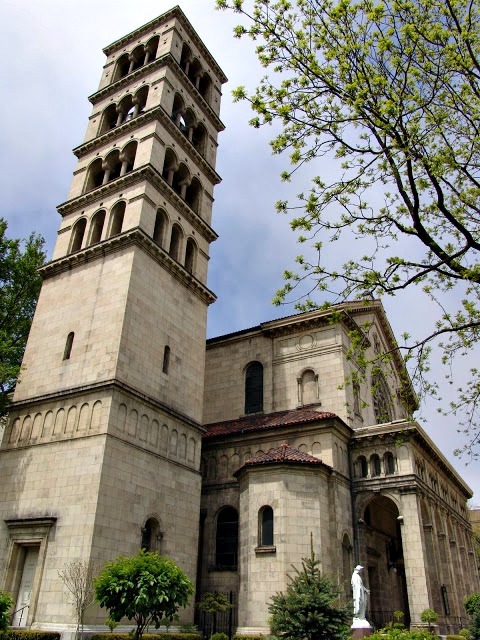 The freestanding bell tower is a replica of the campanile of St. Prudentiana Church in Rome. The altar's pulpit and altar rail were all the creation of Mr. Schlack's genius and enterprise. The edifice was constructed at a cost of $127,000. Archbishop James E. Quigley laid the cornerstone of the present church on June 29, 1913. Archbishop Mundelein dedicated the church on May 20, 1917. 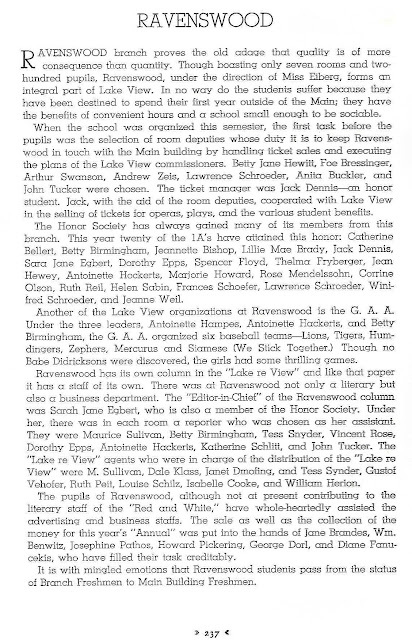 At that time, the parish membership numbered 600 hundred families. 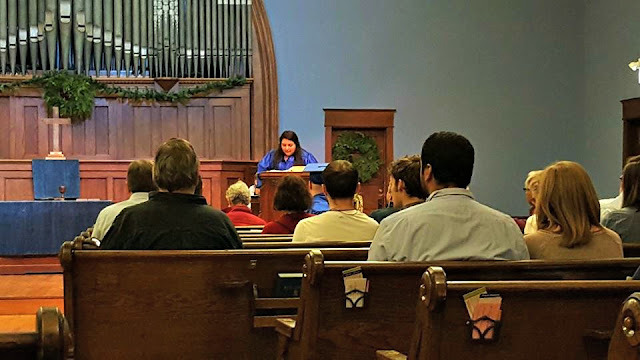 - with more photos of the church. 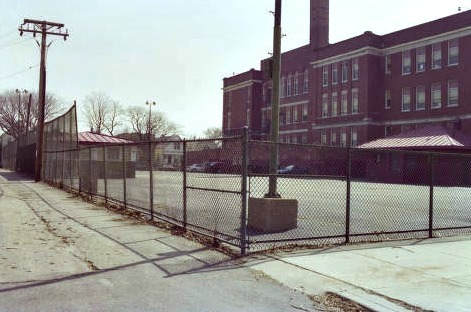 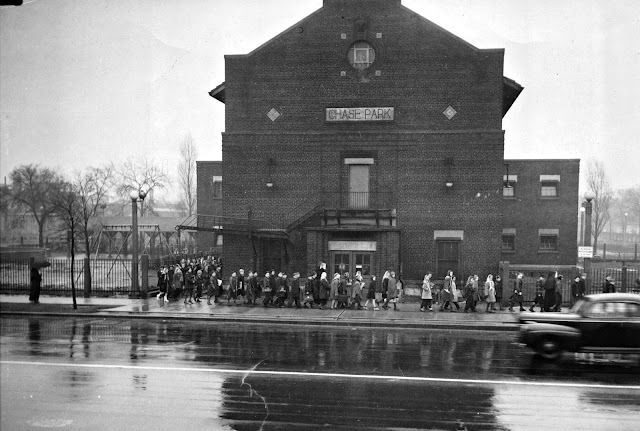 While construction proceeded on the new church, ground for a new school was broken on the east side of Kenmore Avenue, just north of Buena Avenue. 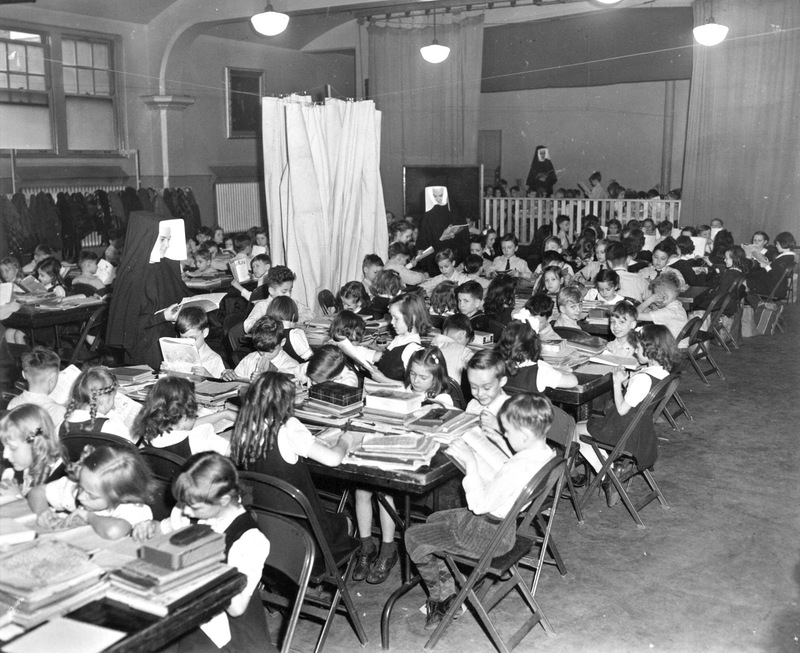 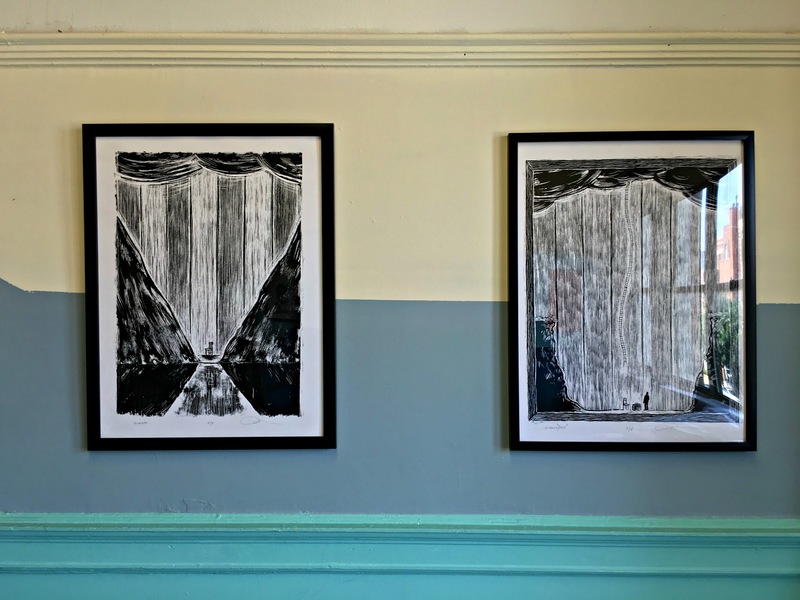 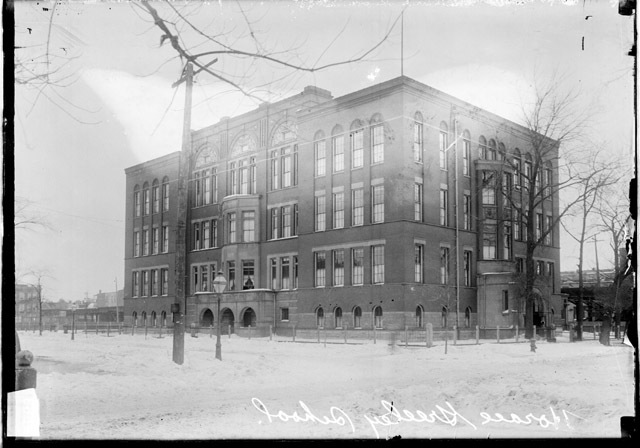 The school is the work of a young architect - Mr. Joseph W. McCarthy, a New York native - who arrived in Chicago in his early years and grew up in Chicago and who was himself a pupil in the parochial schools administered and taught by the Sisters of Mercy. 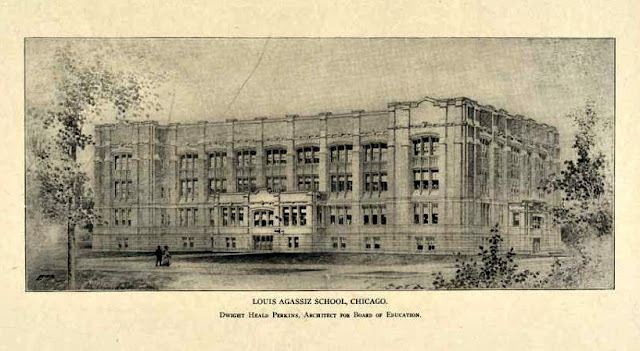 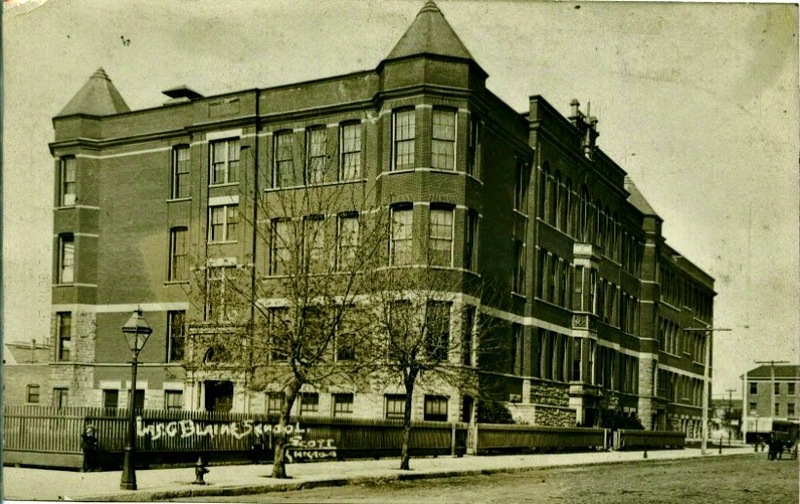 The school - a two-story building with six classrooms on the second floor - was unsurpassed by any schoolhouse in Chicago at that time in terms of its lighting and classroom arrangement. 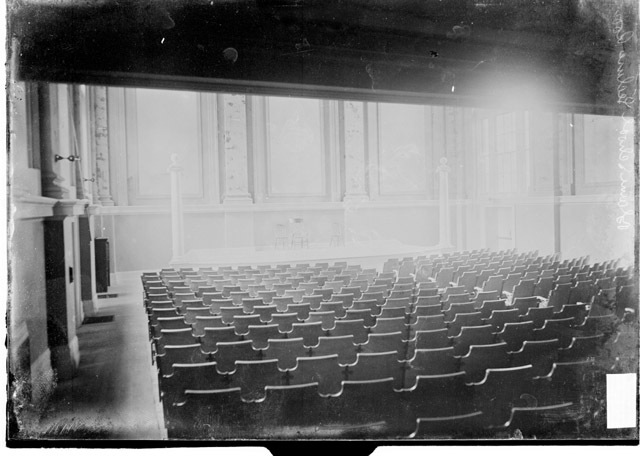 The first floor has a very commodious and artistic auditorium which accommodates between six and seven hundred. It has a very large stage with an asbestos fire curtain and two sets of scenery. The whole scheme was a monotone in silver gray. 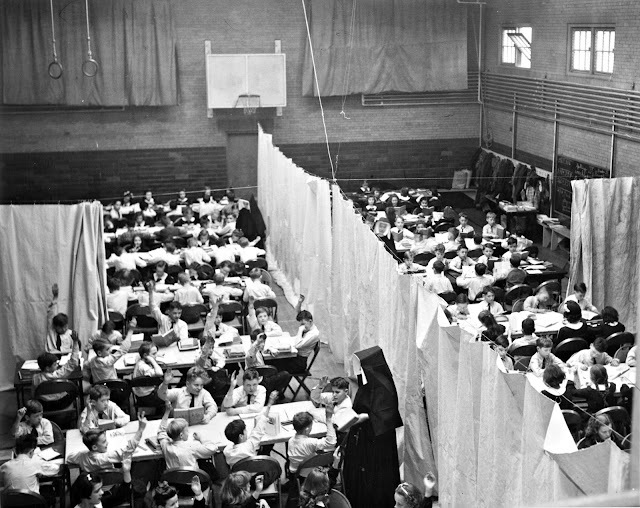 It had a modern method of ventilation for that era that kept the halls and classrooms constantly supplied with fresh air. The children's toilets were equipped with the very latest improvements and were termed "elaborate" in finish and execution. 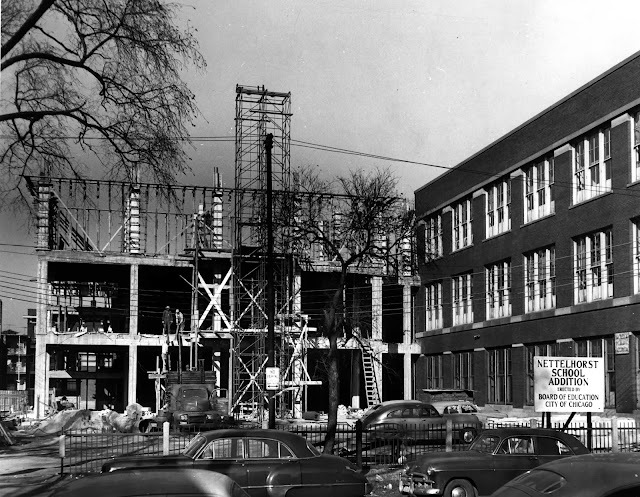 The building was considered absolutely fireproof. 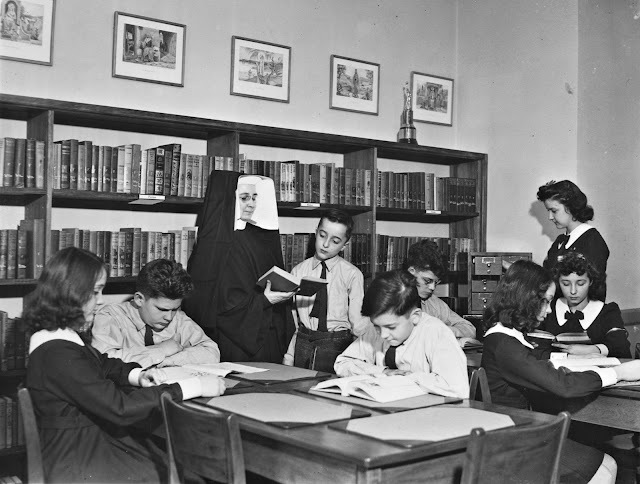 The Sisters of Mercy of St. Xavier's administered and taught at the new school. 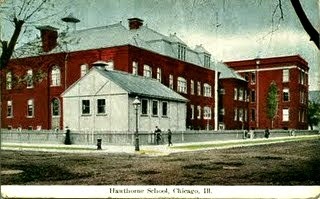 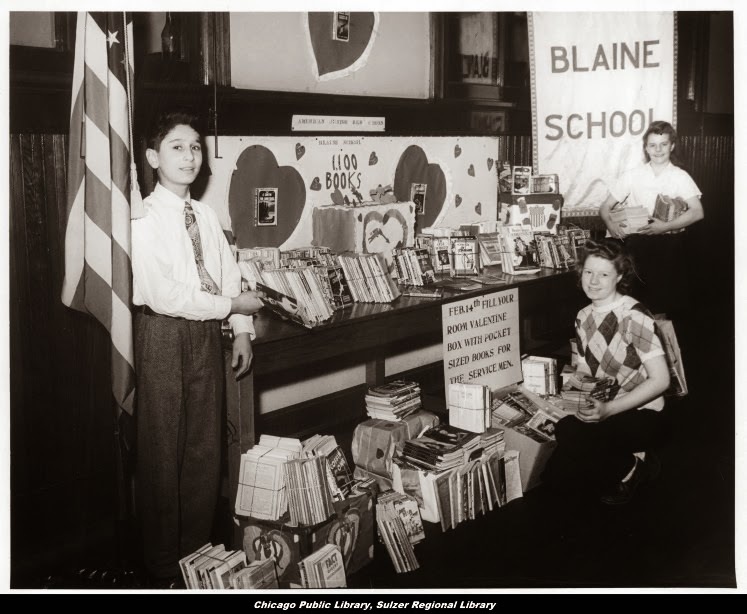 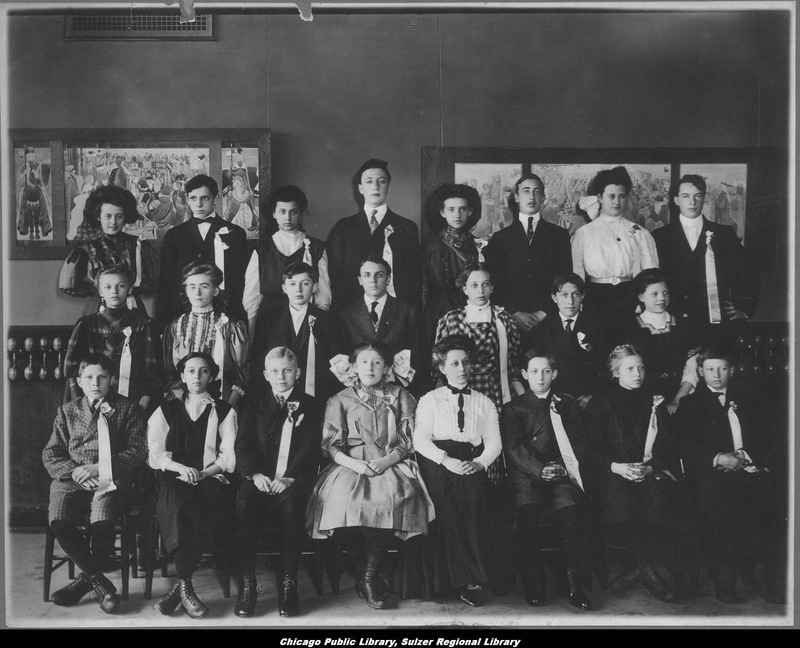 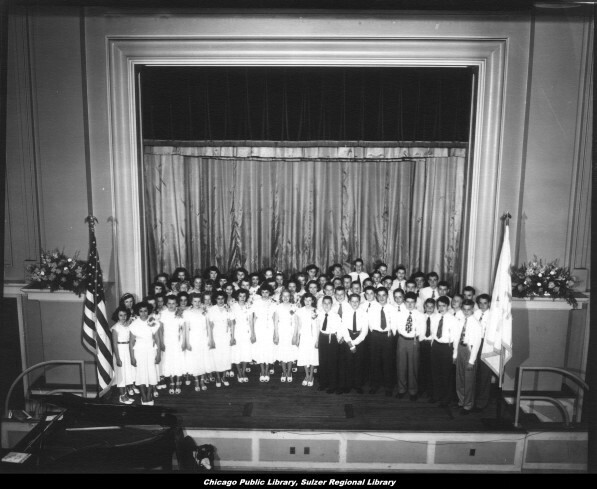 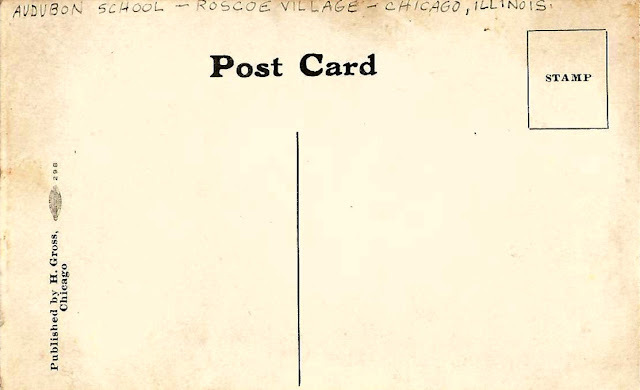 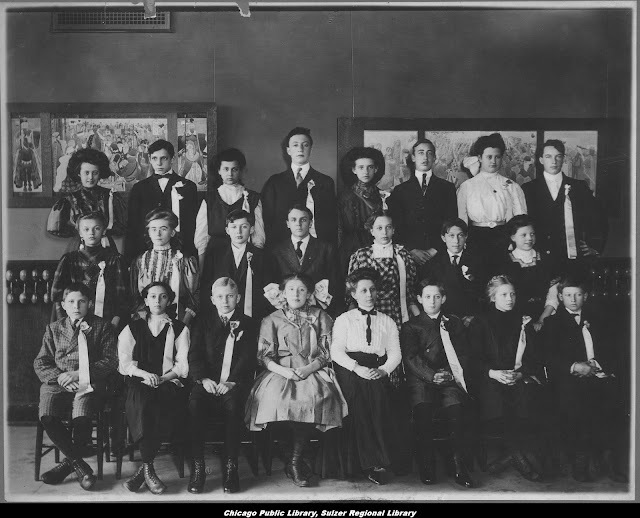 Their community had been instrumental in building the reputation of the parochial schools of Chicago and placing them on a plane that was equal - if not superior - to the public schools of our city. The influence of the sisters was immediately realized in the scholarship and conduct of the children, who were under the personal supervision of these good women. 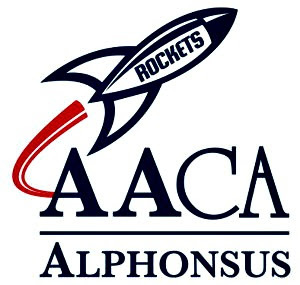 This school is accredited by the North Central Association (NCA) and the Independent Schools Association of the Central States (ISACS). The Chicago City Day School is an independent, elementary school with an academic program that is rigorous yet sensitive to the individual needs and abilities of children. 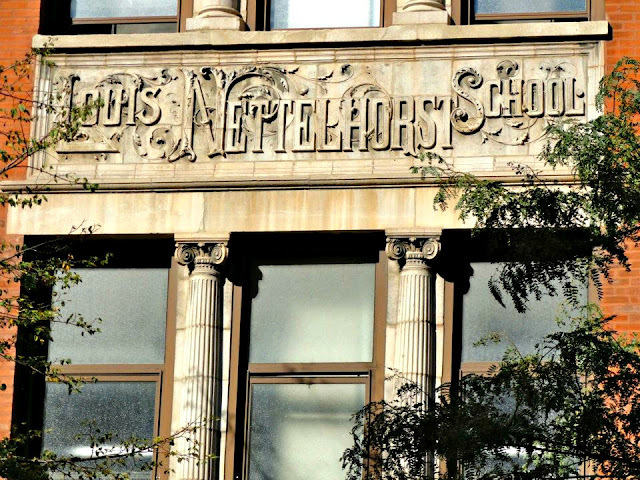 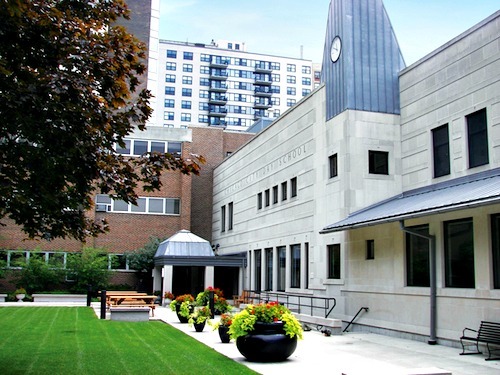 The Chicago City Day School is accredited by the North Central Association (NCA) and the Independent Schools Association of the Central States (ISACS), a membership organization of more than 200 independent schools from 15 states of the Midwest region. 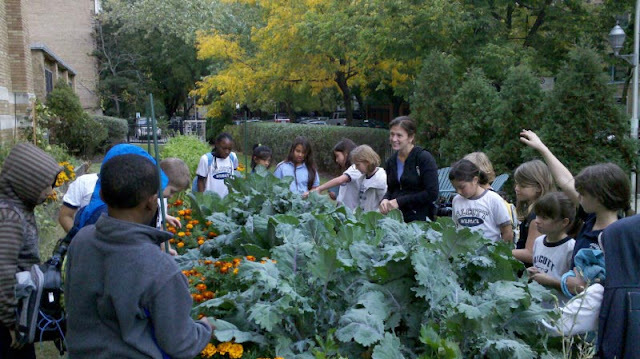 Rigorous, highly participatory programs challenge youngsters to become competent, engaged learners. 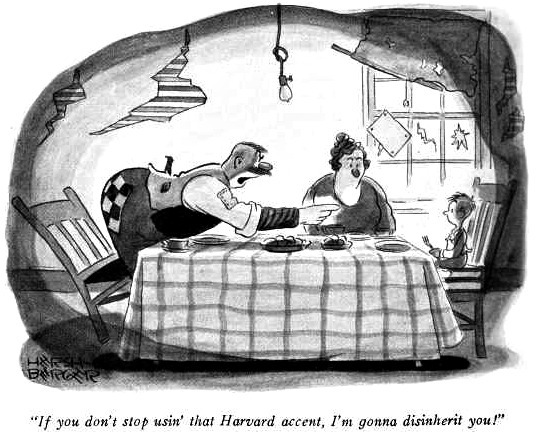 Hard work is expected. 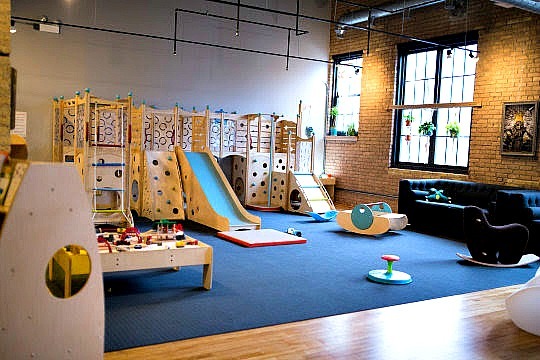 Risk-taking is encouraged. 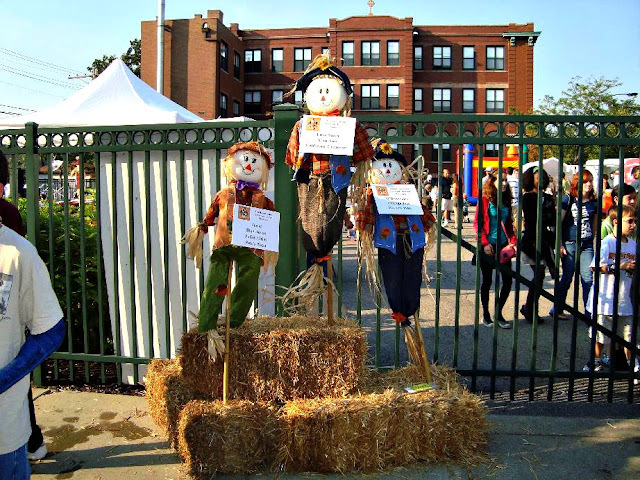 From junior kindergarten on, City Day students are encouraged to develop critical thinking skills and to work effectively both independently and collaboratively.